My inspiration flows. I’ve been exhausted from the creative development with Christy, but it’s going very well and is a very satisfying process. My brother took Jesse away for the weekend so Paula and I have been having a mini-home-honeymoon and it’s bliss! It feels like we’ve rediscovered our love yet again and it’s so nice to know that whenever we’re without child and make an effort to focus, we seem to tune into each other so well. How to maintain romantic love with a three year old hanging around? It seems to be truly impossible. Yesterday we ate bought food for every meal so we didn’t have to cook, and hung out in bed for most of the day, talking, reading, and doing all sorts of intimate stuff. 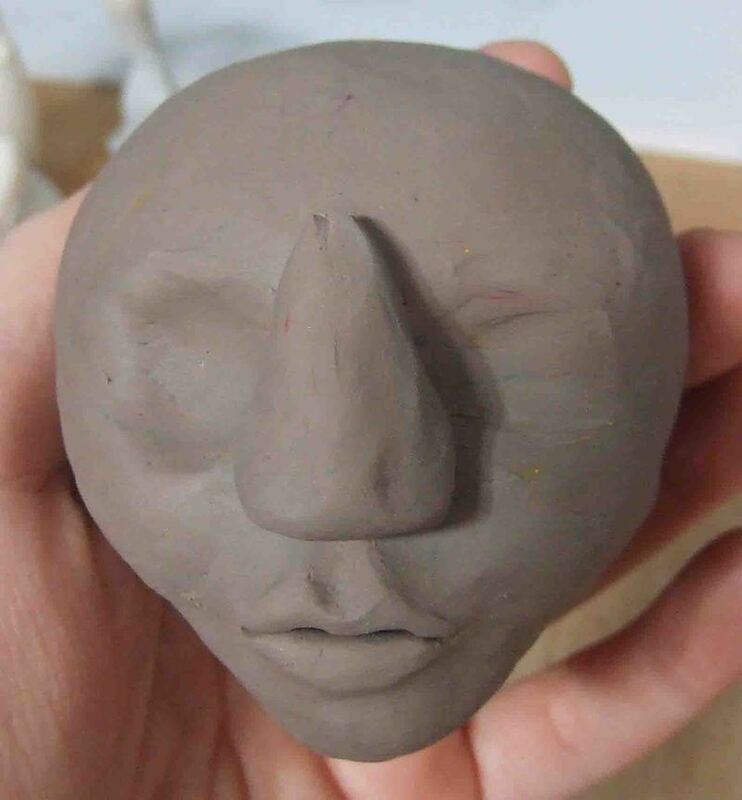 Today I felt revitalised from the break, and after a leisurely start I pulled out the clay I bought a while ago, grabbed a few utensils from the kitchen, and set about sculpting a head. It’s not too bad – only a first draft and I don’t expect to actually use it, but for a first go I’m very happy with it. 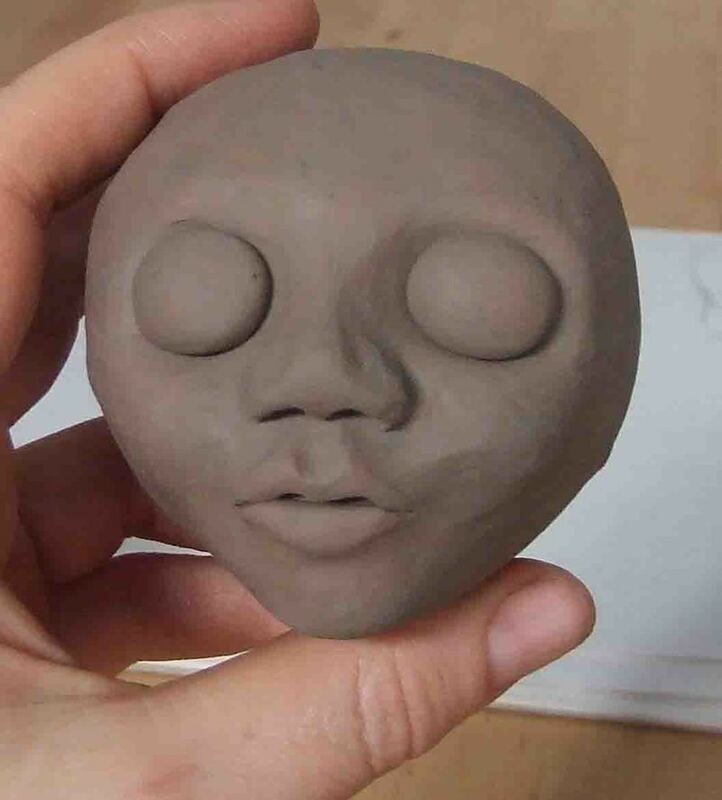 For my next attempt I’ll make her top lip a bit larger, give her a slightly bigger forehead and set the lower half of her face further forward. In the meantime I’ll experiment with paint effects, and also test to see how strong the clay is. 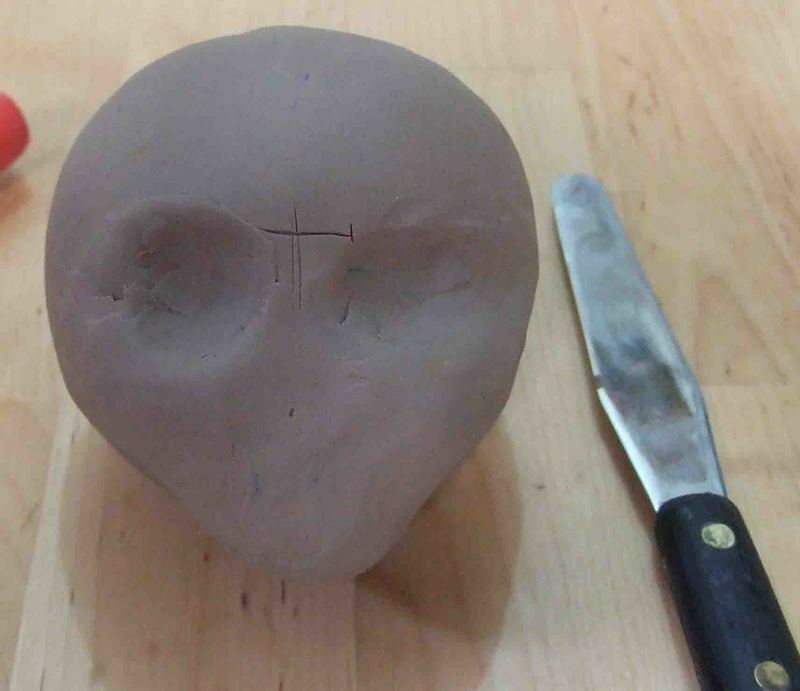 I think I’ll probably end up using the clay to sculpt, then use that as a mould to create my final head from Fimo. And what’s it all for? 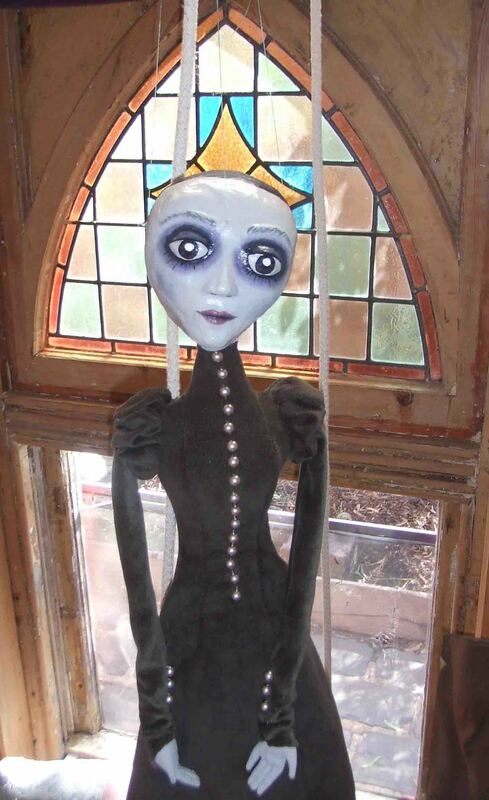 I started thinking about a new puppet show, one with gothic overtones. 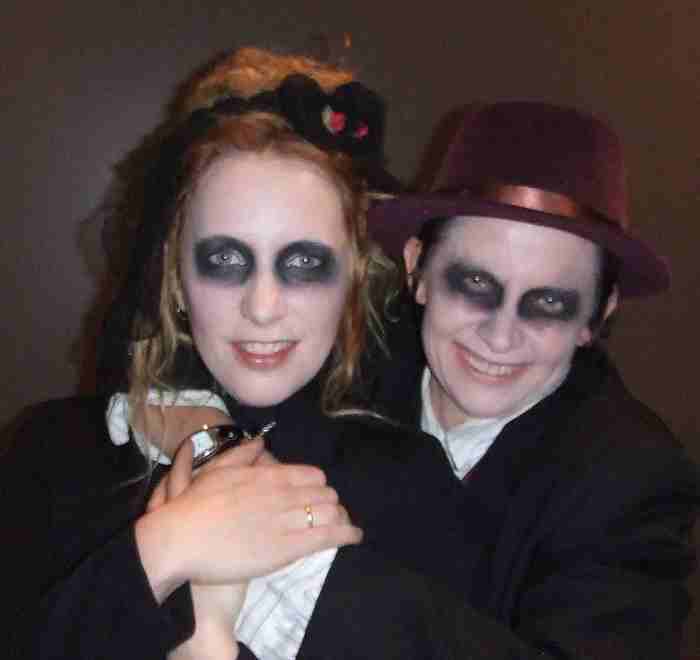 I’ve long been a big fan of The Addams Family and have my own gothic years when I was a teenager. 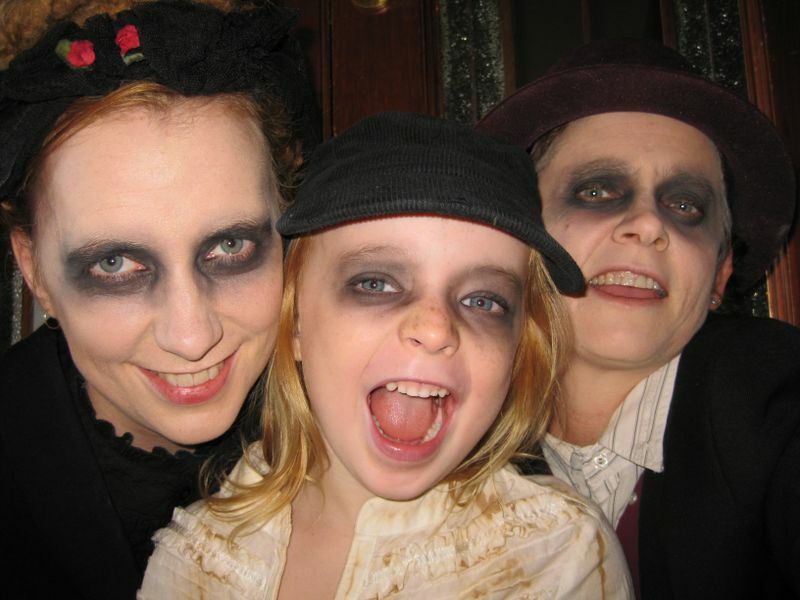 Although I no longer dress gothic, that part of me hasn’t died and it would be lovely to express it in another way. 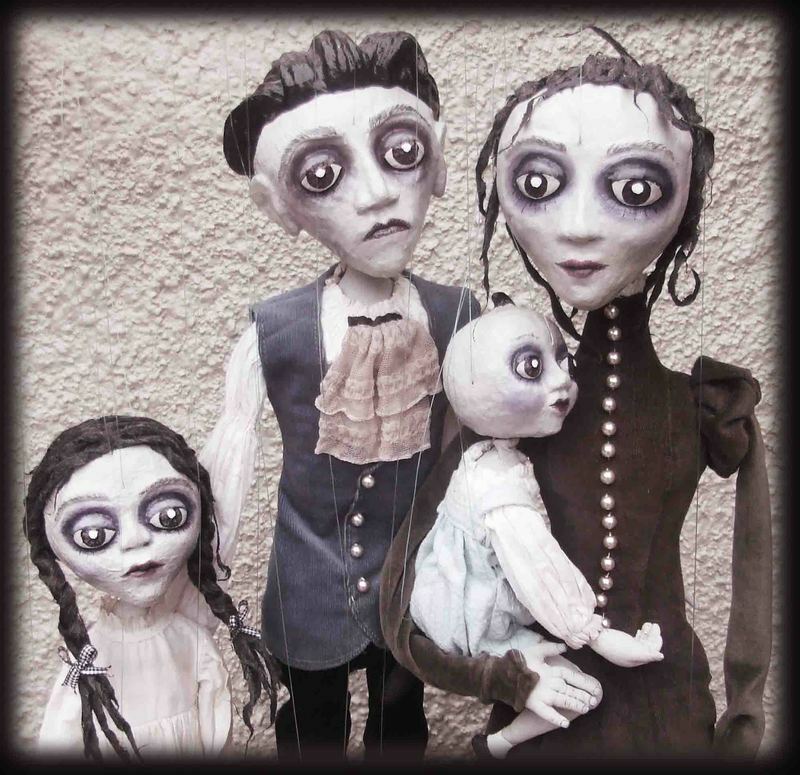 I’ve dreamed up three characters, all to be marionettes – a young mother, her daughter and her father – who will live together in a suitably gothic styled cottage. I’m turning a few potential story-lines around in my head but haven’t settled on one yet. 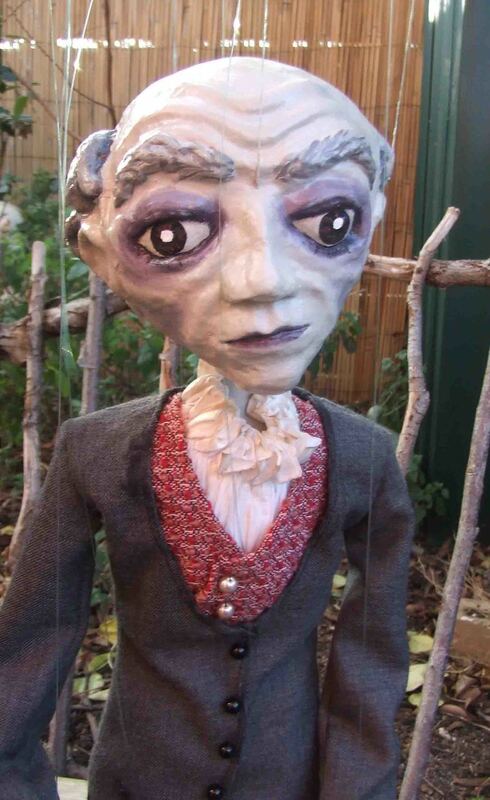 I’m deliberately making these puppets larger, so that they can be seen by a bigger audience. One of the limitations of Bronwyn is her small size, which means she’s no good for the big stages I sometimes perform on. Bronwyn was always meant to be a show-in-a-suitcase, to make it easy for me to bring her when travelling. This show I think will be much larger, which opens up the possibilities but means more gear to bring to a gig. My lovely friend Kelly Parry has moved to town, and we are indulging in all sorts of swaps. I’m happy I’ve got computer skills and was able to help her buy and set up her mac. I’m also lucky because her little boy Massi is addicted to Sol’s rice bread that you can buy in Mullumbimby but not Melbourne – and I have managed to make a very nice replication of their bread, much to Massi’s delight. Massi’s also interested in private trapeze lessons, right up my alley. So I have plenty to offer them in our barters, and am putting Kelly’s wonderful creative skills to good use. She’s booked in for a brainstorming session next Saturday to help me concieve stories and develop characters for my new show. Today after I made the sample head I traced around it to get the size, then fiddled around with a pencil til I reckoned I was happy with the proportions. So now I’ve made the pattern sketch for the young mother. She’s almost as tall as Jesse, but much skinnier. I’ve done a few sketches of her dress which I’m not happy with, and I tried out another idea on top of my pattern sketch. Still not happy, but at least I can use it to get the sizes correct for her legs, arms, hands and torso. 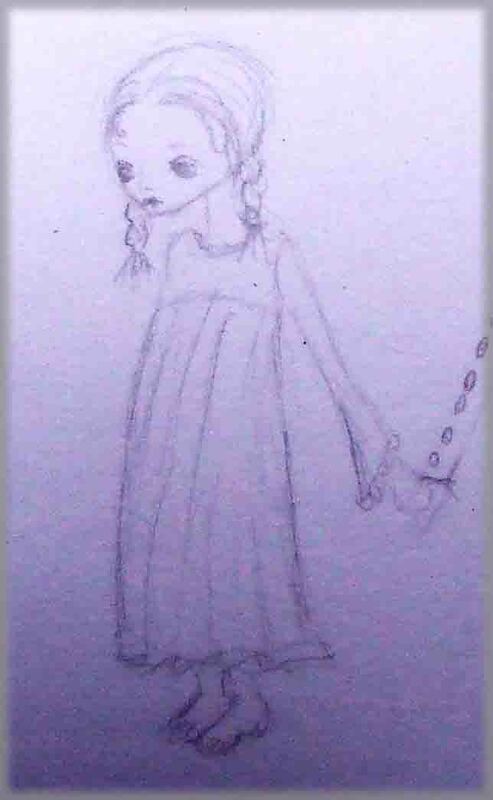 A couple of weeks ago I did some very rough character sketches, and here’s my first impression for the daughter. I’m a bit nervous to mention this show on my blog, as I don’t want to create any kind of pressure to produce the goods. At this stage I’m just dreaming and when I get a moment of inspiration I do a little bit of work on my characters and story ideas. This morning I finally pulled out my paints and had a go at painting my dummy head. I’d covered it with white gesso, and was going to leave that for the skin colour, but she looked like a Japanese Geisha girl – not the effect I was after. Instead I mixed up a fairly greyish skin colour and was happy with that. 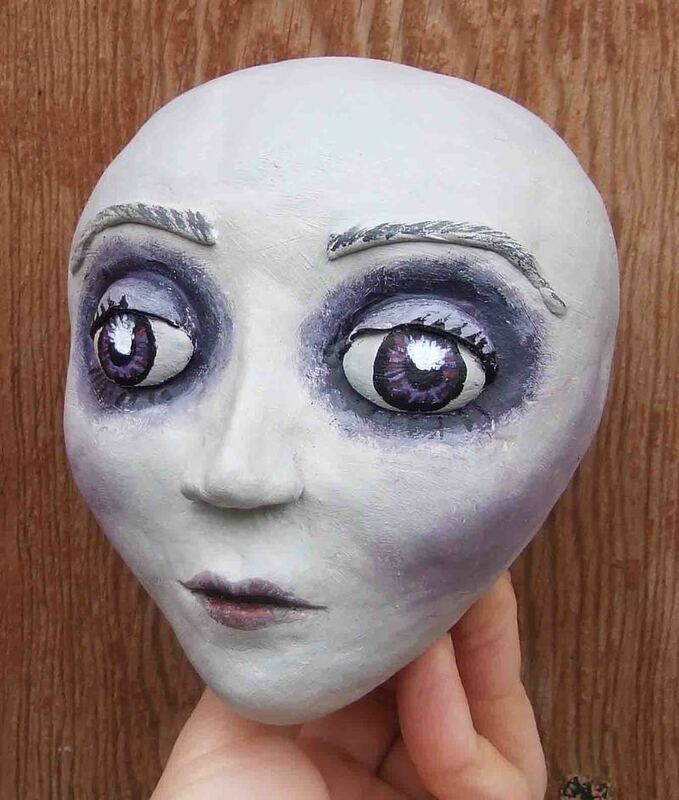 I think next time I’ll paint her top eyelashes differently, more like the lower ones – or I’ll actually glue on clay eyelashes so that they are three dimensional. I’m pretty happy with how she’s turned out. 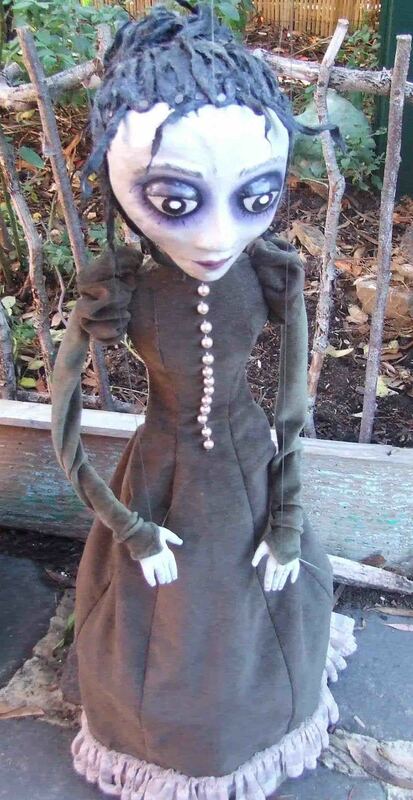 She has the right gothic effect, and the paint really helps along my somewhat amateur sculpting. Yesterday morning I met with Kelly Parry for our brainstorming session. It was fantastic – she has such a great process and I love her ideas. Here’s me thinking in simple terms because I’m stuck on the “puppet show” part of things, whereas she was urging me to make up backgrounds for each of the characters so we know who they are, what motivates them and why. And of course they started to become real, and started to inform the plot. So far the gist of the story goes like this: Young girl lives with her mother and grandfather. She is gifted with the ability to see peoples’ dreams, and she sees her mother’s longing for more babies. Her father died when she was a baby, and her mother still grieves, wishing she could change the course of her life, and have the many children with him that she planned. The young girl urges her grandfather to use his skills in magic to cast a spell that will create a baby. He won’t. She creeps back and works the spell herself, producing a large egg. When her grandfather discovers what she’s done, he’s horrified, as she has made a mistake in the ingredients for the spell. What is inside the egg? 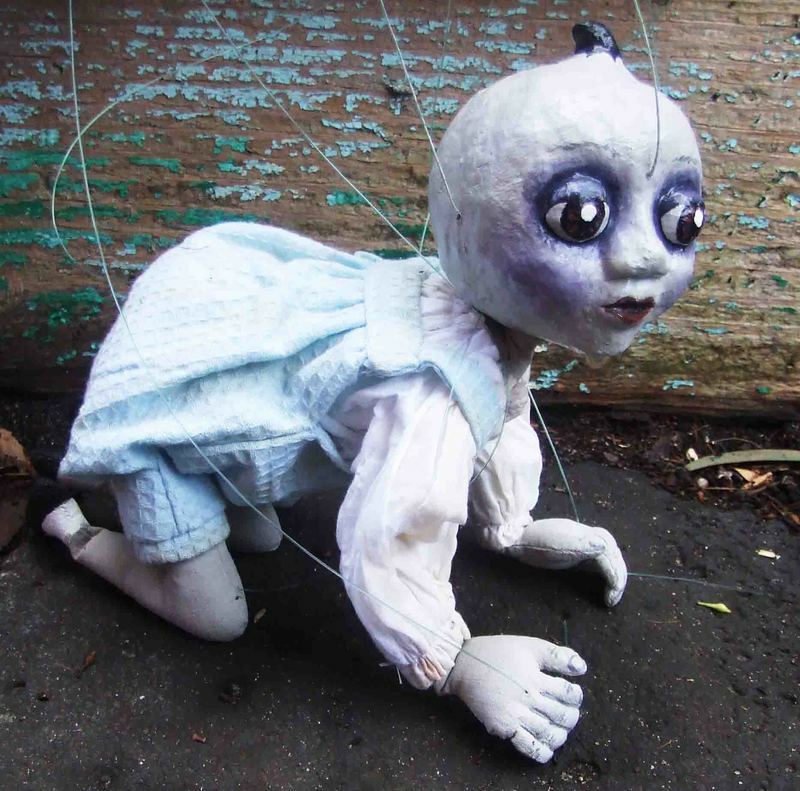 When it hatches, it is a very strange looking baby boy. They look up his strange characteristics and discover that he will never grow up, and that like the grandfather, he has magical abilities. The grandfather sets about teaching him the basics in magic, but he won’t teach the young girl as she lacks the gift. The baby is able to help the mother set aside her grief and discover joy. The girl becomes bitter and jealous – he has all that she wanted – the magic education, the playful side of her mother. She sets out to “feed him” to the dark forces that killed her father, but at the last minute she changes her mind and brings him back. For the first time she plays with him, experiences the joy he brings for herself, and understands that while she will never be all that she wants to be, she can benefit from what he has to offer. She uses her gift to search for her own dreams, to find who she can be, and discovers that she is, in many ways, like her father. That’s a rather simplified version of the plot, there are other threads and layers to the story, but that’s the general idea. It’s kind of complex but I think I’m happy with that. 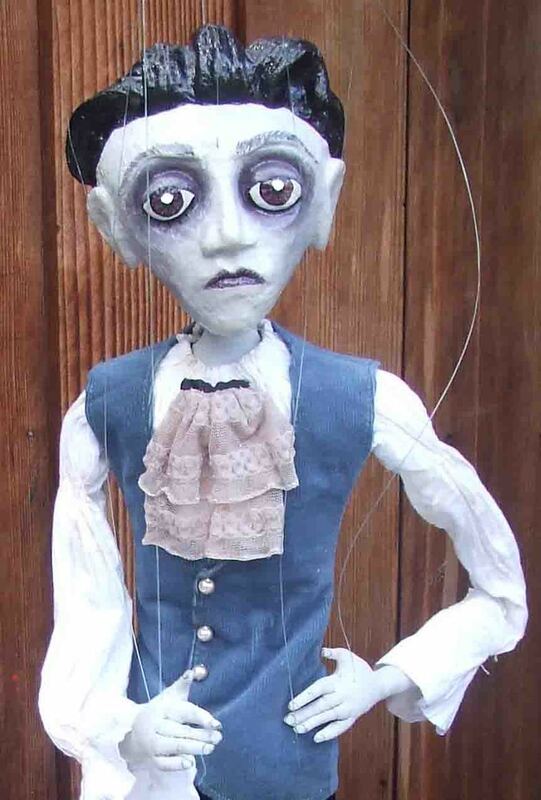 I’ve been making puppets in every second of my spare time. This last week has been a harrowing week as we’ve been in court for my brother, who is the defendent in a drug case. The trial is over now, thankfully, and we are all struggling to get back to normal. Before the week started, Paula’s advice to help me cope was that I go to bed early, get up early, and do a little on my puppets each day to help me stay sane. What an angel – that’s exactly what I’ve done and it’s worked like magic. Here’s the head of Mortimer Grimstone which I made this week. I had the loveliest day yesterday. Paula looked after Jesse all day and I worked solidly on making body parts for Martha Grimstone, daughter of Mortimer Grimstone. You can see here her head, which I made out of papier mache lined with car bog (yes, filler that’s used by panel beaters to fix dents in cars) because it’s really strong. You can also see this pic I snapped when I’d laid out various parts of her body on top of the “pattern” I made, so I’d make everything the right size. She looked really sweet when I was staring down at her, and somehow that doesn’t come across in the picture. I’ve also made her a dress – a white nightie, but no pic of that yet. Maybe soon, when she has legs. Paula and i had a crack at the legs (puppet knee joints are the bane of my life), but our attempt was so crappy that when my friend Andy called in she offered to take the pieces off to her workshop and use them as templates for a much more effective pair of legs. Bless her. I also had a very satisfying day today at my gig. I performed Bronwyn at the Mechanic’s Institute in Sydney Road. It’s the first time she’s been in a proper theatre, and we set up beautiful lights that changed with every scene. The theatre was just about full for both shows and I felt they went down really well. I’m trying something that I’ve never done before – to take more responsibility for gathering an audience. Usually I leave that up to the festival organisers. But this time I stood outside the door of the theatre, just before the show, and invited people in to watch. I couldn’t have done that ten years ago – or even five years ago – as I’ve always needed to focus a lot before each show to stay calm and be ready. I didn’t get very nervous today at all, and with Bronwyn it’s so much easier than hula hoops that I can actually afford to put energy out before the show as well as during it. I’m sure I get a much bigger crowd as a result of my efforts, which is very satisfying. 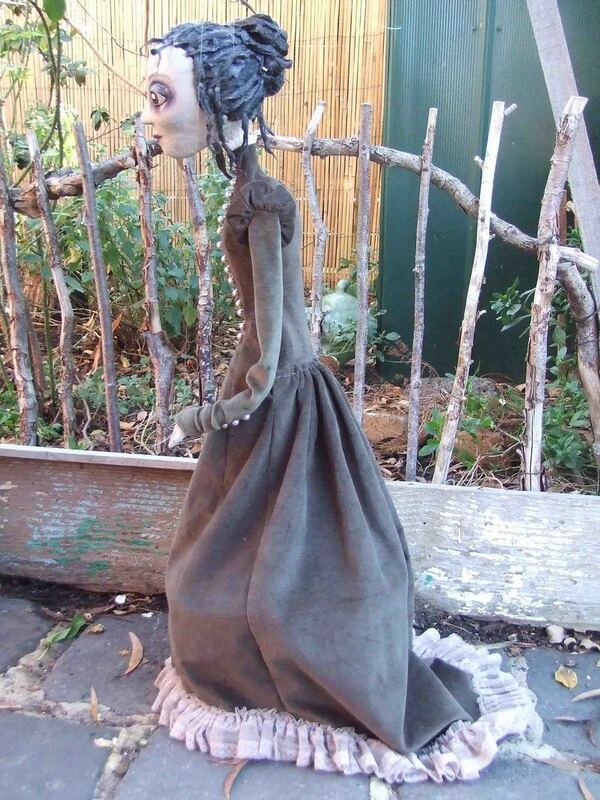 Here she is, my lovely Martha Grimstone, almost completely finished. I’m so pleased with how she looks. Her hair turned out just how I hoped it would – even better in fact. I’ve strung her in a different way to how I strung Bronwyn, with the theory that I can do more of the moves with one hand, and thus be able to move more parts of her body simultaneously. I’m feeling a bit flummoxed by the new string arrangement though – I can’t just make her do as I wish the way I can with Bronwyn. I spent a bit of time yesterday practising in front of a mirror, and I’ll probably “get it” without having to do as much practise as I did with Bronwyn. 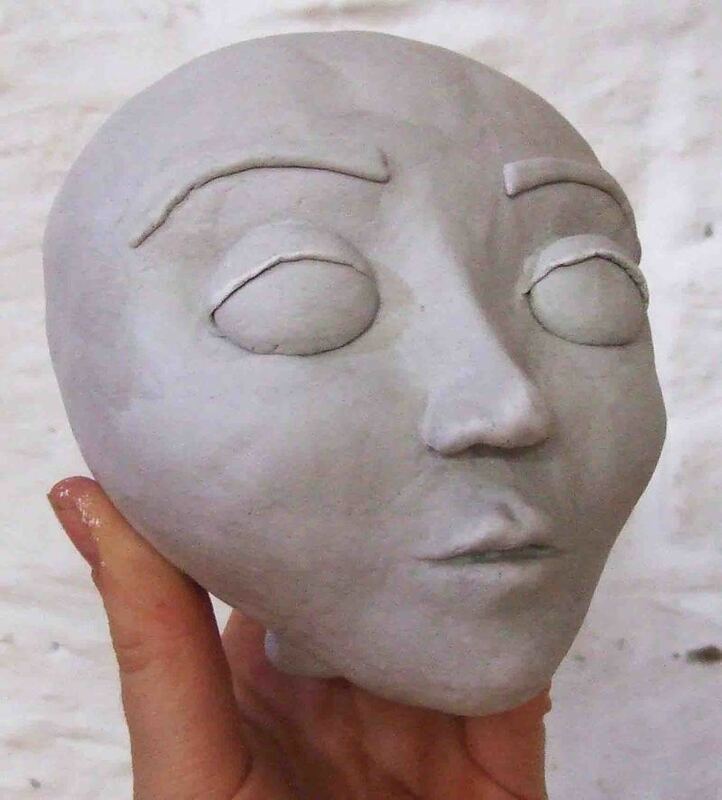 I’m so frustrated trying to make the head for my next puppet, destined to be Martha Grimstone’s mother, the elegant and grieving Velvetta Grimstone. The top head was my first dummy head – not bad. Slight flattening above her mouth which I vowed to fix in my next edition. 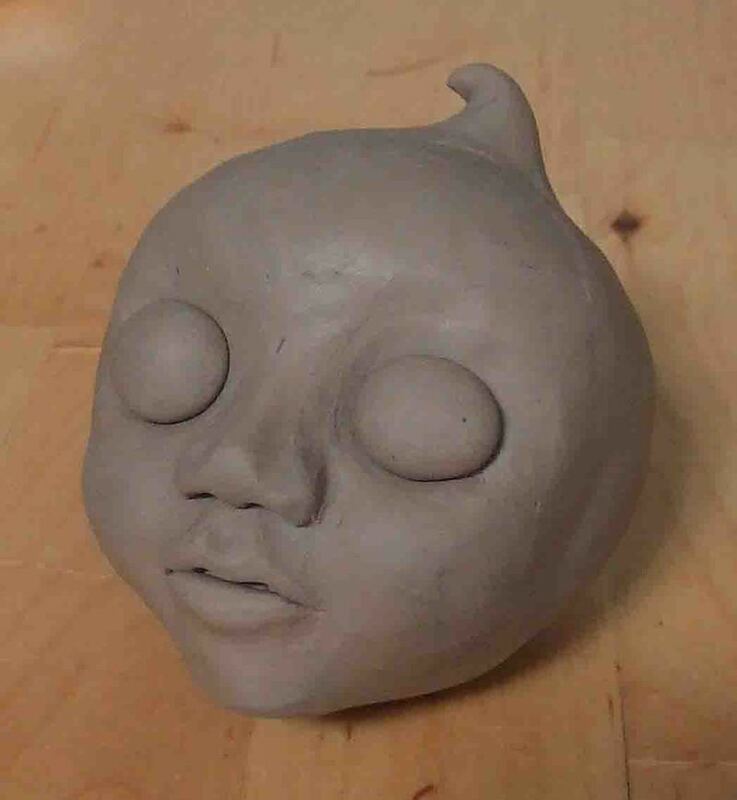 The problem is, I’ve since been sculpting the final version and just can’t get one I’m happy with. The middle head was my first attempt, but she’s come out rather hawkish. Not too bad front on, but from the side she definitely looks hawkish, even Paula picked it up. Also I made the head too small, so it’s the same size as Martha’s. No go. The bottom one is my most recent attempt. I whacked some paint on it yesterday to see if the paint would improve it, but didn’t finish it when I realised there was no hope. How did her mouth turn out so severe? The original dummy head is at least quite pretty. But I can’t use that because it’s made of clay and is far too liable to break. 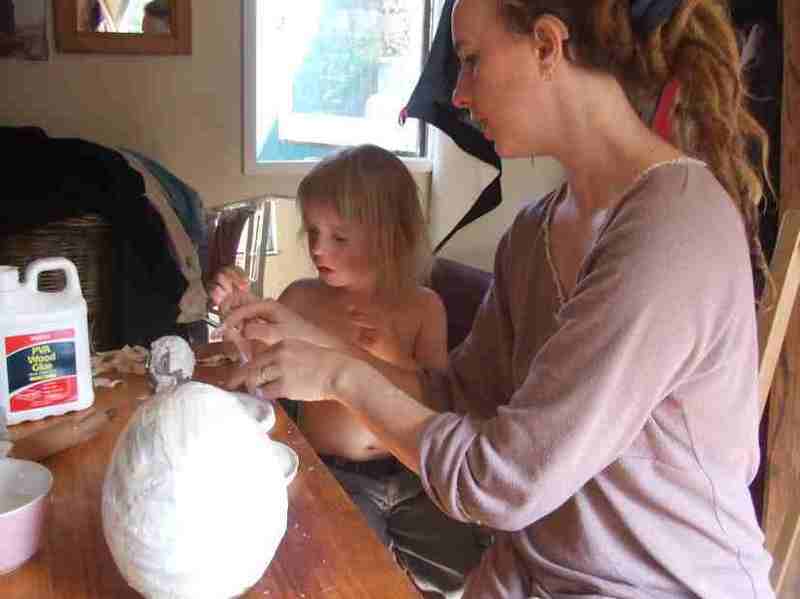 This afternoon’s project is to see if I can put a thin layer of papier mache over the top of the dummy head and peel it off when it’s dry. I’m hoping a generous coat of vaseline will prevent it from sticking. 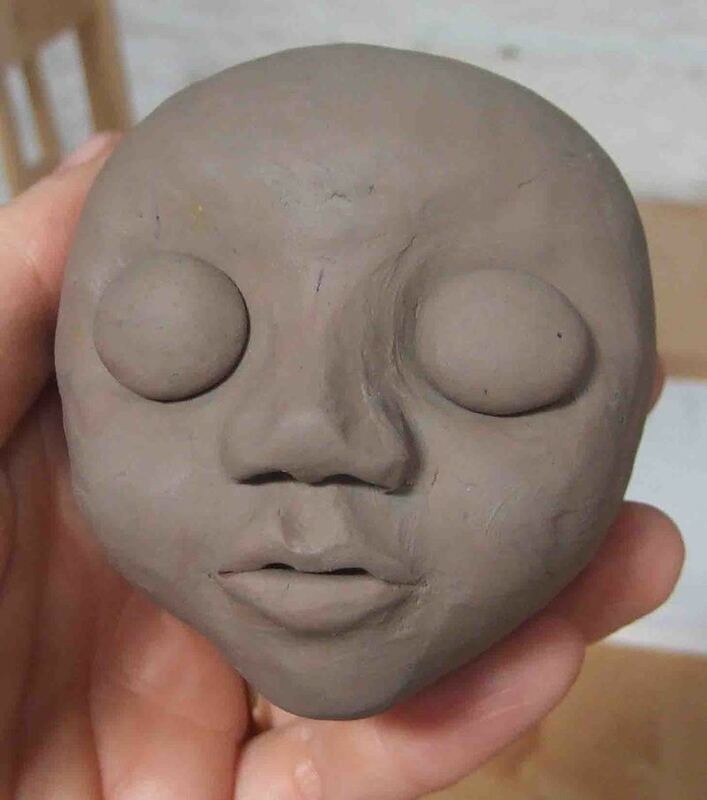 Making a head takes about 5 or 6 hours of my time, spread over four or five days, so I’m pretty keen to get it finished. Velvetta’s dress is waiting for her. And my lovely friend Andy popped in last night with Mortimer’s legs so soon I can finish him off too. At last I have three hours of precious time alone in the house, three hours in which to power ahead with my puppets, but now I’m tired! Argh. So here I am on the couch with my computer doing a quick blog entry while I recharge. The plan is to paper the dummy head, then set that aside to dry, and work on Mortimer’s legs and boots. I don’t expect I’ll get any more than that done today. Should I be so lucky, I’ll take a look at the baby, a little boy named Crumpet. I’ve been using every spare second recently on my puppets, but there haven’t been all that many spare seconds so they are coming along slower than I would like. My theory for creating a new face for Velvetta, which I talked about in my last entry, worked really well. 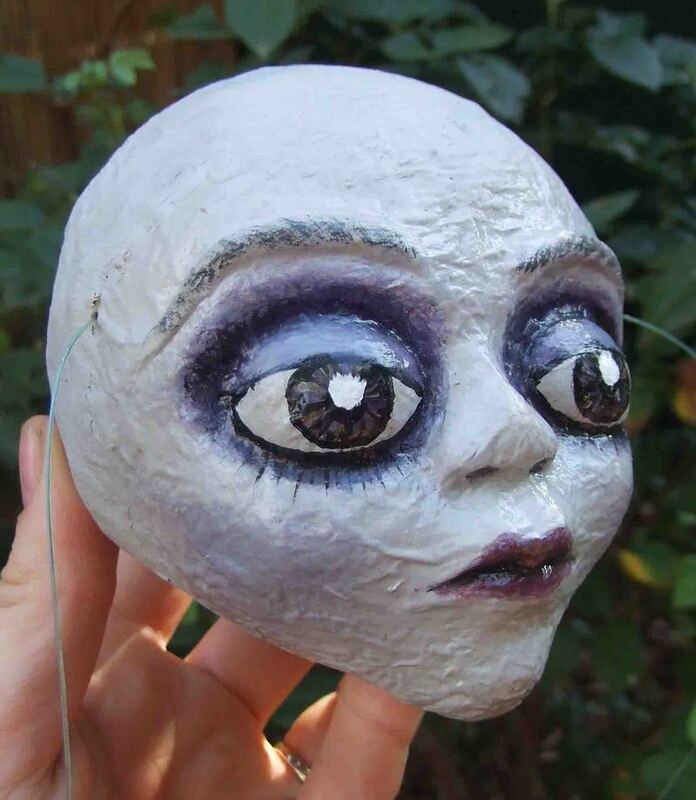 I was a bit hazy about how I was going to formulate the rest of the head, after I’d made my papier mache shell of the ideal face, but suddenly it all came together: I simply laid my shell over the top of my previous attempt, the one with the severe mouth, and glued it all down with car bog. You can’t even tell, now, that she has a crappy, ugly face underneath the final one. I’ve been spending hours on the details of her dress, stitching on pearl “buttons”, creating the sleeves with a puff at the top, a point that sits on the top of her hand, and more of the pearl buttons at her wrist. I’m pretty pleased with the effect. I’ve also made her a petticoat with a hoop in it, but the hoop is of plastic and keeps bending out of shape. I think I’ll have to re-do that one using coathanger wire – at least that tends to stay in the shape you put it in. I spent this morning making dreadlocks for Velvetta. I’ve been umming and uhhing about whether to just let her hair be loose and a bit wild, in an impression of a grieving woman, or whether to go a bit more elegant and refined and give her a bun. I think I’ve settled on the bun, with stray dreadlocks surrounding her face in an impression of the wispy-ringlets that were fashionable a couple of hundred years ago. The dreadlocks are drying in the sun. When they’re done I’ll nail them (yes, nail them!) to her head. It feels a bit rude to go bashing at her with a hammer, but that’s how I attached Martha’s dreadlocks, and it worked reasonably well. Here he is, Mortimer Grimstone all finished. I’m really pleased with how he’s turned out. 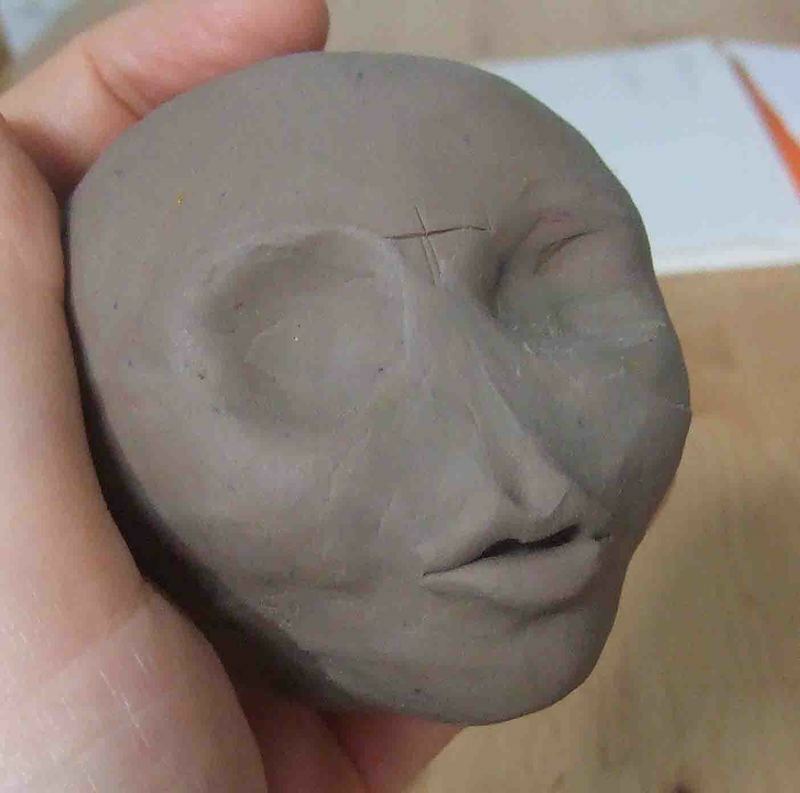 While I was making Crumpet Grimstone I snapped pics as I sculpted, partly because people have been asking me how I sculpt them, and partly for my own record so that in a couple of years when I’m trying to remember what I did, I can use this as a reference. 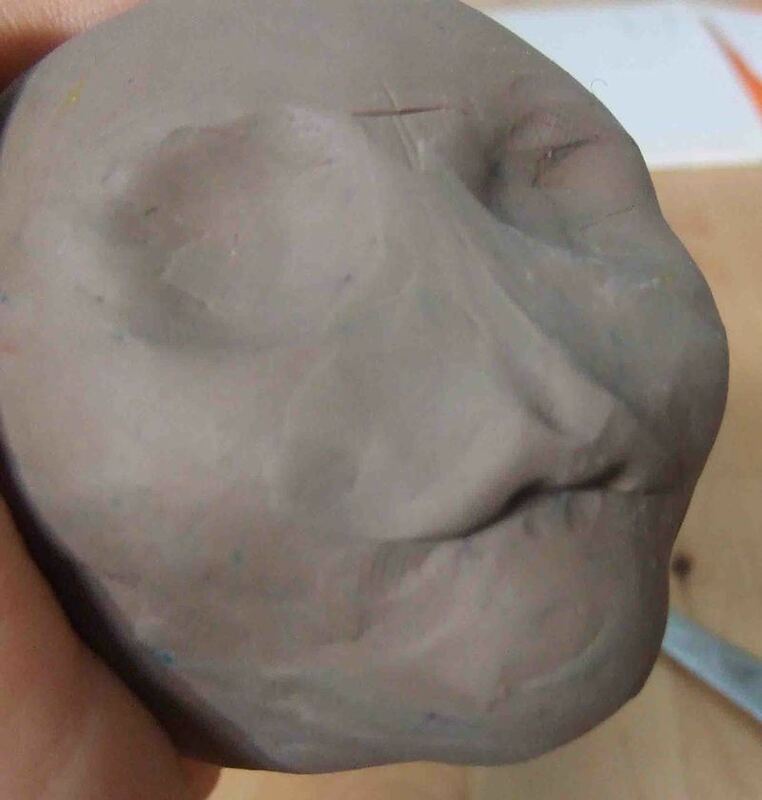 I sculpt the heads out of plasticine, then put a thin layer of papier mache over the plasticine, and after it’s dried, I slice the head in two and remove the plasticine. 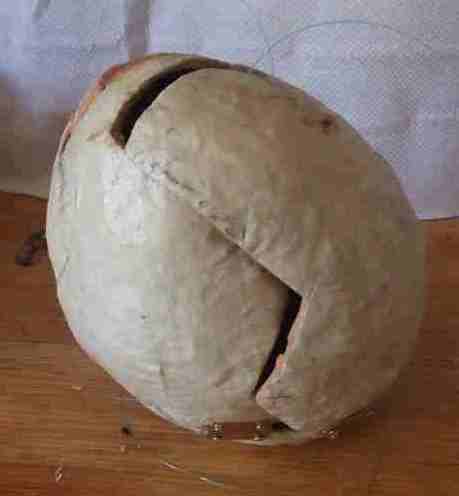 I’m then left with a thin, flexible shell for the face. I made it strong by lining it with car bog, which I also use to bond the two halves back together. I paper over the join, then paint the face. As this head is for Crumpet Grimstone, he needs to look like a nine month old baby. I don’t use many tools as I do most of it with my fingers. The plasticine is a cheap packet from the $2 shop, which came in rainbow colours. I mixed it until it was an even brown colour, as marble effect can make it hard to see the effect of the face properly. 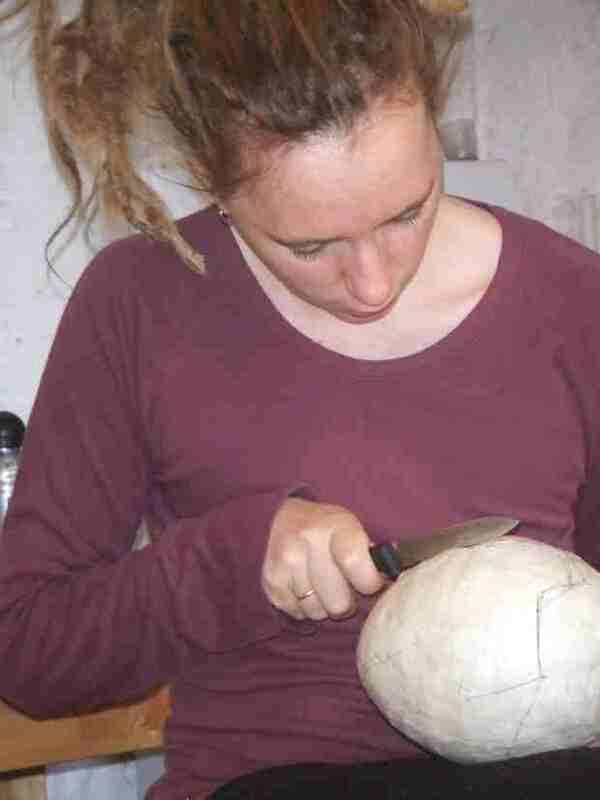 I use a rounded end of a paintbrush, a rolling pin and a clay sculptor’s knife, but an ordinary kitchen knife will do. 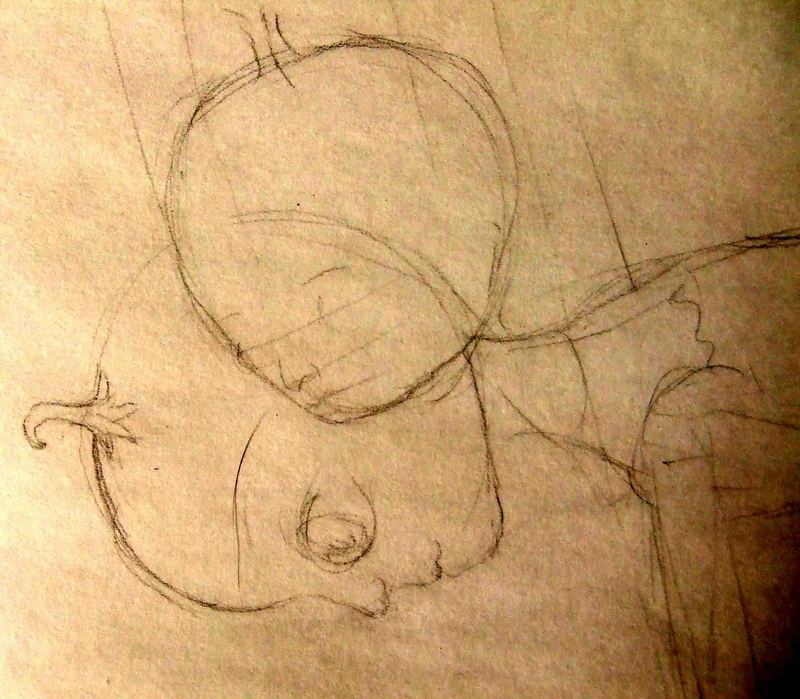 I also use a life-size drawing of the head as a guide to get the size right if it matters. 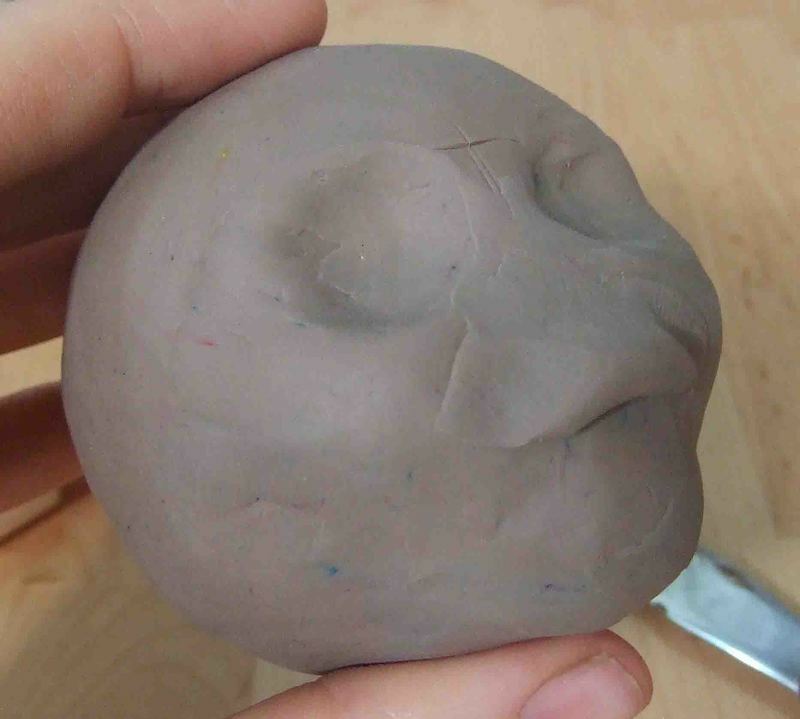 Next I roll a ball of plasticine, approximately the desired size of the head. 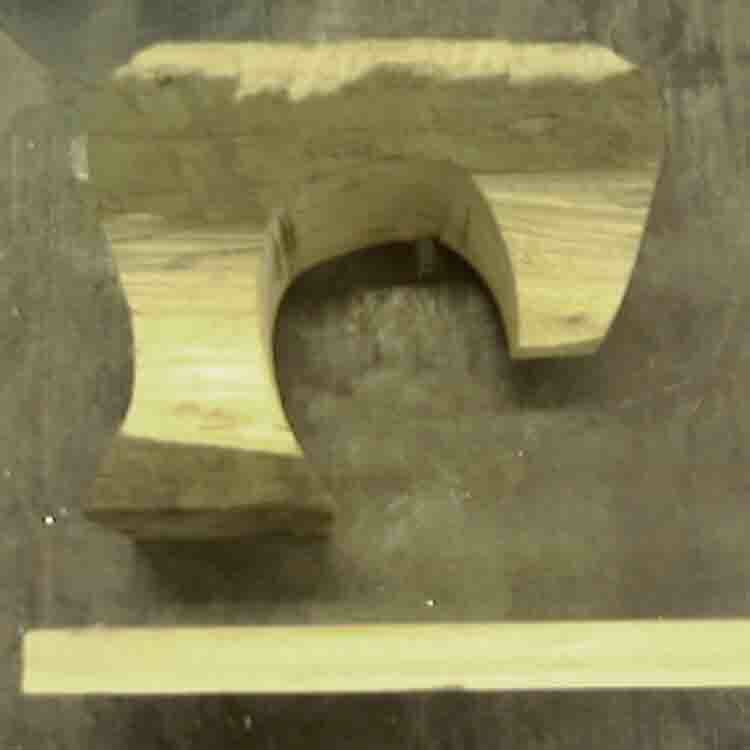 I add another ball and smooth it on to create a cone shape – this is the chin. With my knife I score the centre line of the face, and lines to mark where the eyes, nose and mouth are to go. 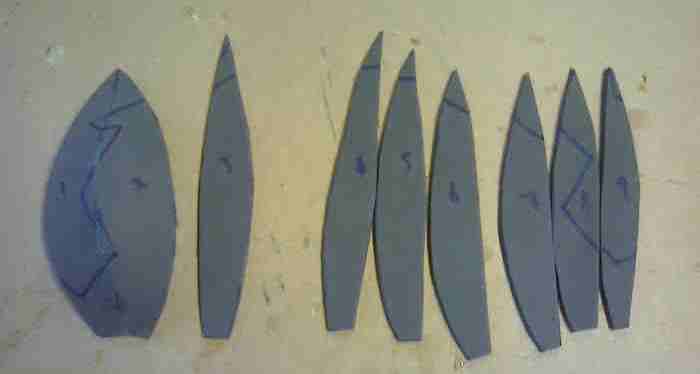 Next I gauge out a hollow for each eye socket. I always put on the mouth before the nose, as otherwise it’s impossible to smooth the top lip. 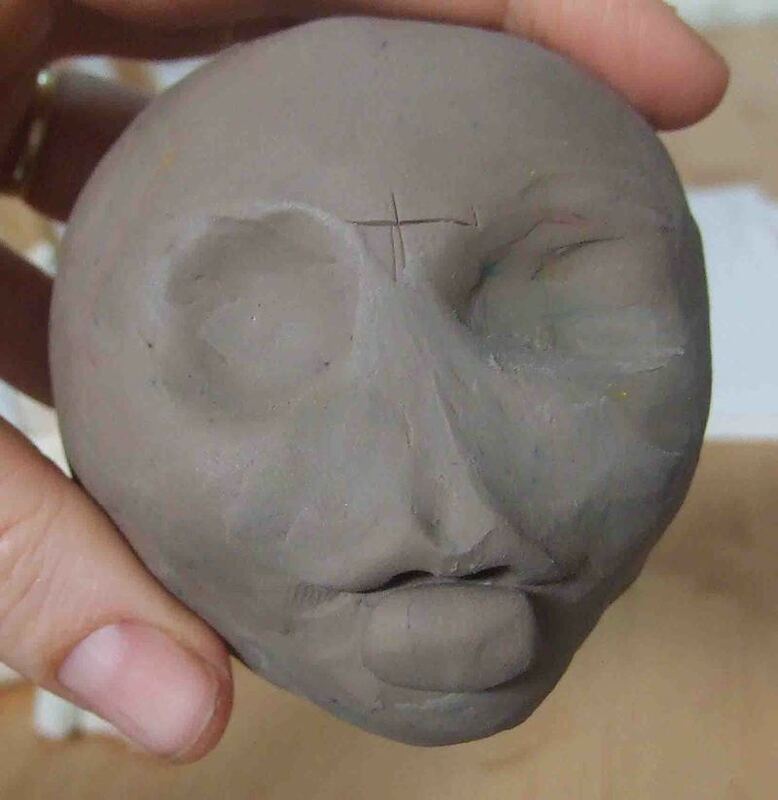 The top lip starts as a short roll of plasticine, which I smooth upwards into the nose and cheeks. I then use my thumbs and the rounded paintbrush end to shape the contours of the lip. 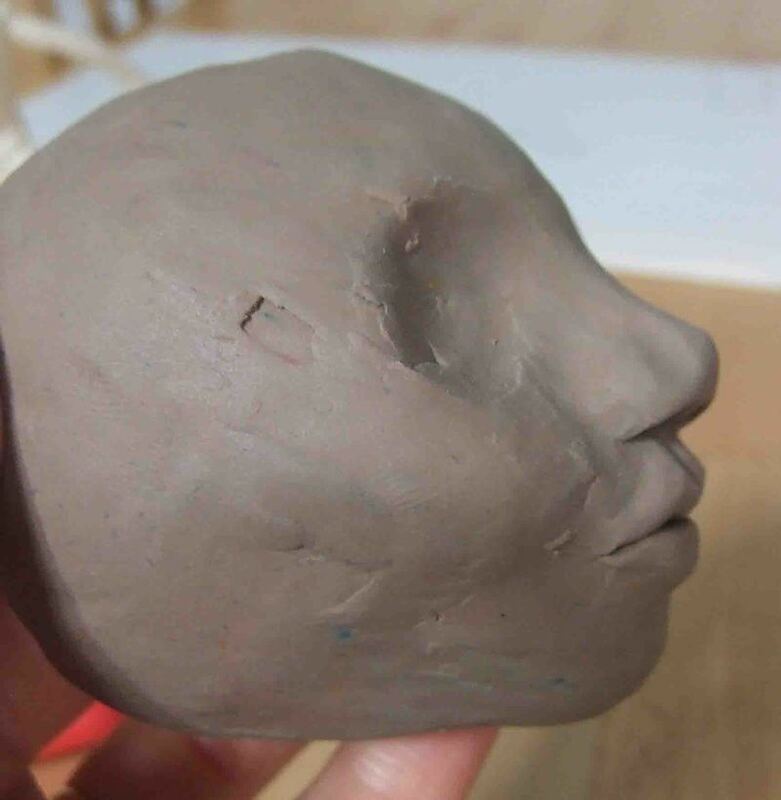 Once I’m happy with the top lip, I add another roll for the bottom lip, and smooth it down and out. 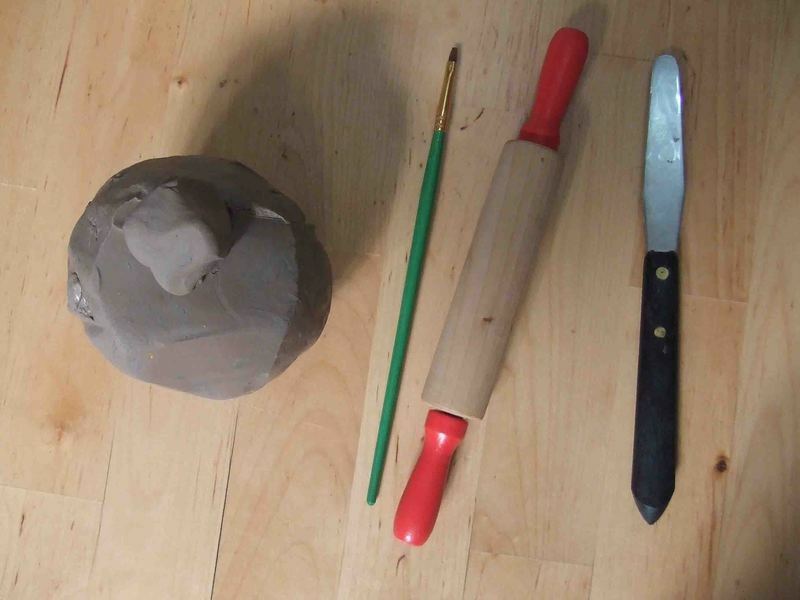 To make the nose, I roll a ball of plasticine, then roll the ball into a cone shape. Before I attach it to the fact I shape nostrils out of the fat end of the cone. Then I sit it in position. It should look quite large at this stage because the smoothing will make it smaller. It can take a couple of attempts to get the right size. 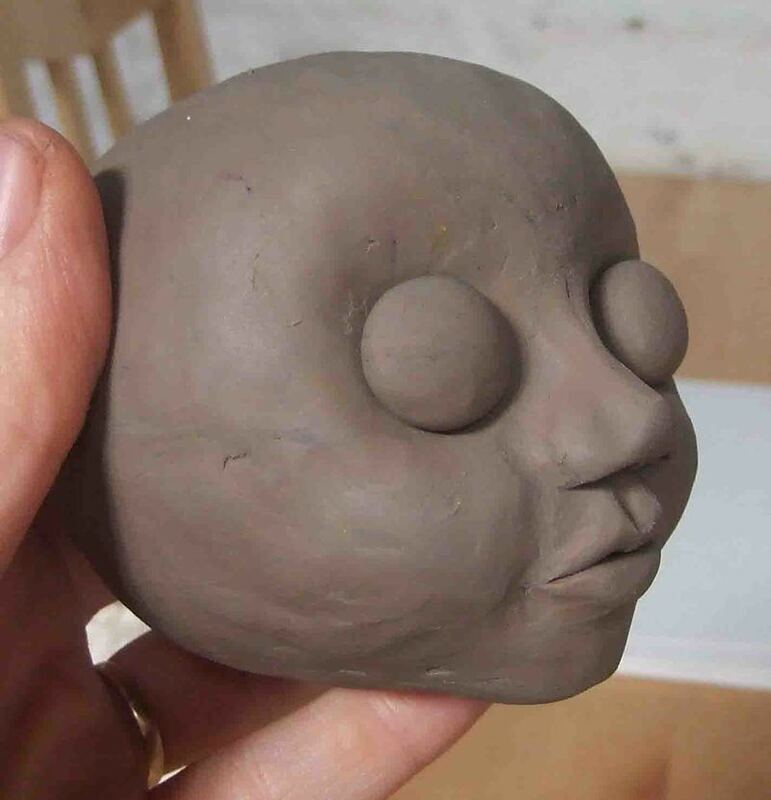 For the eyes, I break off to equal sized pieces of plasticine and roll them into balls. I squash them into my palm and shape them so they are slightly oval. I place these in the middle of the eye sockets. 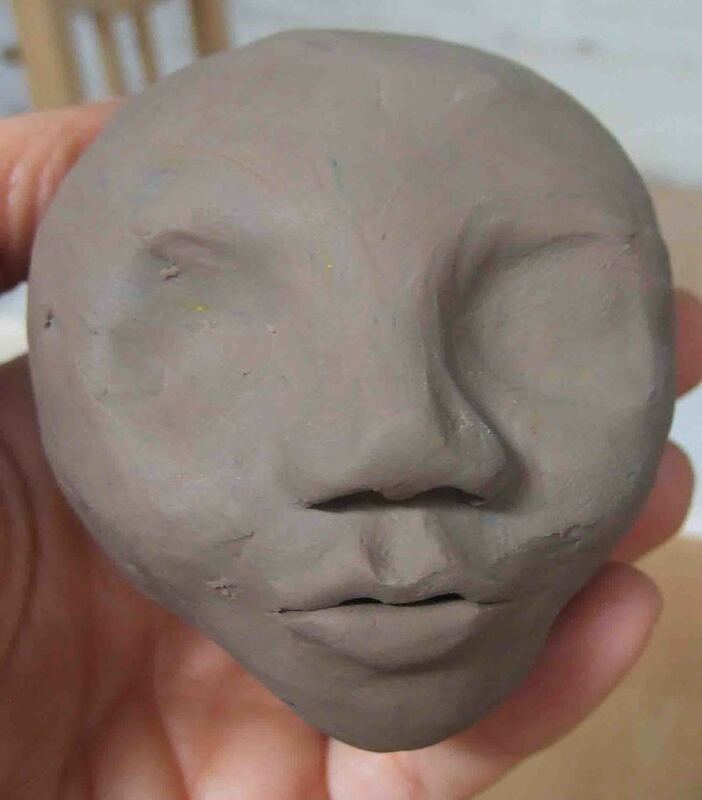 I noticed that the cheeks looked a bit hollow – for a baby the face looks too mature. 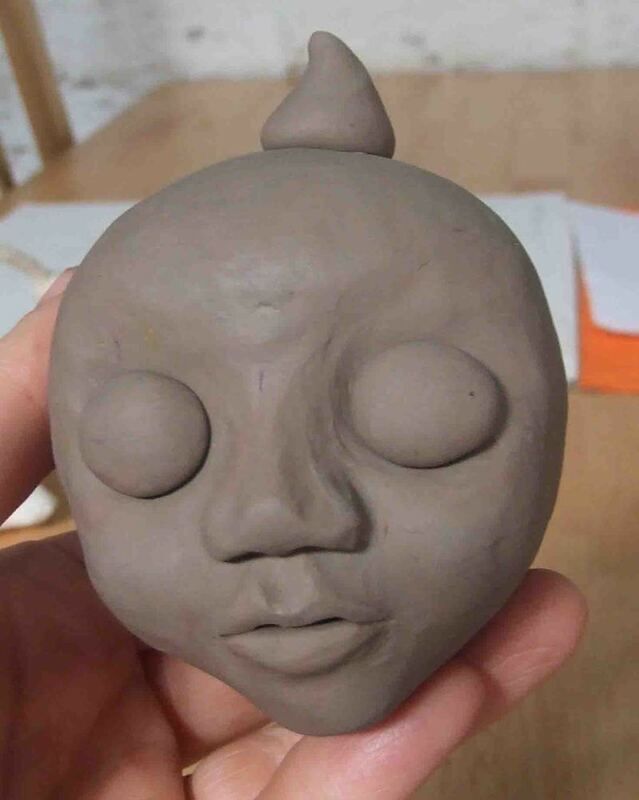 I added small lumps to the cheeks and smoothed them. Looking at the head in profile, I can also see that the forehead needs building up. I add a large, flattened roll to the forehead, and smooth it on. I had to remove the eyes, smooth down the forehead, and then replace the eyes. For the hair, I roll another cone shaped piece of plasticine, and curl it slightly at the top. I smooth it into place as the top of the head, slightly off-centre. Voila! Crumpet is finished. I actually fiddled with him a little more before I was happy. I skimmed a bit off his nose to make it smaller, and added lumps which I smoothed over his skull to make a nice rounded head. I put him in the fridge until I cover his head with papier mache. The cold helps the plasticine go hard. I’ve been planning and working out the set for The Grimstones. It’s to be three large wooden books, which will open up to form the set, much like a pop-up book but far more detailed and substantial. 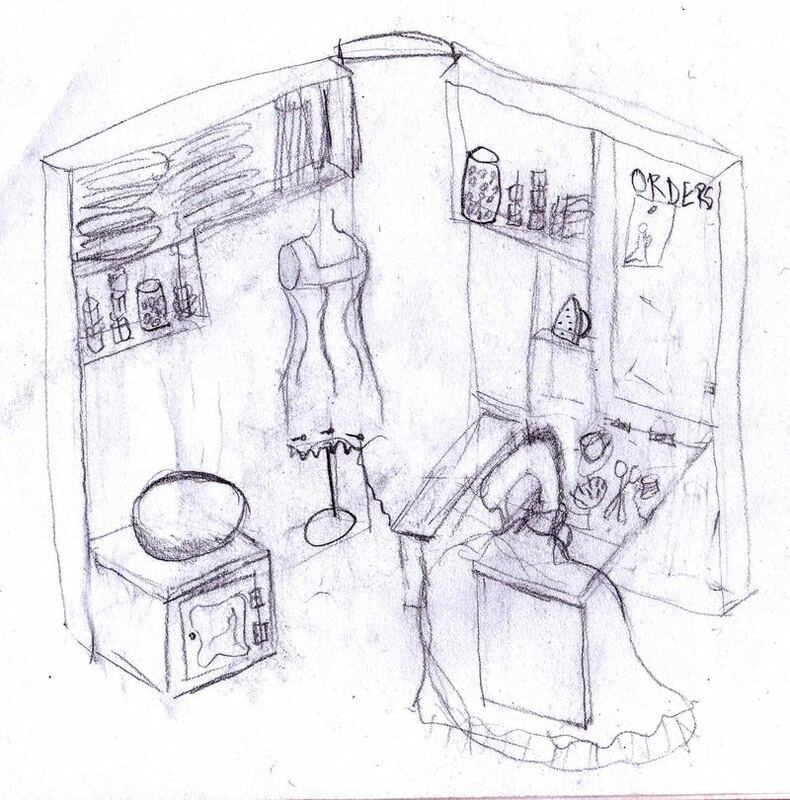 You can see here the concept drawings for the crypt (Mortimer will emerge from the grave) and Velvetta’s sewing workshop (the egg will hatch and baby Crumpet is to emerge). I did some drawings and was going to get a quote, but then I panicked about what it would cost, and also I have been feeling that perhaps I can do it myself. 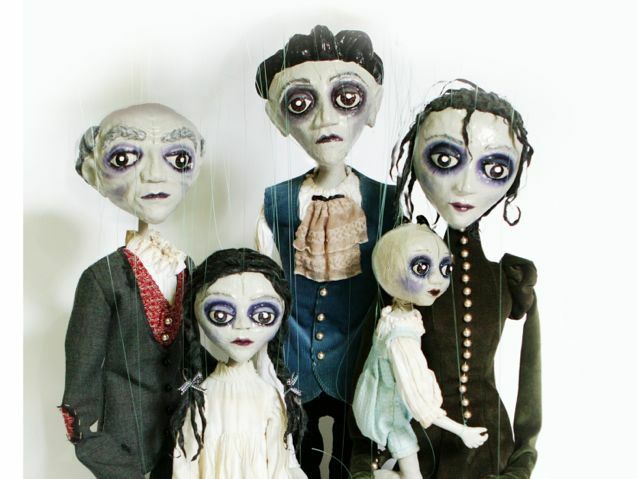 I’ve been enjoying making the marionettes and somehow I want to keep it all within my own hands. I am carefully, carefully designing the books so that they will be easy to build – using existing timber widths and thicknesses you can buy. This has involved a few trips to Bunnings to check out what’s available. I think I’ve pretty much settled on thicknesses. Now I need to decide on the dimensions of the book. So hard to decide. I wanted them to be as tall as the puppets, but this would make for enormous books to store. One size of plywood is a little smaller, and if I made the books the right height for that, they would be much more practical for storage. 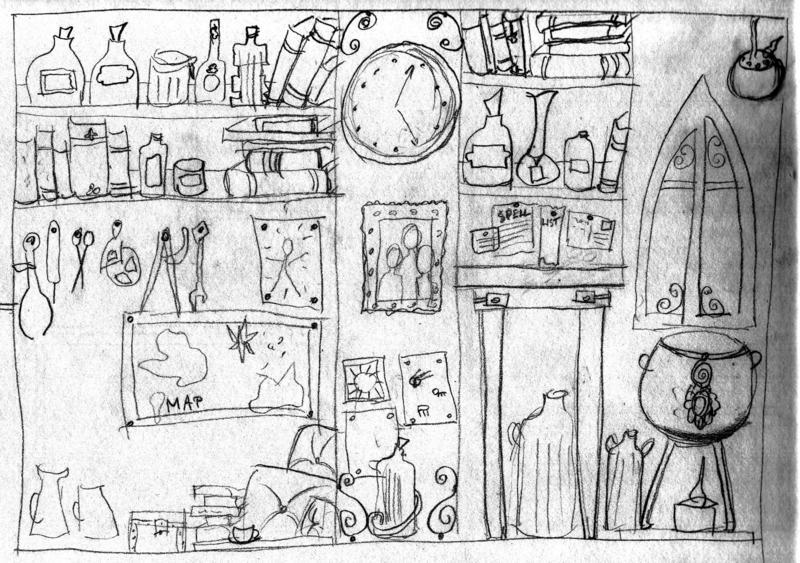 Here’s the concept drawing for the magical workshop where Grandpa Grimstone will work. 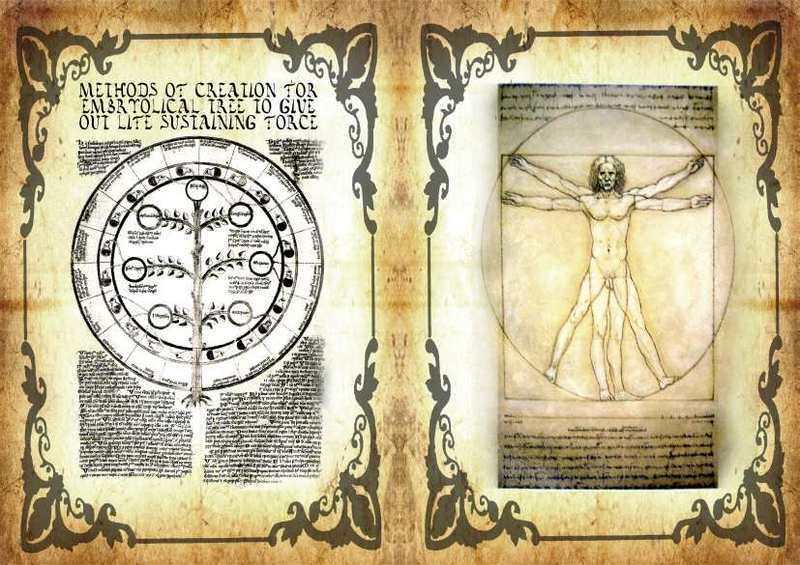 I’ve spent several hours designing and re-designing the books for the set. I’ve finally settled on a design for Grandpa Grimstone’s workshop which I’m happy with. It’s the smaller size, and I’m feeling confident that it’s going to work. This morning Jesse and I took the shopping trolley up to Bunnings on the bus, and bought all the timber and fixings I need for the first book. I haven’t worked out the designs for the other books yet, and I didn’t buy extra materials for them at this stage. While it would be more efficient to make them all in one go, I feel the need to make one as a test, and if I’m happy with it, then I’ll do the other two as a single project. I had a long chat with my brother Sam, on the weekend, about details for how to go about constructing it, and he gave me heaps of tips. 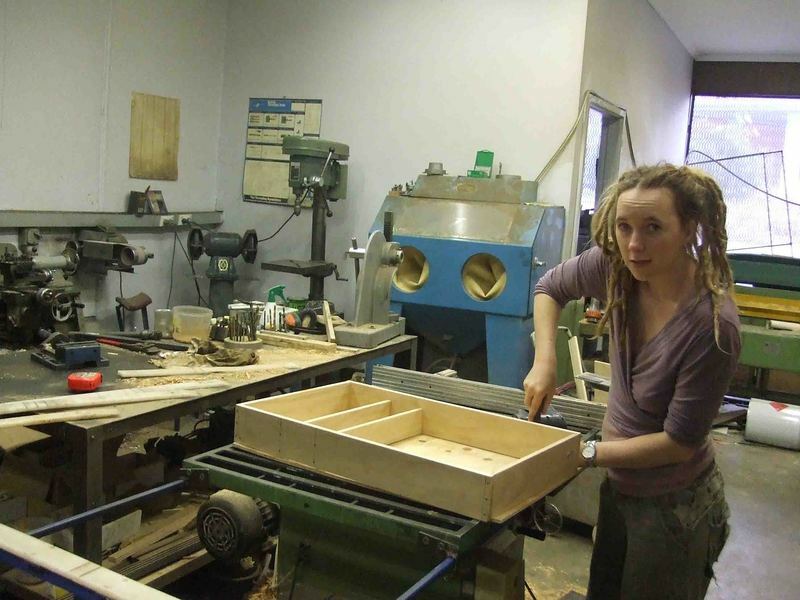 He also suggested that rather than setting up my own little workshop in the studio, I should go to my family’s factory, as there are heaps of big tools there which would make the job much easier and more precise. He’s happy to come up for an hour to get me started, show me how to use the tools. I’m hoping while he’s there, we can cut everything, and then after he goes, I’ll probably feel confident to do all the joining. It’s the cutting that scares me. I worked solidly for six hours and finished Velvetta! I put on her dreadlocks, strung her up, and she’s gorgeous. I can’t tell you how incredibly happy I feel. Now I have three marionettes hanging in the lounge room. It’s exhausting living in a puppet frenzy. 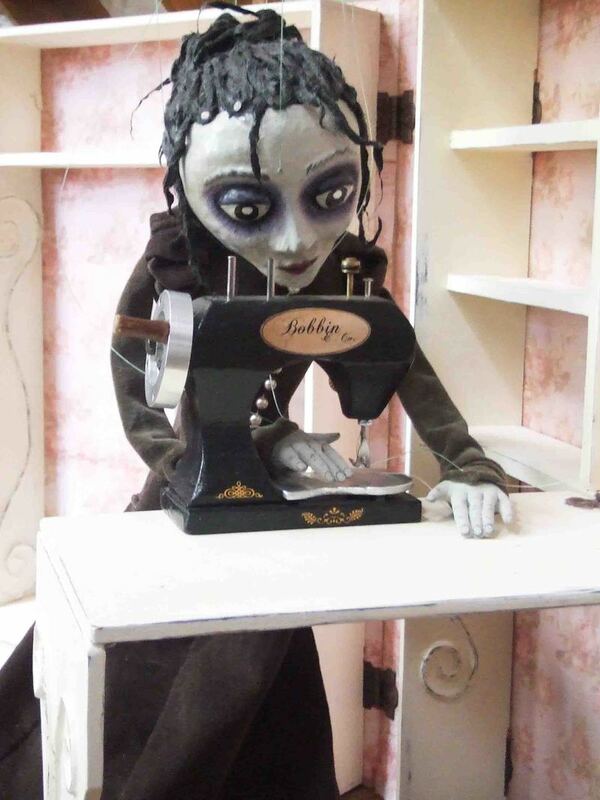 Once I get on a roll with a marionette I go into a kind of frenzy and can’t seem to stop – every spare moment is an opportunity to do a stitch or two, age some clothing, paint or glue something. I feel a bit tired from it all actually – I need to have a bit of a break. But in six weeks we go to Alice Springs, and I’m leaving my beloved Grimstones behind, so I need to get to a point in the project where I’m happy to stop. If I don’t do that I’ll spend our whole trip longing to get home so I can keep working on it. 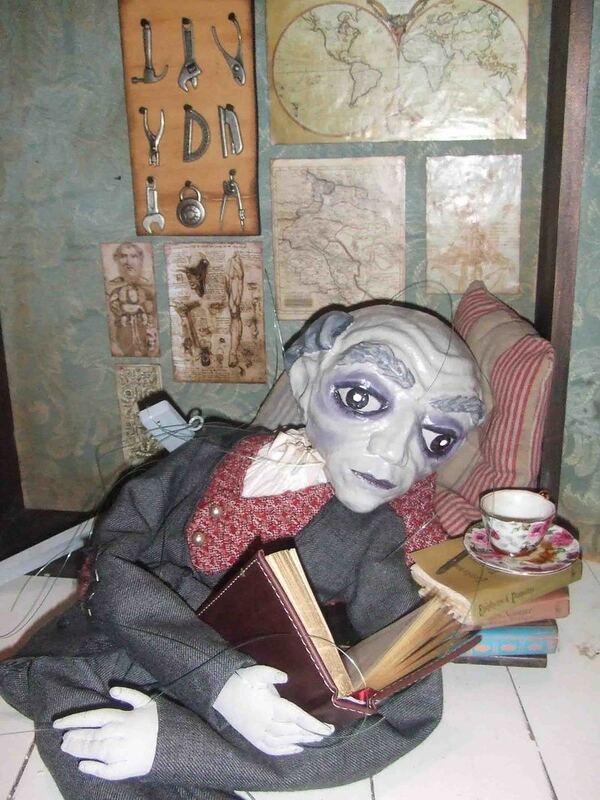 I plan to work on my book while on the road, as it’s a lot less gear to bring than a puppet-manufacturing workshop. I met Sam at my family’s factory today so that he could show me how to work all the tools. There were only three big tools for me to learn, and actually they were all dead easy. A table saw, a bench saw and a fantastic grinding sanding thingy which grinds off nails that are too long, and fixes any bit of wood that isn’t quite how it’s meant to be – yeah! He stayed with me for two hours so we could cut everything, then talked through with me what I needed to do. I’ve never been taught anything by Sam before – he’s my little brother – and he was a great teacher. He struck a nice balance between doing stuff for me to demonstrate, then stepping back so I could have a go. There was one thing which he achieved by grunt-force, which I couldn’t do. “But what will I do when I’m making the other books, and you aren’t here?” I asked. He found another solution – enter the fabulous grinding tool. After he left I worked on for a few more hours, then I had my first book to bring home! 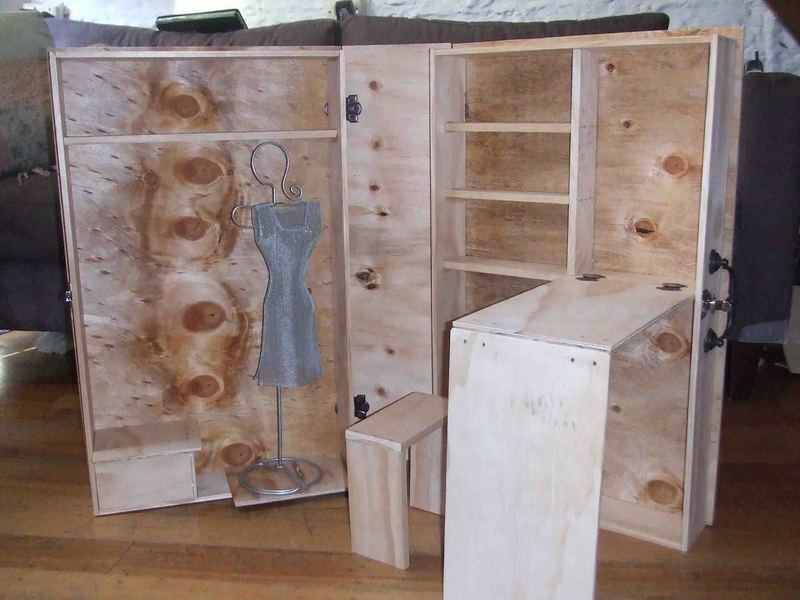 I was amazed that it had all come together so quickly – eight hours in total. And amazed that it looks so good, seems to work as I hoped . wow. I can’t wait to go back and build the other books. It’ll have to be real soon so I don’t forget how. 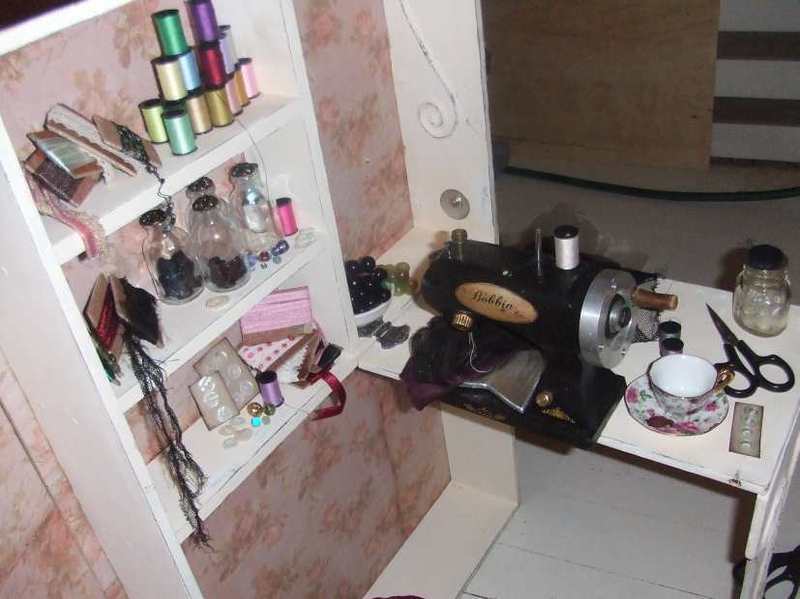 I’ve now managed to complete Velvetta’s sewing workshop. I like going to the factory to work on the books. I like the workshop, I’m happy doing the work. Unfortunately I have to plan in advance when I can go – or rather, take the opportunities that present themselves: a block of several hours where I have no other commitments and don’t have to look after Jesse. The problem is, the last two times I’ve taken up these opportunities, I’ve arrived at the factory and discovered I’m absolutely trashed, and then it’s been rather daunting to keep working despite my exhaustion. I’m getting a bit sick of it now, though I suspect it’s the exhaustion I’m sick of, not the work itself. 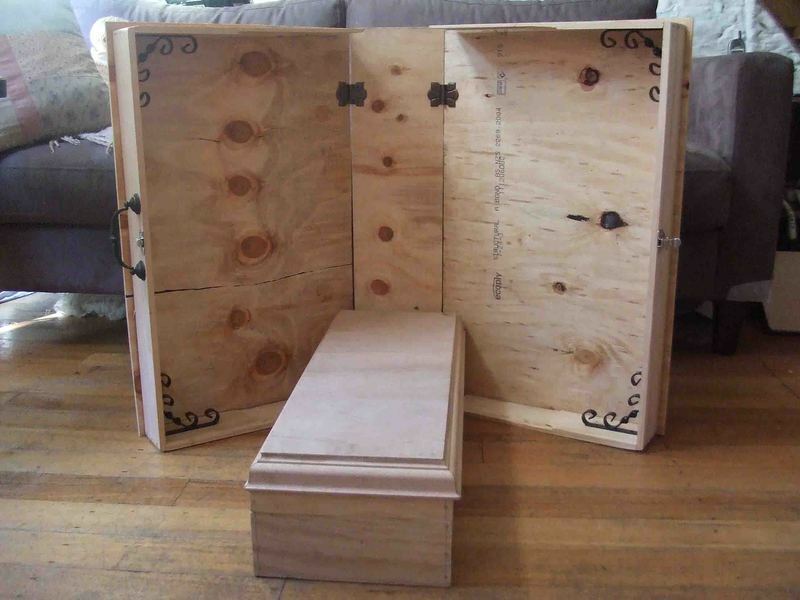 I’m working on the crypt now, which requires me to make a coffin/grave box for Mortimer. This box is challenging me considerably, and just before I left yesterday I discovered that the carefully mitred joins I’d done were on pieces that several centimetres too long – bugger. So I’ll have to cut it all apart and start that one again. 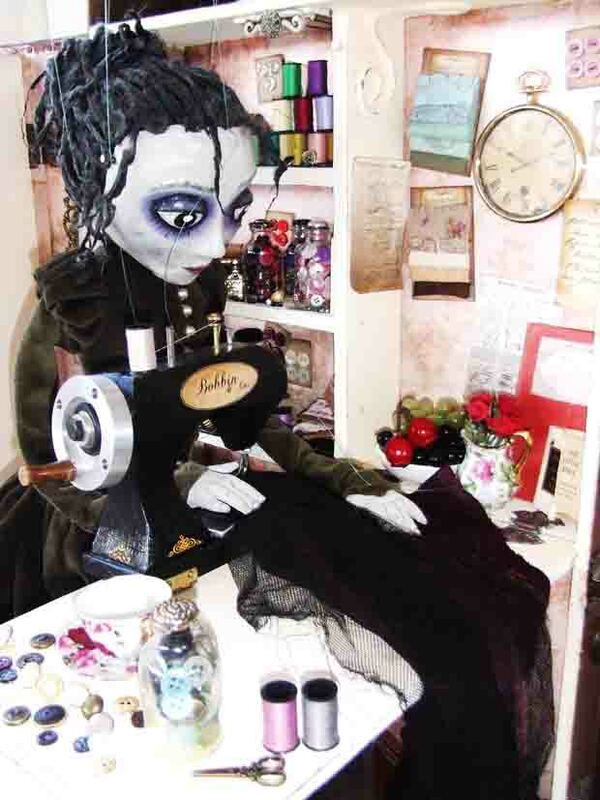 I just had to snap a pic of Velvetta at her sewing table. I got Jesse to hold her up for this, which meant she flopped rather alarmingly. I managed to get this blurry image as she swung from one flopped position to another. Oh well – you get the general idea. 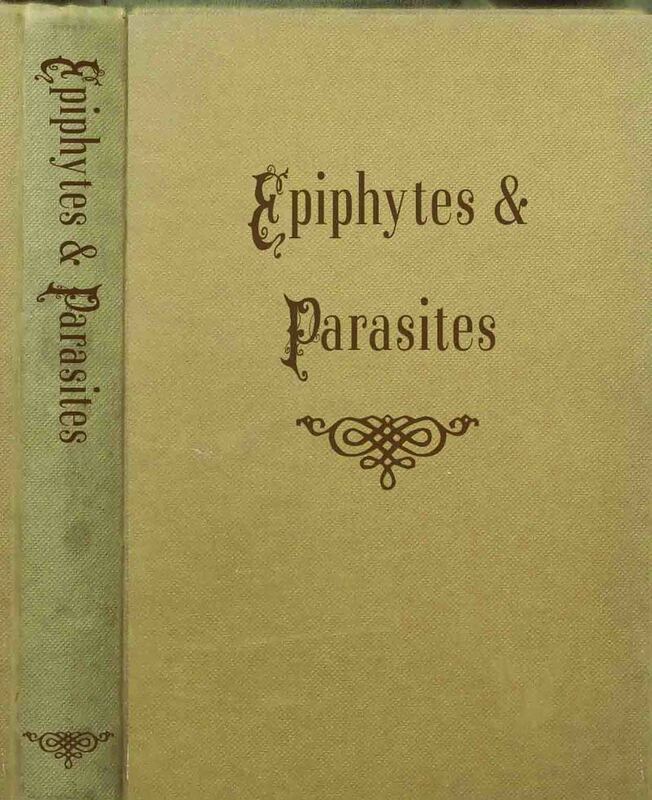 Finally, I’ve completed the books for the Grimstones. Actually, at some stage I’m going to need to return to the factory and do a bit more work on the Crypt, but for now I’m calling it finished. Despite careful measurements and design, I made numerous mistakes with this one – and the coffin gave me grief. 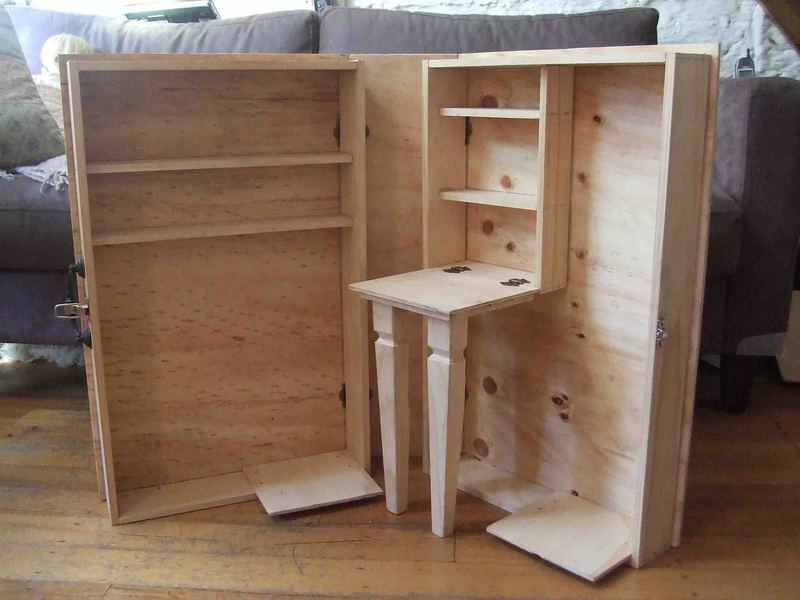 I just seemed to constantly end up with pieces that were too long or too short for what I’d planned, and not only did I not have extra wood, but I’d bought out all the timber of the correct size at Bunnings so couldn’t even pop to the shop to get more. I did lots of workarounds but they resulted in a fairly flimsy product in the end. 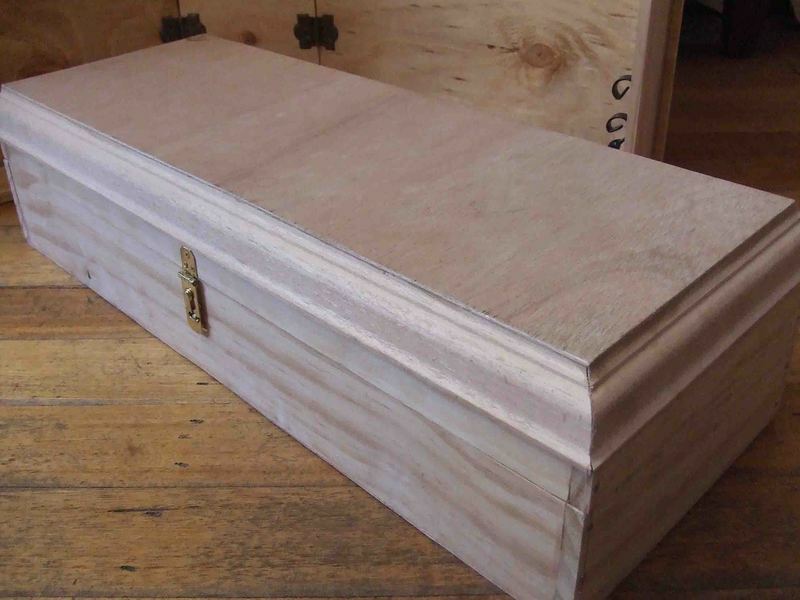 I’m happy with the coffin though – hopefully it will function ok. I’m pretty proud of the mitred joins and how fancy it looks, considering how rudimentry my carpentry skills are. 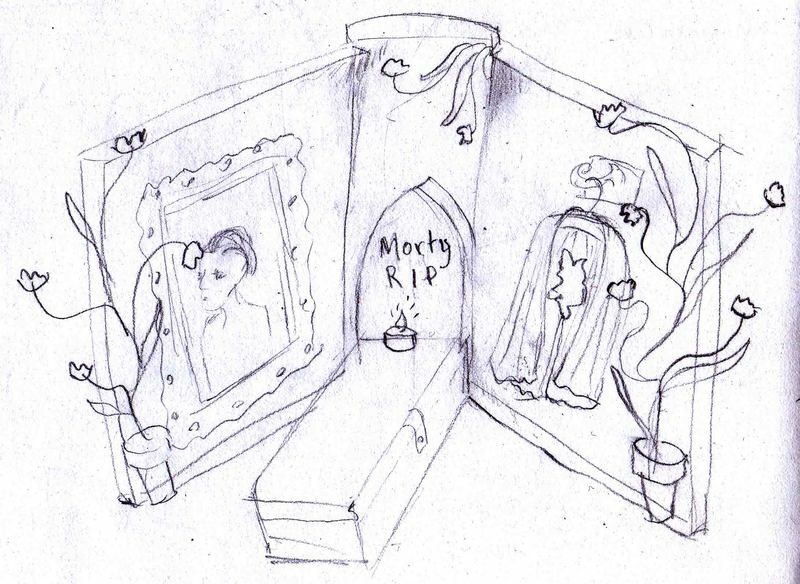 Here’s Mortimer in his crypt. As I opted for smaller size books (easier to store and transport), I had to make his grave somewhat smaller than he is, but I think the bent knees are perfectly acceptable – when I close the book, the grave-box is sandwhiched inside. I can’t wait to line the box with red velvet. And outside I’m thinking I’ll glue down a decoupage of stone finish, inked with black around the edges and in the joins. Even though I’ve promised myself I’m not going to decorate the books and box until we return from Alice Springs, I’m itching to make a start. I made a start on Crumpet on the weekend while we were at Barwon Heads. I wasn’t really in the mood, I think because Paula and I kept having stupid bickering fights which made me feel flat, and then I figured that as long as I felt bad, I might as well “achieve” something to make the most of the wasted time. I sewed his entire body, but when I tried to add in clothes, they failed miserably. I just don’t know how to create the suit I planned for him. With sewing I am confident enough with my skills that I think I can sew almost anything, as long as I focus hard enough. For the first time since I started this project I’m not feeling so confident after all. I had another idea for a different outfit that might be easier to make, but I don’t feel quite as inspired by that one. 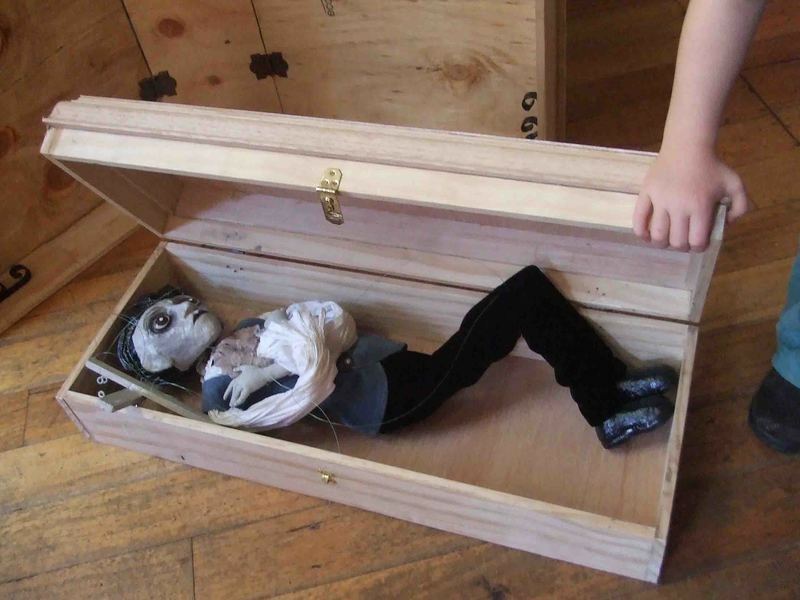 I’ve shoved his little body into my puppet-tool box and am giving him a rest for now. 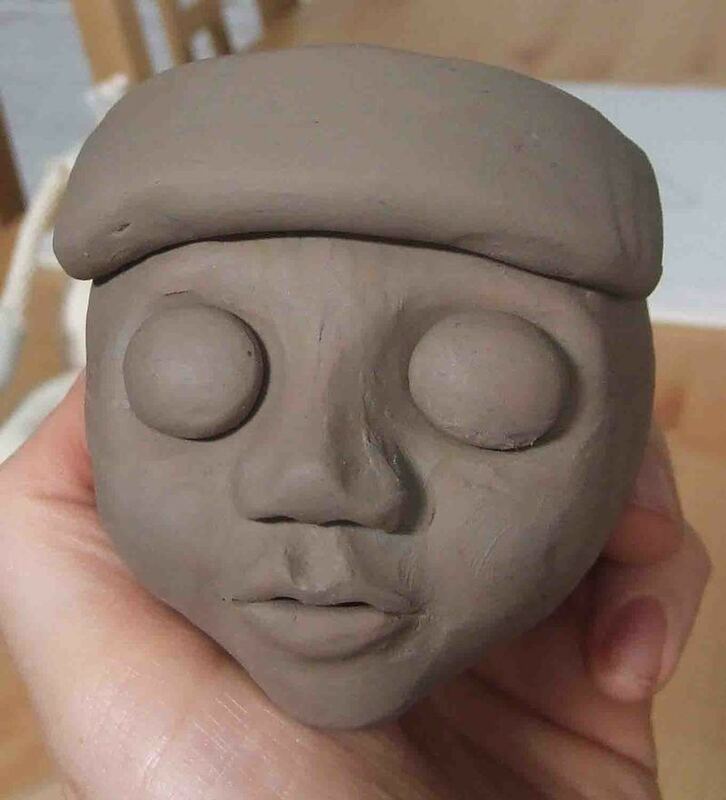 I’ll probably try sculpting his head next. It’s possible that if I make him a really nice face then I’ll fall in love with him and will have renewed vigour to work on dressing him properly. Sorry there’s no pic, just felt too disillusioned to snap my work! At last, at last, I’ve finished Crumpet. I started him back on the Easter weekend and it’s taken me this long to crack it. I think it was a mistake to work on him while I was in a bad mood. It meant I didn’t have the right frame of mind to tackle the problems I encountered and then they became huge blocks for me. After I abandoned the suit I intended to sew – how on earth does one sew a three-legged grow-suit – I came up with the idea of little overalls, and in the end they weren’t too hard to make. Once I’d painted his face, and held his head up against his funny little body, I was inspired anew to create his clothing. I did that a couple of days ago, and yesterday I put the final strings on him. I’m happy with how he looks now. He doesn’t crawl perfectly though. I could remake his legs and add a lot more weight, which might improve the situation, but right now I’m reluctant to. He’s given me enough grief already. I’m thinking of going for a simpler “impression-of-crawling” instead. He doesn’t do much crawling in the show. Mostly he’ll be carried around, so hopefully it won’t matter much. I have added a hook to Velvetta’s control so that his control can be attached, and when it’s attached he’s sitting on her hips. It took a fair bit of concentration to work out how to string him so that when I hold the control horizontal, he’s in a crawling position, and when I hold it vertical, he’s in a sitting position. But it does work – I wasn’t sure it would. My plan is to include some magnets in Crumpet’s legs, and some more on Velvetta’s hips, so that he can be placed there and will automatically cling to her. I’ve bought two separate sets of magnets but neither of them are strong enough – bummer. I’ll have to look for commercial strength magnets. Here he is in the arms of Bella, the two and a half year old girl next door who visited and played with him for ages, feeding him milk, wrapping him in a blanket, and letting him eat from my box of buttons. A couple of photos of my beloved Grimstones, except for Grandpa, who hadn’t been completed at the time I set up this portrait. We’ve been driving and driving. Not far each day, admittedly, but enjoying mooching along, checking out country towns, and finding free places to sleep at night. Last night we parked next to the cemetery of a country town. I love having a good read of all the headstones – they make a real picture of the community if you read them carefully enough. I took this photo of one of the graves, thinking of Mortimer’s crypt. Perhaps I can enlarge this image and doctor the text so that it is about Mortimer, not Annice. Is that a terrible thing, to rip off someone’s grave? 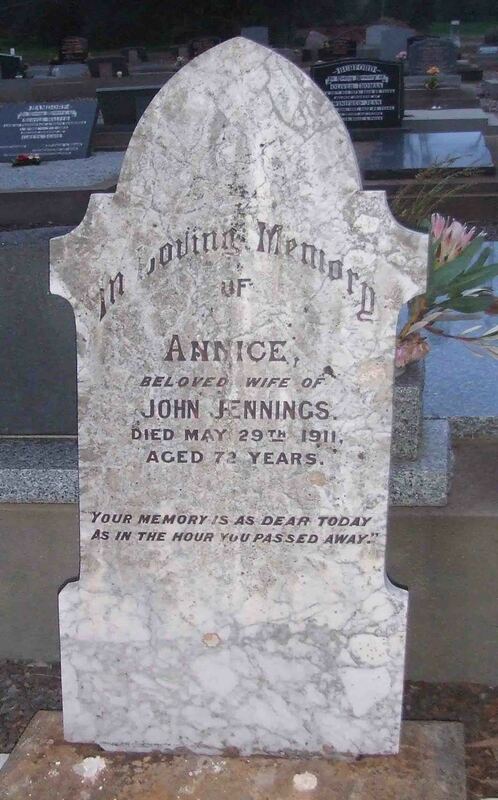 Or perhaps I could call it immortalising the grave. Anyway it was just the right shape and has that lovely old gothic look that I want for Mortimer. May Annice forgive me. That reminded me to look through the graves and see if there were any names for Grandpa Grimstone. I haven’t given him a first name yet, and while part of me wonders if we can get away with just calling him Grandpa, it doesn’t seem to sit quite right with me. Paula found the perfect name on one of the headstones: Elcho. I wasn’t sure at first, but it’s growing on me. Elcho Grimstone. What do you think? 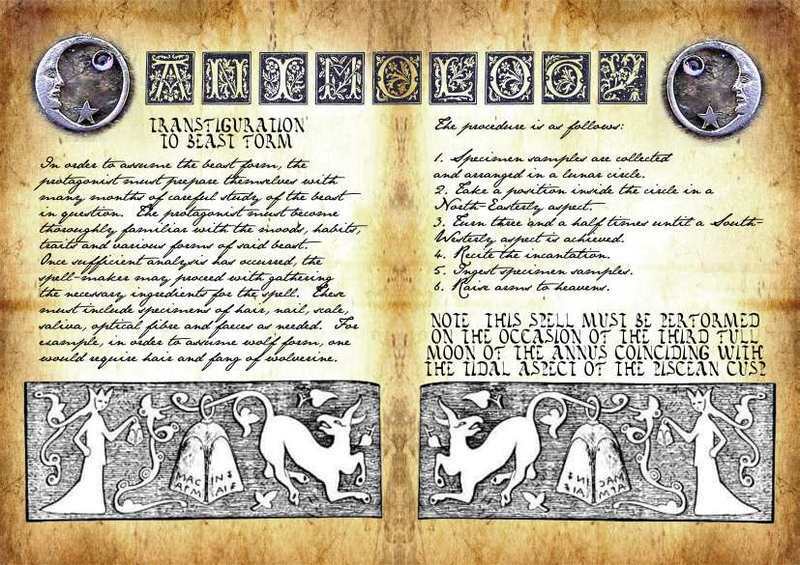 I’m warming up to it, especially after I doodled it on a pad and added various gothic points and swirls to the text. It looked great. So Elcho Grimstone it is. Speaking of which, my camera managed to recover from its zoom error in time for me to snap a couple of pics of Elcho Grimstone just before we left Melbourne. He’ll get posted here in a couple of days time, so stay tuned. And before I go, I can’t resist posting this photo of Jesse which I took last night at the cemetery. He seems to be really getting into this trip, enjoying the new places and adventures, though he wasn’t so rapt at having to do an after dark poo into a hole in the ground next to the cemetery. I feel like a good mama because I’ve been finding plenty of opportunity to do homeschoolish things with Jesse. He’s getting much more of my attention now that I’m not so distracted with the rest of my life. He asks for his maths workbook and we pull it out and do a couple of pages each day. For two nights running we showed him his travel journal, and encouraged him to tell us what to write for him. Last night he found the journal himself and asked me to write for him. Before we left, every time we talked about going to Alice Springs, Jesse said, “Let’s talk about the dead stuff we’ll see on the side of the road.” Well we finally saw our first “dead stuff” – a fish, strangely lying next to the van. Jesse took a photo of it, then kicked it back into the river, where we snapped another pic. This morning I need to find somewhere to print his beloved fish photos ready to go into his journal. At last you get to see the finished Elcho Grimstone. Actually I think I will need to do a little more work on his feet to get them to “sit right” as he walks, but that can happen later. In the meantime, please consider him finished. I snapped these pics just as we were heading out the door for our trip. I’m not totally happy with them, but hopefully later I can take a lovely one and include him in a family portrait of all the Grimstones. He turned out a bit stuffier and more butler-ish than I intended, but I’m going with that and I now rather like the effect. I’ve been planning, dreaming, and collecting miniature bottles and trimmings ready to decorate the spell book when I get back from our trip. 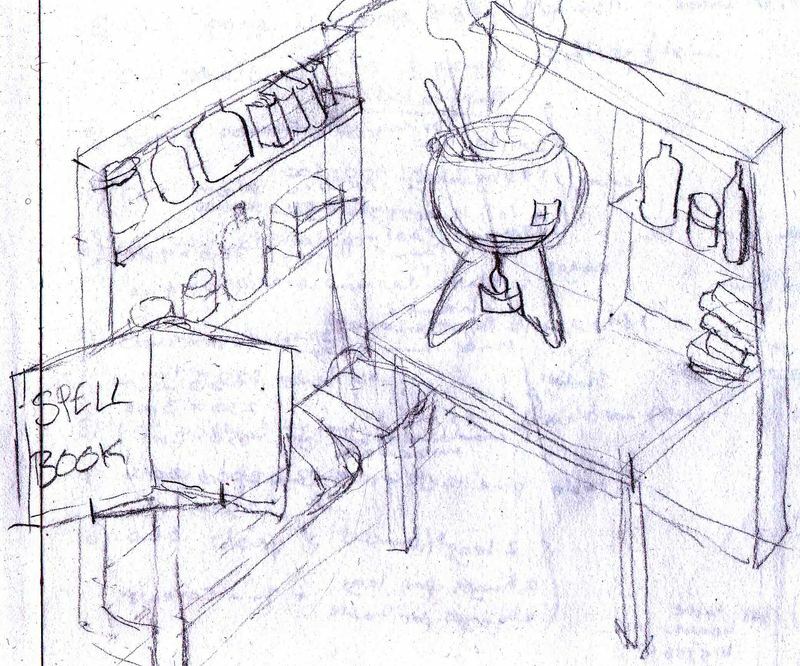 Here’s my concept sketch which shows all the stuff I want to make and how I’ll set up the inside. It’s been far too long since I’ve posted and I seem to have gotten out of the habit. But today I put the finishing touches on setting up my computer from scratch, so I no longer have any excuse not to post what I’ve been up to. Last week Gabrielle came to town in her wonderful capacity of Artistic Director to help Paula and me make a start at turning the five Grimstones into an actual show. I loved her approach – she got us workshopping each character and making up “signature moves” for each of them. What a great idea – I would never have thought of that, even though I’ve done exactly that when making up a character for me to perform. I was particularly grief-stricken because the script I’d written for the show went (ahem… the way of my computer…)…. and the thought of rewriting it was just too daunting. However I did get inspired enough to sit up late one night with a pack of index cards (how low tech of me!) and create a story board. We managed to work our way through most of Act 1 before Gabrielle had to leave, and Paula and I have heaps to work on. 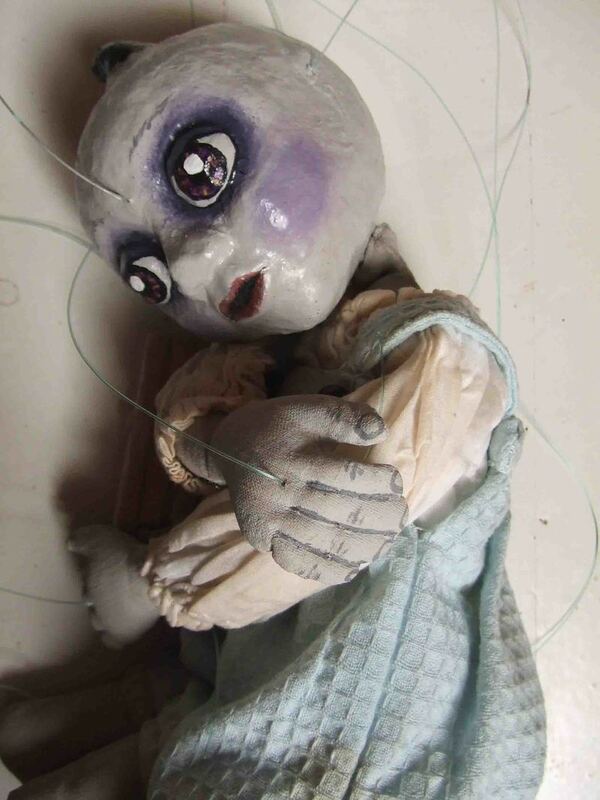 The best bit for me is the discovery that by rehearsing the show, I will learn how to manipulate the puppets. I was panicking that I would need to put in several months of manipulation practice, but actually it all started to come together quite quickly during the week, so that’s a relief. I can focus on building the set instead. 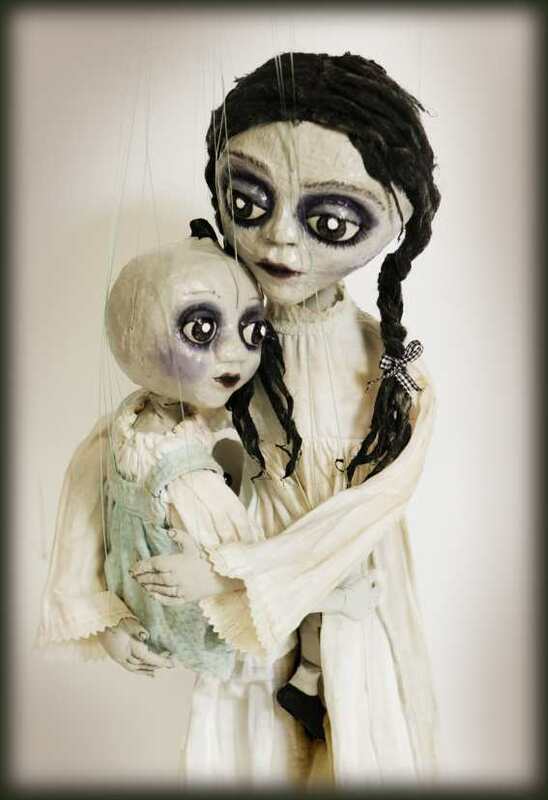 Paula, who has never moved a marionette before this week, is also delighted to have been guided in so gently by Gabrielle, and now feels the task of learning how to manipulate them is somewhat more manageable and less daunting. She’s doing a great job. 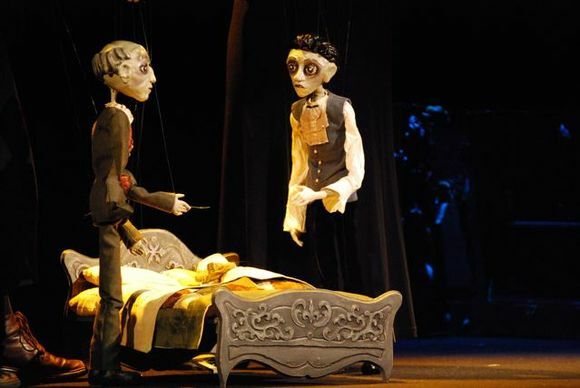 And it’s wonderful for me to watch the puppets come to life in someone else’s hands. I get a bit of a distorted impression by looking down at them while operating them myself. And now that Gabrielle has gone, I’m fiddling with the set, working out details and playing with all the bottles and weird objects I’ve been collecting from op shops in the last several months. I settled on a plan for the bottles in Elcho Grimstone’s magic workshop, and snapped these pics so I can remember which bottles go where. The empty spaces on the shelves are waiting to be filled with old books. I found a parcel on my doorstep this morning and look what was inside! 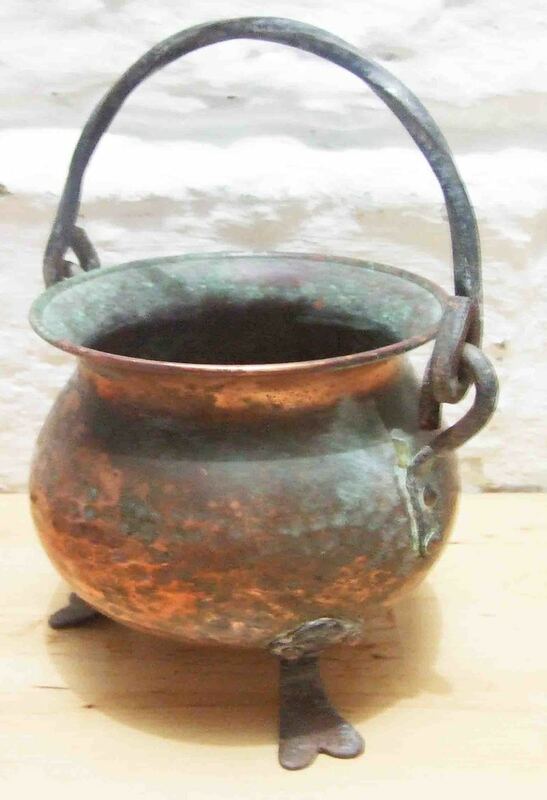 This fantastic cauldron I bought on ebay for The Grimstones. I have been planning to make one, but we really wanted to be able to put a candle underneath to have a little live flame – which means I can’t make it out of papier mache. I’ve been scouring the cheap shops, the homewares shops and the op shops for a cauldron for months now, and nothing’s turned up. But luckily I thought of ebay. The seller was explaining that it just needs a bit of a clean – I’m so happy she didn’t clean it – the green corrosion looks wonderful. I did have one day in the last three weeks when my symptoms abated a bit, when I though I was getting better (only to get slugged hard the next day with the next round of symptoms – yuck). I took Jesse with me to my family’s factory and we made some modifications to the Crypt book I’m working on. 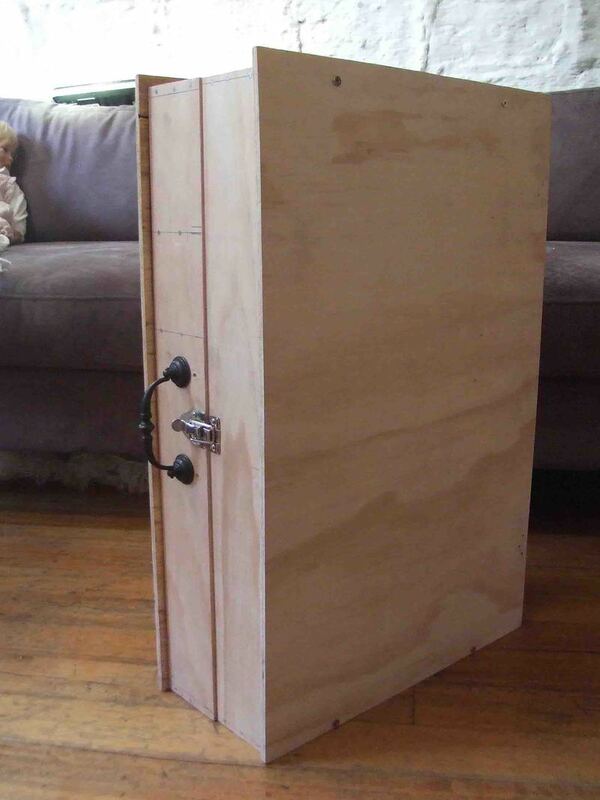 When I knocked it together a few months ago I made some errors in measurement and the coffin didn’t fit inside. Anyway, painstakingly assisted by Jesse, the coffin now fits. I also got to have a good chat with my dad who was really helpful with determining what lights I would need to light the books, and which parts to buy to make it all work the way I want it to. He had on hand his catalogue from a particularly cheap electronic parts supplier in Sydney, and he whipped up an order for me and had me fax it off. He said the parts have arrived, and I can’t wait to get a gander at them, but I’ve been to sick since to go back. One day soon I hope. Anyway we we got home from the factory, I worked into the evening, putting the wallpaper on the back of the Crypt, painting and lining the coffin, varnishing the inside of the book. Paula snapped this pic of me nailing down the lining. It felt so very good to DO something for my Grimstones after a week in bed. 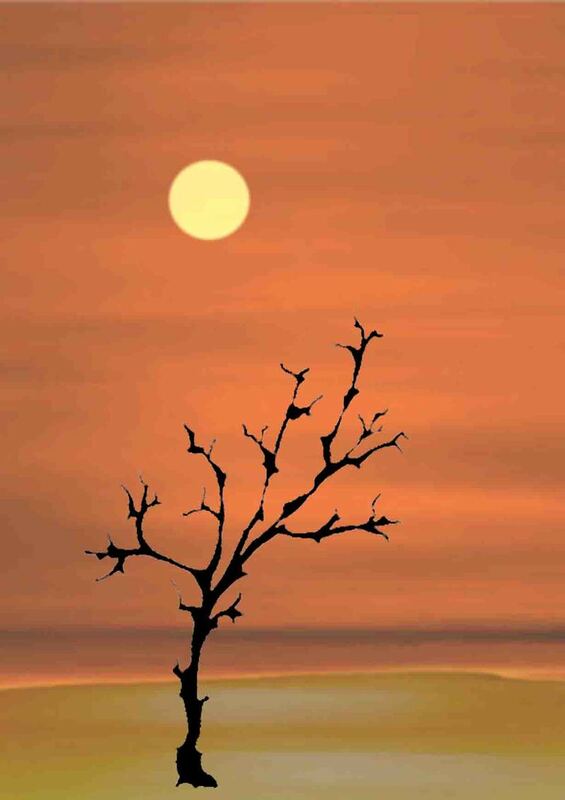 I’m not a big one for still-life, but I drew this tree and photoshopped it into this lovely sunset, and I have to say I’m quite pleased with this. 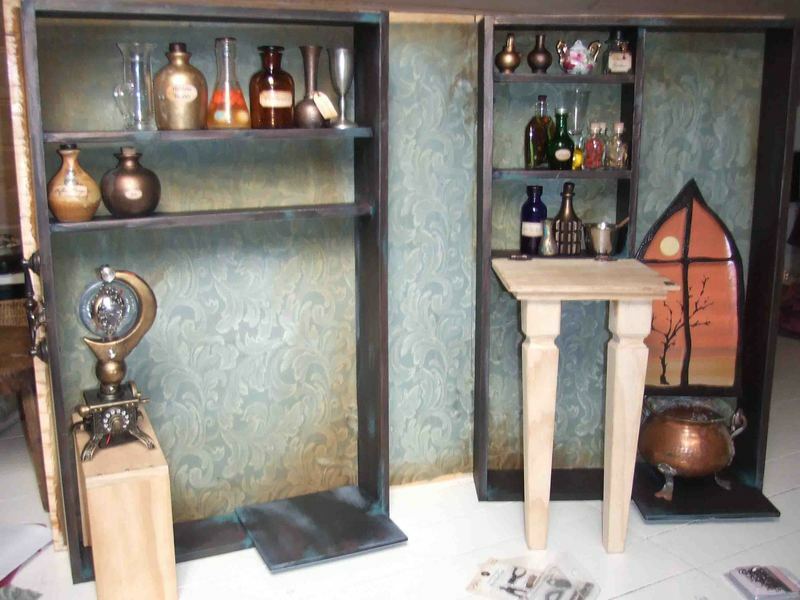 I’ve been building the set for The Grimstones. 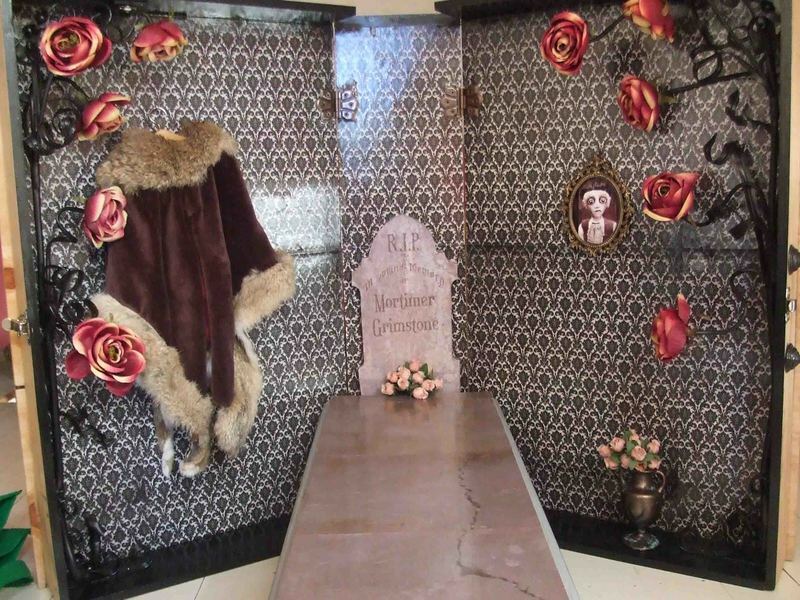 The Crypt is nearly finished now – I’m dying to show you a photo but I’m waiting on one last item I’ve ordered from Ebay – as soon as I have it then I’ll snap a pic and post it. In the meantime, I’ve started work on Elcho Grimstone’s Magic workshop, in which there’ll be this delightful gothic arched window, which needs something behind it. Hence – the tree at sunset. I can’t resist posting a pic of this window which Paula and I made. Luckily for me Paula is always happy to chop along any line with a jigsaw, so I get to watch my designs turn into perfect creations. 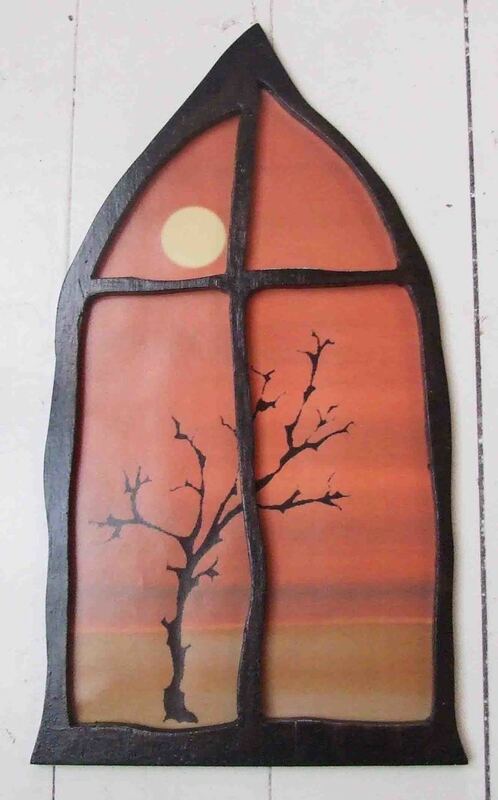 Then I sanded it and painted it, and popped my sunset behind it. Can’t wait to see it in Elcho Grimstone’s workshop. 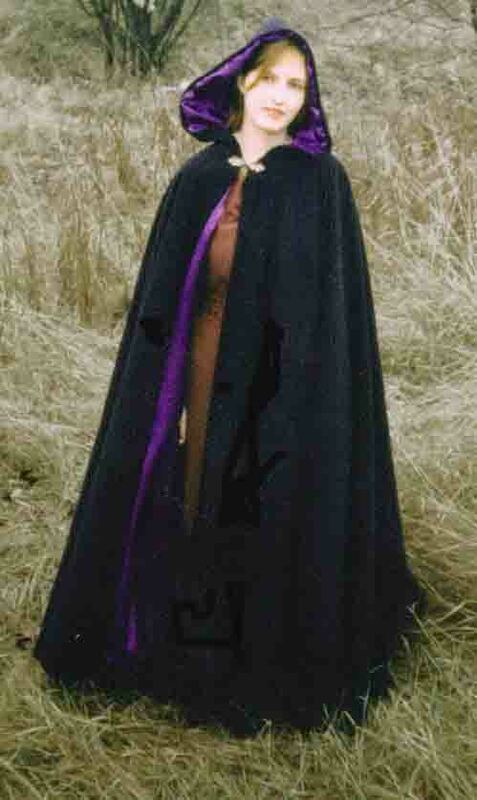 So, all that political ruminating aside, doesn’t the cloak look great? It’s so soft, it hangs beautifully, and it looks great on Mortimer too. I tried to get a pic of that but no go – holding up a marionette in one hand and snapping a pic with the other – they all came out blurry. I can’t believe how patient my dad is. Yet again I parked myself next to his desk at his factory and proceeded to harrass him with a million questions, and amazingly not only did he not seem to mind, but he applied his creative thinking powers (which are impressive) to help me work out what to do. I think it helps that my questions are non-standard. I learnt as a kid that if I asked him to show me how the VCR works he’ll tell me to figure it out myself. But if I ask him, for example, how I could create a hurricane detection device for Elcho Grimstone from a plastic wand with a ball on top that lights up and whizzes around when a button is pressed, and a cigarette lighter which has been ponced up to look like an old fashioned telephone, well, he’s a bit more interested. I have also learnt that a key part is showing some initiative, so I didn’t present the wand until I’d basically taken it entirely apart. “Paula couldn’t undo it either,” I protested. As it was he couldn’t undo it himself, and he broke it off for me. And there we were, peering at the gizards. “That’s the speaker,” he said, “And that’s the integrated circuit.” Ah ha. Once he’d identified the parts for me, I was able to consolidate my theory for the hurricane testing device, and got to work, removing the speaker, preserving the thing that makes the ball whizz and so on. 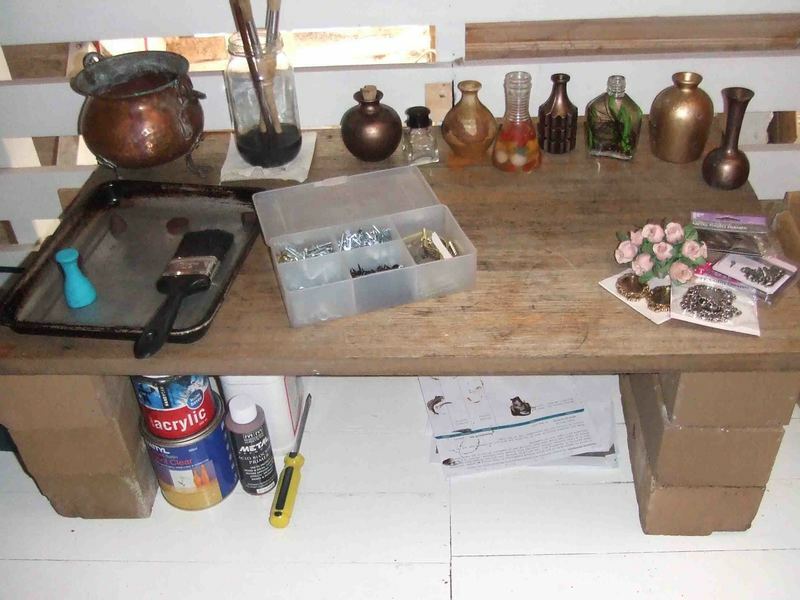 You can see in the pic all the pieces, which I’m in the process of painting gold (I don’t think Elcho Grimstone would have a mauve wand with plastic hearts all over it – not quite his style) and decorating. Soon, I hope, I’ll be posting a picture of the completed device. Fingers crossed. Wow, am I ever pleased with this. This is the finished Hurricane Detection Device. I reckon it has come such a long way from that purple plastic wand, and somewhat less further from the cigarette lighter toy telephone. I reserved the handset from the phone to use as medical testing instruments – not sure how they’ll work yet, but they’re definitely too good to waste. 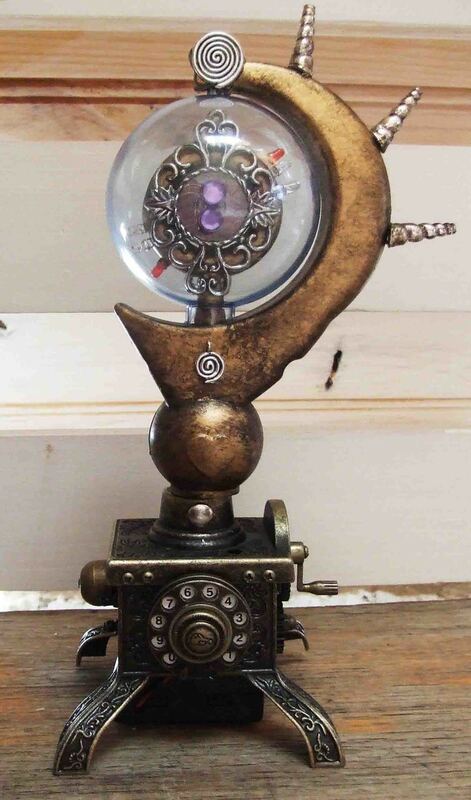 Anyway, in the middle of the dial on this phone, there is a button, and with a hell of a lot of fiddling, I managed to mount the switch from the wand behind it, and so now when you press the button, the ball lights up and spins around. It took me some eight hours to make this. I’m not especially dextrous when it comes to electronic circuitry, and as my dad predicted, several of the wires snapped off and I had to resolder them. 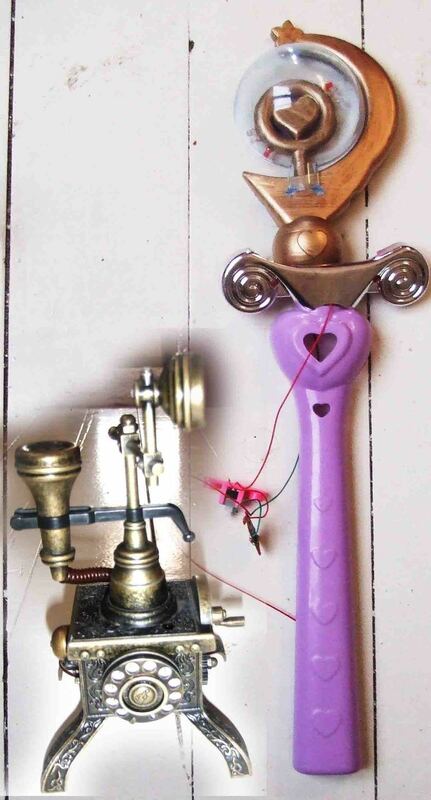 Actually first I had to find the diagram I made when I first opened the wand, showing all the connections. That stressed me out – that damned piece of paper eluded me for several hours and I knew that if I took a guess at how the wires should be, there was a fifty fifty chance I’d blow the whole thing and the circuit would be stuffed. In the end the drawing turned up and I got to solder it all correctly, and then assemble my new machine. Our house is tiny. There’s three of us living in this wee little cottage which has a bedroom big enough for the beds (no floor space leftover), a main room which is the lounge, kitchen and dining all in one small space, less than four by six metres, and then above it is a loft, just high enough for me to stand straight in the very centre. The loft is home to our bath and to a nice big sky light. It’s warm in winter and nice and bright. Paula helped me set up this “desk” in the loft and I’ve turned it into my workspace, after months of taking over the lounge room for hours at a stretch, and then being forced to condense everything down to a few boxes after each session. This space I get to leave set up, and I store the props, sets and tools in other boxes beside my desk. I have so bonded with this space. 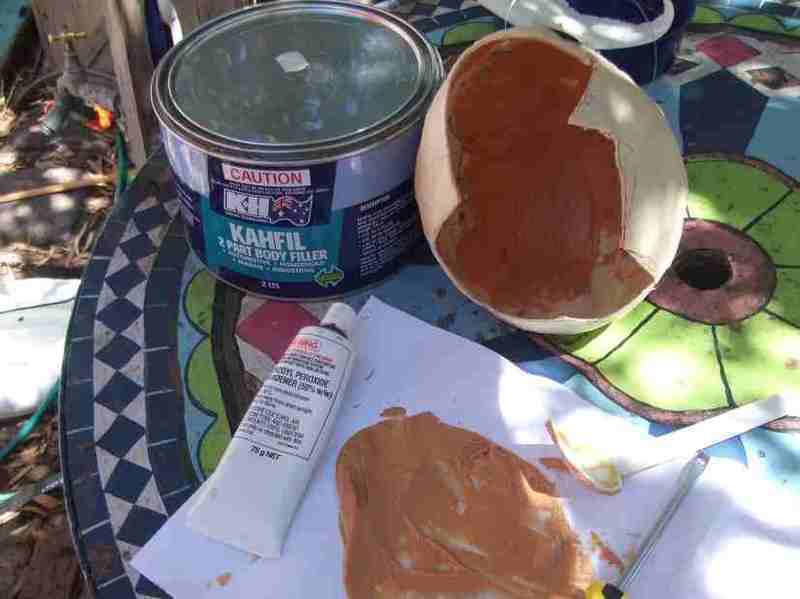 I love pottering around up there, dipping my brush into a jar of water I keep permanently at the ready, and then slipping another coat of metallic paint onto whatever items I’m working on, or another coat of varnish, or a quick batch of araldite to glue something on. It’s so satisfying to have it all there ready to go, so I can even make use of five stolen minutes while Jesse’s on the toilet. 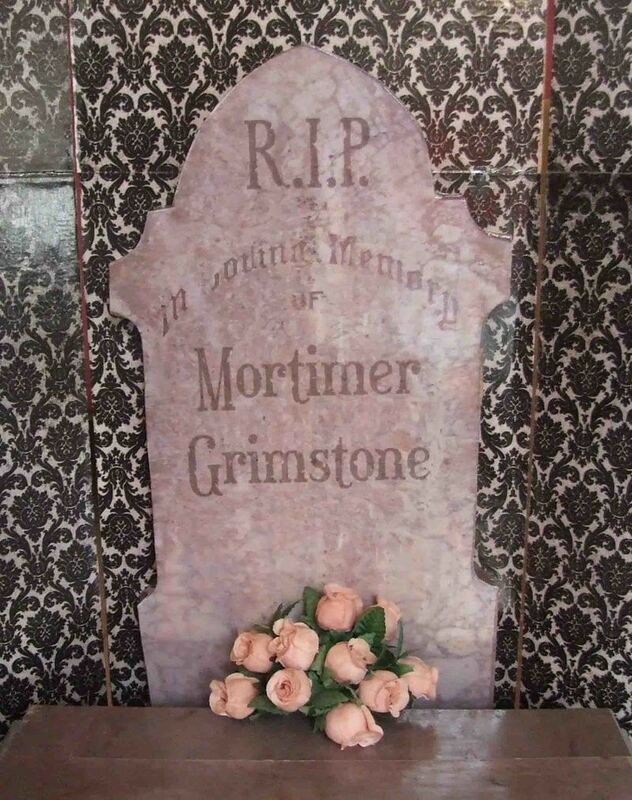 Finally, as promised, I get to show you Mortimer Grimstone’s Crypt. I think it’s beautiful – I’m so very happy with how it turned out. I am so frustrated, trying to get the magic workshop to come together. 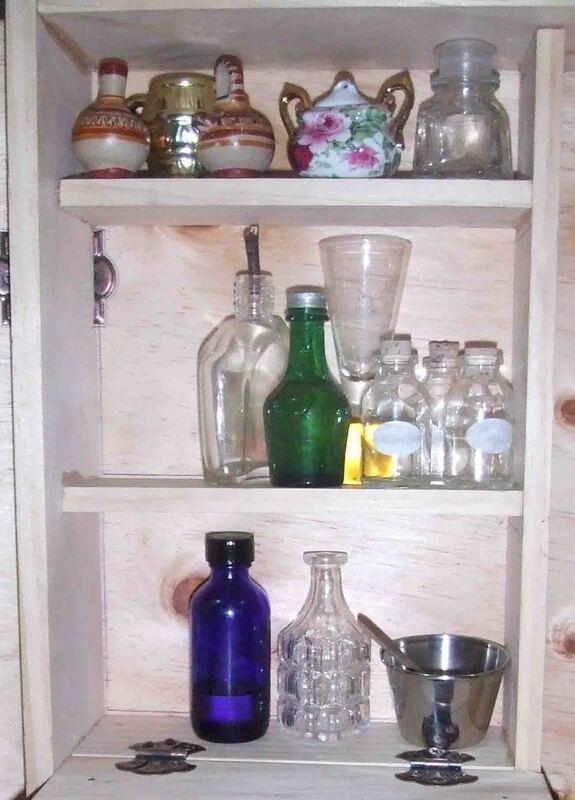 I painted and labelled and filled all these jars and bottles to use and they look wonderful. But when I set them all up on the shelves, the whole thing looked crap. It was the shelves making the problem. I thought I’d cover them with paper printer with photos of old wood, so that the shelves themselves would give them impression of being made of old wood. Well it so didn’t work – after spending hours and hours carefully lining the shelves with the paper, it looked tacky. Right up there with dracula cloaks and worse. It looked like Jesse’s toy pirate ship. Yuck. So I sanded that back, whacked on some black paint, and then tried to “age” it a bit with splashes of paint. I thought that also looked tacky. 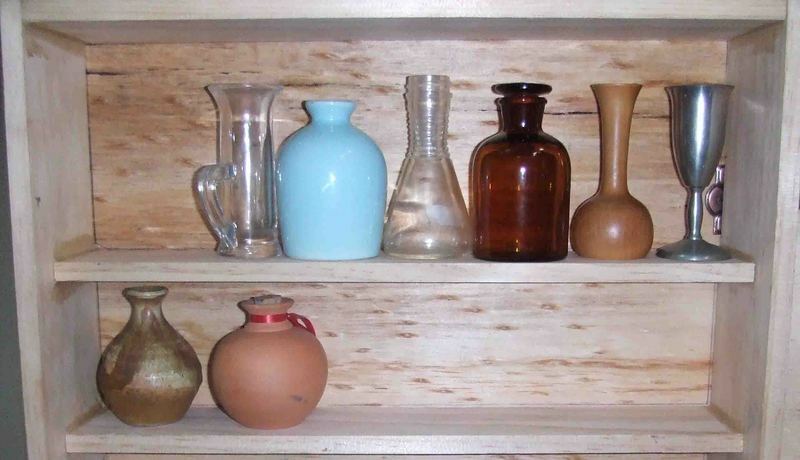 I tried arranging the bottles on the shelves, and propping up the window, to get a bit of an idea, but then a worse thing happened – it looked like the aesthetic was straight out of the seventies! No! The orange sunset behind the black window was definitely contributing to that effect, but even after I removed the window, the seventies aura remained. I called in Paula and her brother Mark as my consultants. Neither of them was particularly affected by a “seventies aura”, but Paula did recommend I change the sunset – the orange hues defintely add to the seventies effect. So that’s got to go – I think I’ll be posting yet another sunset here in the next few days. In the meantime their other advice is to put more bronze on the shelves so make the paint splashes more subtle, and go with that. Ok. Stay tuned…. Anyway, I printed out some of the books I made, propped them up on the shelves as if they were real books, and the workshop was transformed! I felt that glimmer of inspiration again. The excitement that makes me just want to tinker and potter away to make the whole thing come together. No photo yet of the workshop with the books. I’m thinking, rather than using wooden blocks inside my printed covers, I will try salt dough. 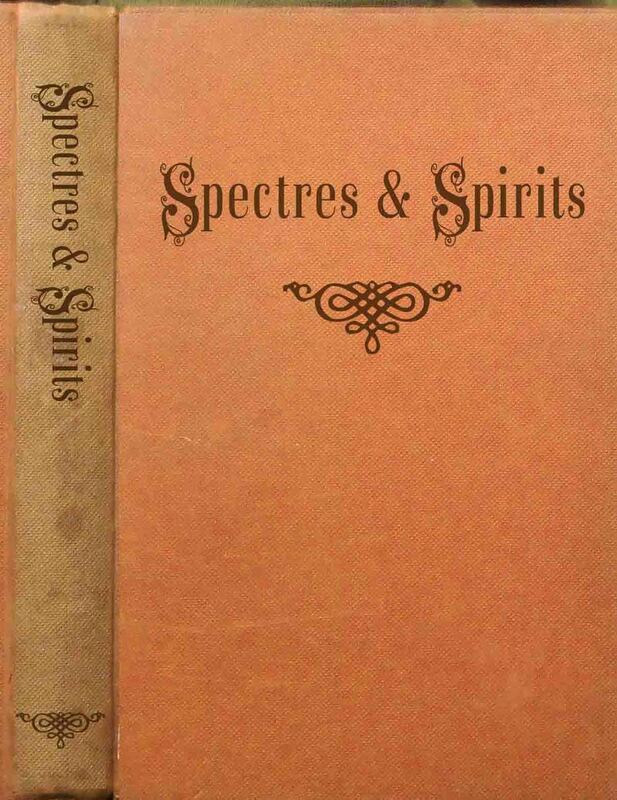 That way they can have a more organic appearance – more like old books rather than new ones. We’ll see. Salt dough is amazing. You simply mix a cup of salt with two cups of flour and almost a cup of water, knead it for a bit, and there you have it. You dry your pieces in the oven at about 100 degrees celsius, for about three or four hours, or else two hours per centimetre. I found it pretty quick and easy to make some books, and they’ve definitely ended up with that organic feeling I was after. It has such a wonderful texture I decided to try making a “brick” fireplace to house the cauldron. 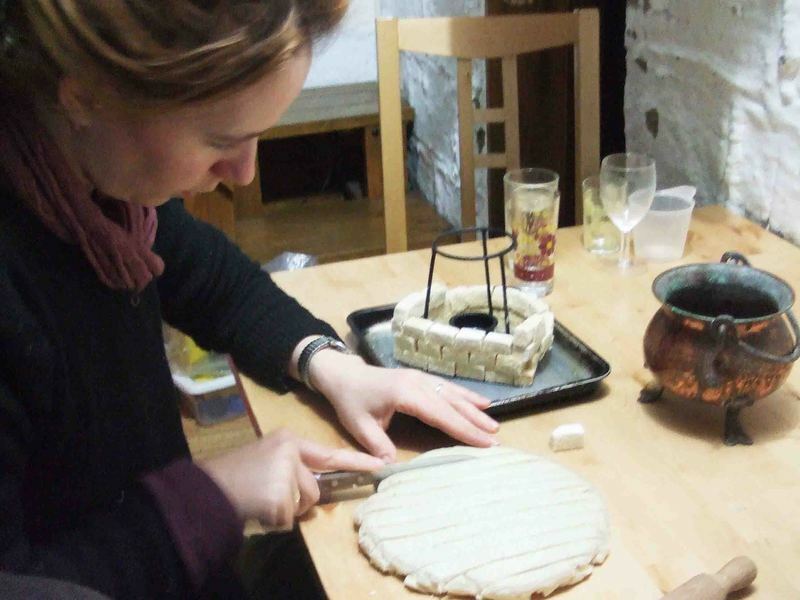 You can see me here cutting bricks from my dough. The fireplace looks fantastic – it’s nearly dry and I can’t wait to paint it. The salt gives it this incredible masonry texture – you could almost believe that the bricks are real. I’ve been working steadily on Elcho Grimstone’s magic workshop. 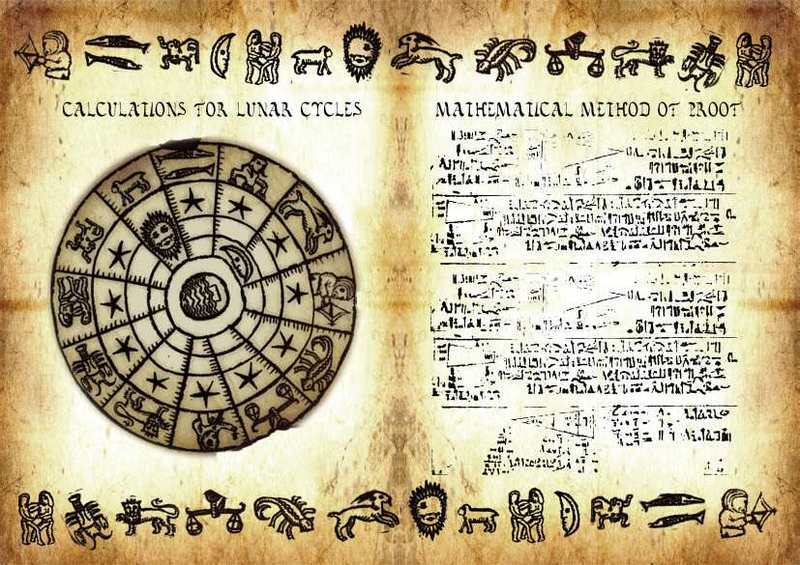 I found all these wonderful ancient maps on google and have glued them to the wall. I also made this tool board for him with miniature tools I found in a scrapbooking shop. I sewed him a small pile of cushions out of old teatowels, and I’ve stained a tiny teacup with mock coffee grounds in the bottom. You can see him here, resting against his cushions and having a good read. He looks comfortable, eh? I think I’ve finally found the use for the other rabbit skin. I’ll put it on the floor for him to sit on. By the way this is very much work-in-progress. Lots more to do in this corner: tacks on the corner of the maps and anatomy posters, a half eaten shortbread biscuit on the tea plate, handwritten notes tacked over parts of the maps and more… it’s still a bit neat for my liking. 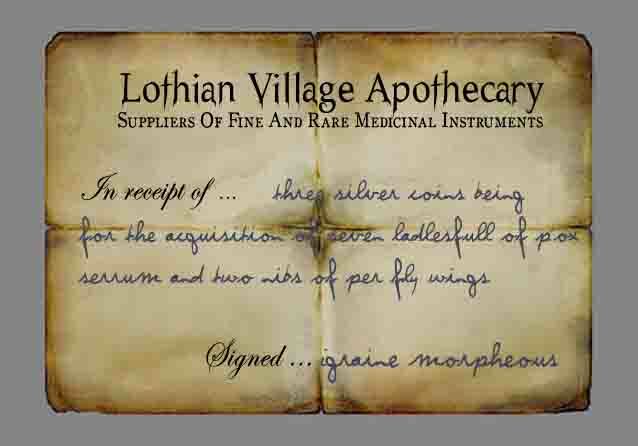 I’m having the best time making notes to put on the wall of Elcho Grimstone’s workshop. As usual, Paula was a wonderful source of fantastic and somewhat nonsensical text, all of which fits perfectly with Elcho Grimstone’s character, work and lifestyle. 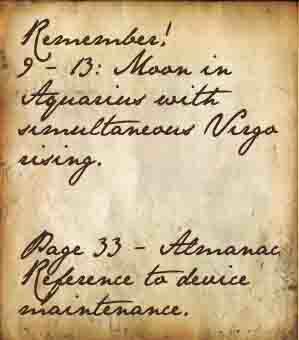 I then fiddled with fonts and backgrounds to make these little notes. Here’s a sampling of them. This year I’ve put in two big funding applications, and I heard about them both this week. The first was to Myer Foundation, asking for money for a creative development for The Grimstones. I kept the numbers small to increase our chances of getting the money, and maybe that worked! Now Paula and I are actually GETTING PAID to rehearse the show! Wow! And I don’t have to pay Gabrielle with my own dwindling savings – Myer Foundation pays for her too. Whoo hoo. And then, to really sweeten the deal, we worked on Act 2, and completely choreographed it. Act 2 was so complicated, so many little twists, and it’s been a long argument about how to portray it – and then Paula came up with a brainwave. A wonderful plot-simplification which works perfectly. 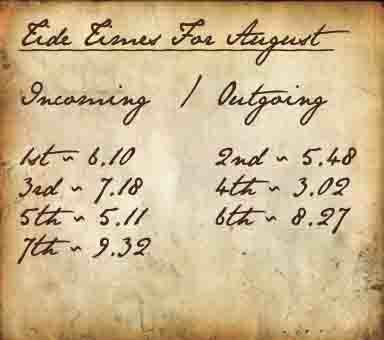 So now Act 2 is shorter, sharper, and heaps easier to perform. Go Paula! And Gabrielle reckons we may be about ready for a little showing…. very exciting… though I really feel so far from ready. Much more rehearsal needed, and it’s so hard to find time away from our little boy to actually rehearse. Doing it with him around – it’s impossible to focus. The funding that didn’t come through was the Laneways Commission. I had this idea of doing an exhibition/installation of The Grimstones, in which their story is told progressively by changing the installation each week. 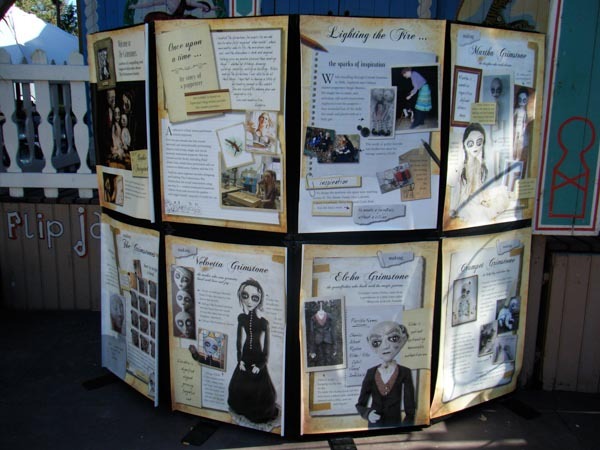 And a few times a week the puppets “come alive” as we take them out of the display to do live performances, the show different each week as the story progresses. I knew the Laneways was a bit of a long shot – not because the idea is bad but because it’s a LOT of money, a massive project, and I’m slightly too new to this area to be picking up such big funds. Last night, though, Paula made a very illuminating comment: “The Grimstones is set in a cold climate, and Mortimer puts on a fur-lined cloak to go and fight the hurricane. BUT… hurricanes occur in tropical climates – there’d be no fur-lined cloaks for the fighting of them.” Hmm, bugger Well that’s a bit of a hole in the story. A blizzard? That sounds so very England. Maybe it’ll have to be a storm, rather than a hurricane. So stay tuned, the Hurricane Testing Device may soon be known by another name. 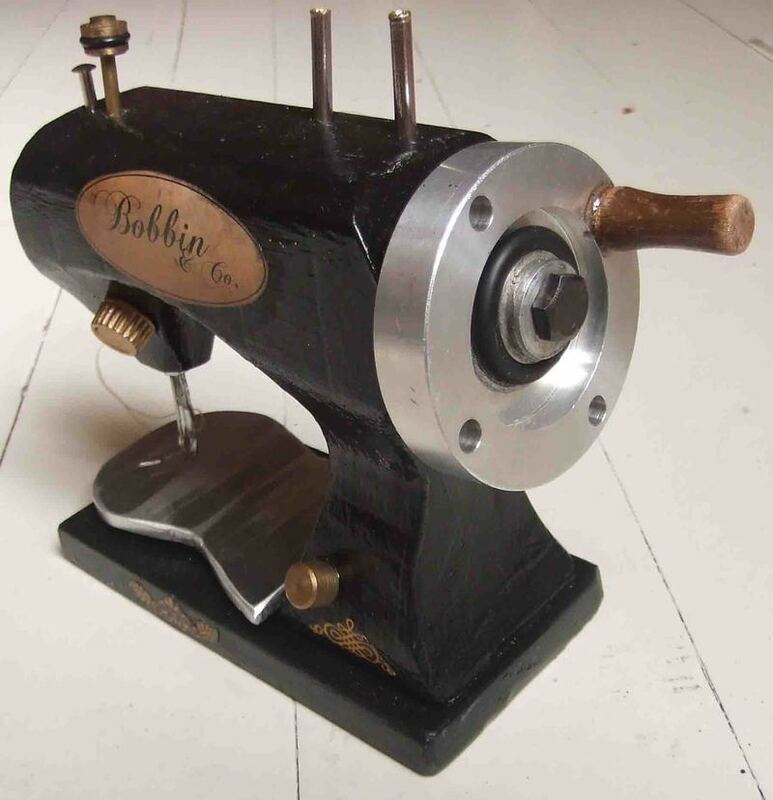 I’ve been working on a miniature sewing machine for Velvetta Grimstone. I was going to buy a toy one on ebay, but by the time shipping to Australia is factored in, it seemed so very expensive. I’m really trying to keep costs to a minimum with this show. 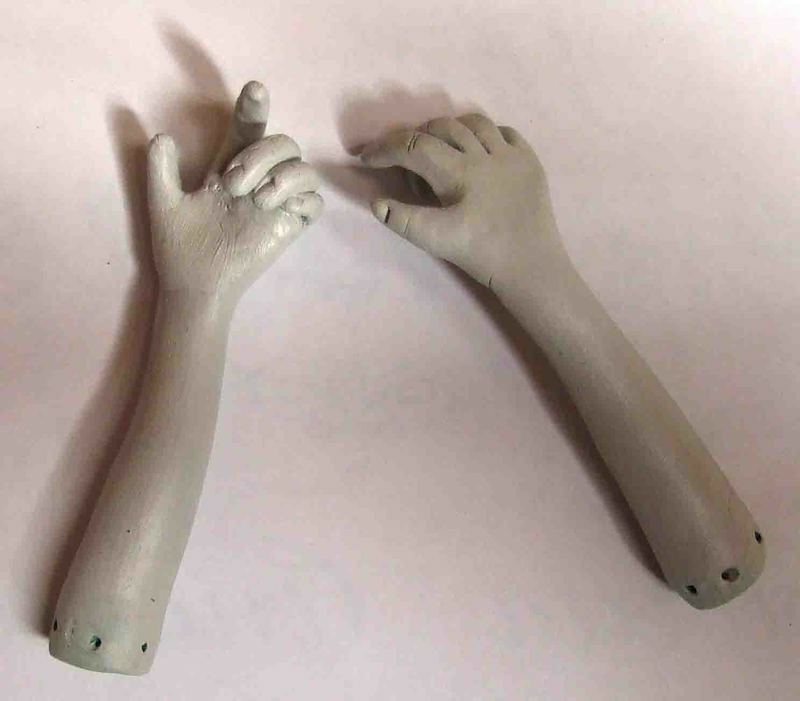 Also I would have to wait weeks for it to be shipped here, which means weeks until we can rehearse with this rather crucial prop. Happily ebay turned out to be a wonderful source of inspiration, and I decided to design and make my own. 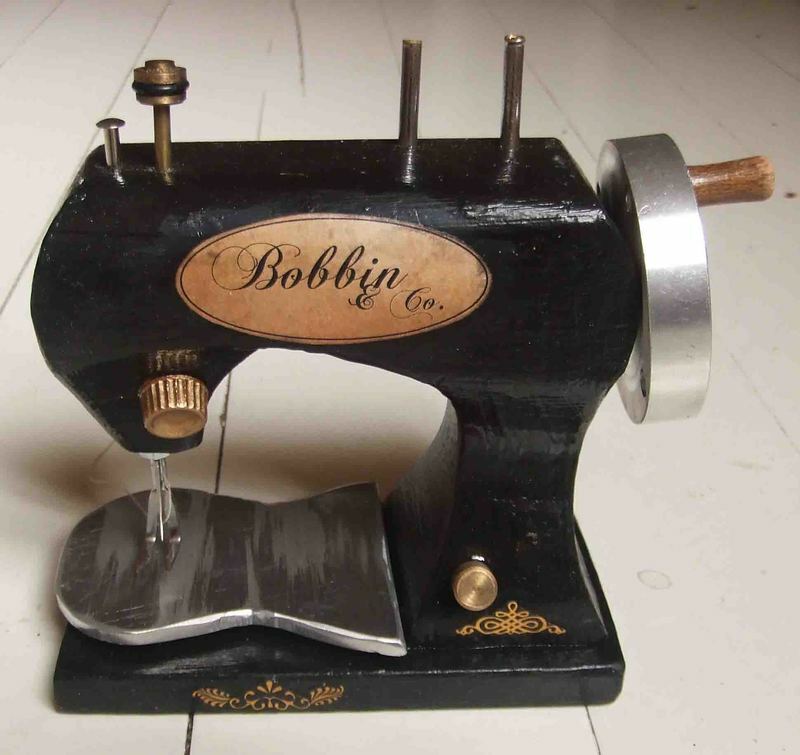 I was secretly relieved – I have been looking forward to making this machine for a long time. I’m so happy with the finished product. And you’d never know it started out life as a roughly chopped piece of wood. Funny how some days you just feel a bit flat or cranky and other days you feel sunny inside, not necessarily for any reason. Yesterday was one of those flat days. I started out in the mood to hit Brunswick St, browse in the shops, eat or drink in a cafe. Or maybe catch the train to the city and go for a yum cha. Or head to Savers and look for a sarong to cut into pants for Jesse. What I did instead was force myself to work. In two weeks Paula and I will fly to Sydney to “Pitch” – we get 5 minutes to “sell” The Grimstones to potential theatre venues, festivals and other presenters. 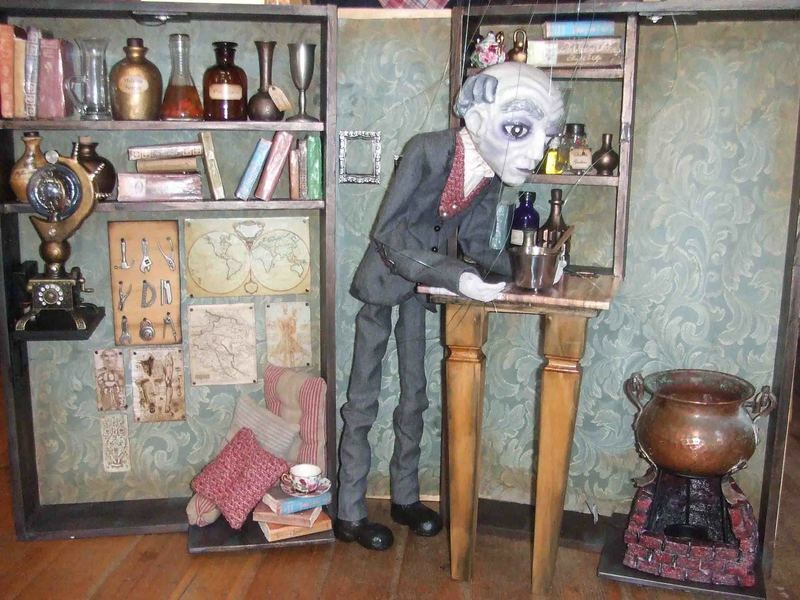 I want to bring Elcho Grimstone’s lab and a few marionettes so we have something to show as well as tell. But this means I need to get the lab to a state where it can be flown, to a state where it looks good enough to show and tell. There are many unfinished details and I’m trying to concentrate on getting the important ones under control. I haven’t worked on The Grimstones for a few weeks, and I’ve really enjoyed my break. I didn’t quite feel ready to return to the project yesterday morning. 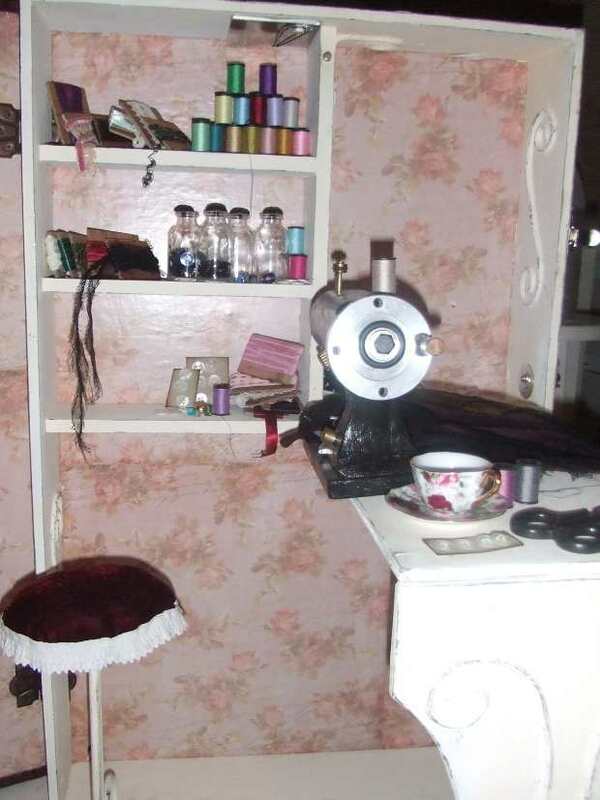 I’ve included this picture of Velvetta with her sewing machine as a little bit of inspiration – I snapped it before I started by break and it’s so nice to see her at work. When I started my raw food thing [http://fixiefoo.typepad.com/fixies_shelf/raw-food-dont-aim-for-a-1.html] , I suddenly lost all inspiration for working on The Grimstones set, much to my frustration. Rather than plow on, I just stopped. Then when I was flying to Sydney for The Pitch [ http://fixiefoo.typepad.com/fixies_shelf/2007/11/the-pitch.html] , I had to start work again anyway, because I wanted to cover the outside of Elcho Grimstone’s lab so I could bring it with me. 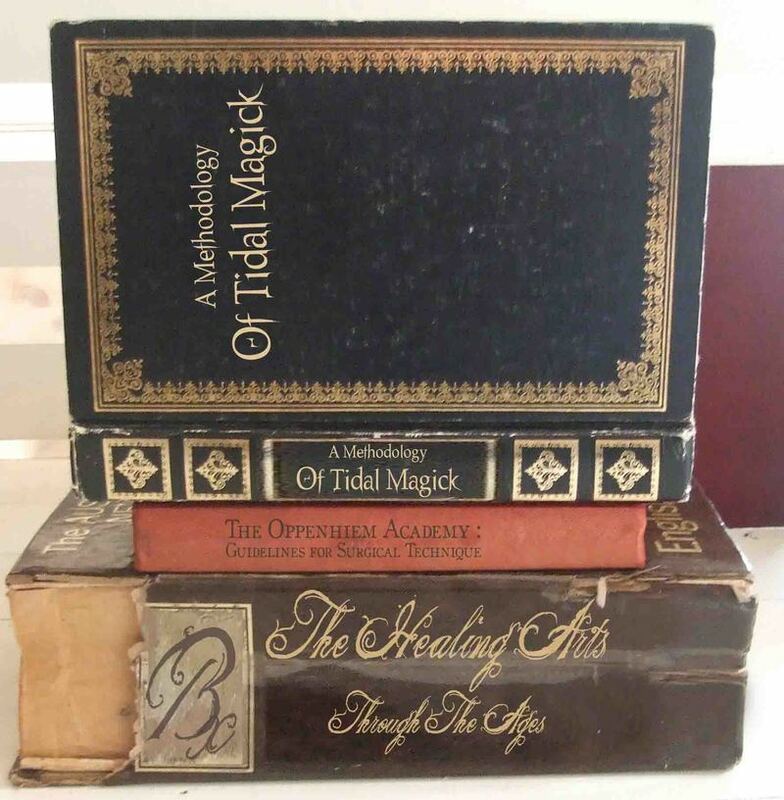 And then when I got back, I thought I should cover the outside of the other books while it was fresh in my mind how to do it – I knew if I waited till I returned from my trip it would be hard to remember what I’d done, and it would feel more daunting. So I set about getting the job done. Still no inspiration. I rarely work like this, forcing myself to do job after job, procrastinating and then working slowly because I’m just not in the mood. I thought I was above procrastination – that I’d outgrown it.. Apparently not – how smug of me to presume so. It turns out the reason I rarely procrastinate is actually because I usually have enough inspiration to power me on. Anyway, this week I laid out some fabrics in Velvetta’s sewing workshop, to see how they’d look, and inspiration came flying back! I can’t believe how good it feels. 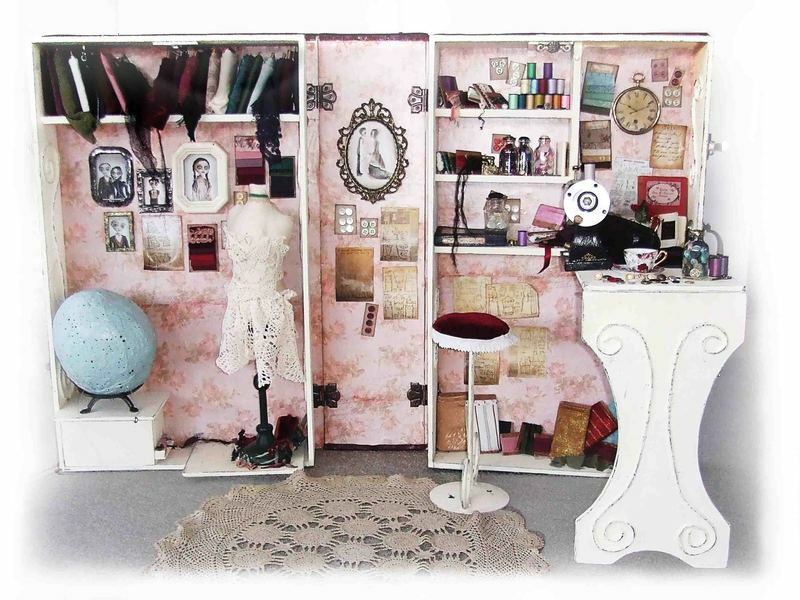 I’ve been up in my lovely little studio again, tinkering away, adding bits and pieces to Velvetta’s workshop. 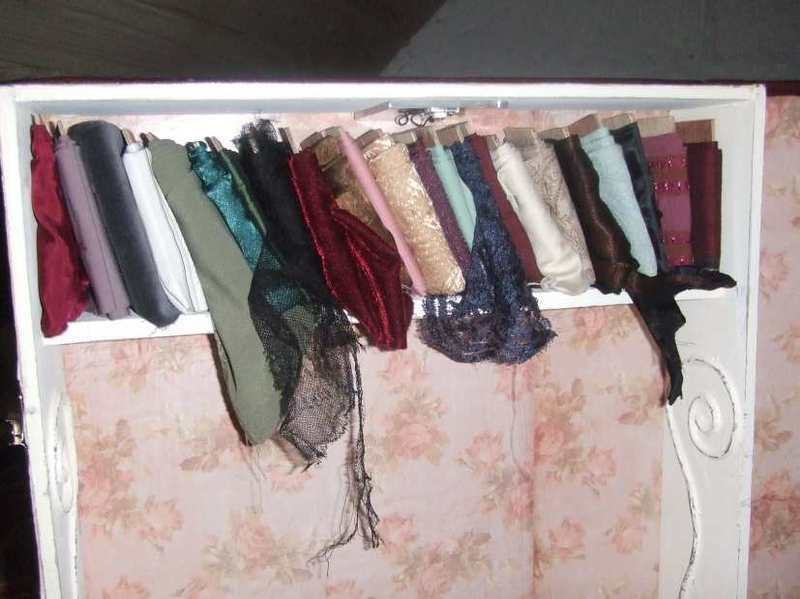 The keyword, in my mind as I’m working, is “Boudoir” – and I picture a photo I saw in a magazine of a woman’s space, filled with lush fabrics like red velvet, floral prints and lots of white. You can see here a couple of work in progress shots. The Grimstones to various presenters and producers who might be interested in working with me to put on the show. This was quite a leap for me – I don’t normally consider that I can afford to shell out for airfares like that. But I booked in, and spent the following two weeks preparing my pitch, and finishing Elcho Grimstone’s lab so I could bring it with me. Check out the lab in the photos – I’m so happy with how it looks, and I can’t believe how good the text on the cover of the book turned out. On Sunday, before we left, I suddenly had a fashion crisis! 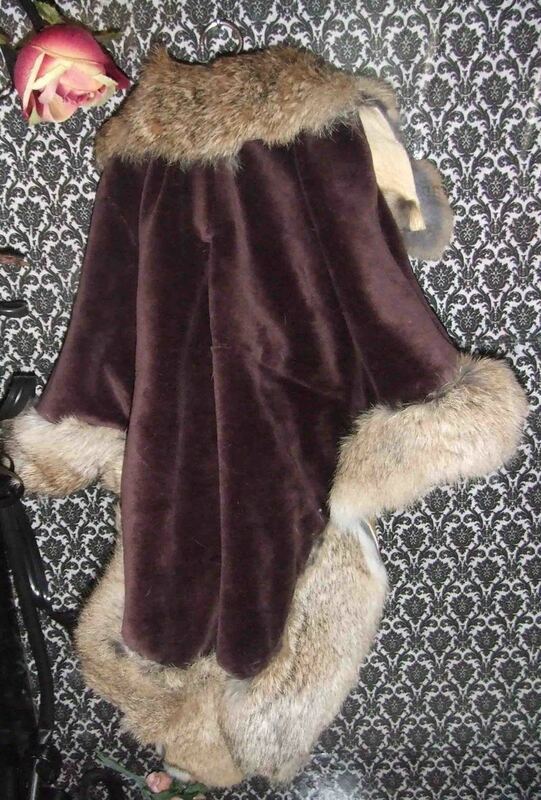 I had assumed that of course I’d have something – just needed to root around in my wardrobe. But what I was looking for was something a touch gothic, which would tie in with The Grimstones, but not so dramatic that it looked like a costume. The outfit would have to be kind of arty, and so couldn’t be too ordinary or conservative (least they think that my art is ordinary or conservative). I was stumped. Even Savers didn’t reveal the right garment. And then it came to me! I whipped up a black version of my wedding dress, and wore it over the top of a long black skirt. Perfect – phew. Not only that but the man’s shirt only cost a few dollars, and I whipped it up in an hour. Anyway, the first hitch occurred when we got off the plane and picked up the lab from the baggage carousel. Despite the “Fragile” stickers, it had obviously been thrown and allowed to fall heavily onto a hard surface. Ouch. Inside many pieces were broken. I went into a kind of shock, looking at my lovely work all in pieces. The worst thing is my beloved hurricane detector, which is going to take me hours to repair. I wished I had my araldite with me for on the spot fix-ups. Paula was incredibly sweet to me, keeping me calm, telling me we can just prop it all together and the audience will never know. Actually this was the second hiccup – the first was when Virgin Blue called us very late at night to inform us our flight was cancelled, and if we wanted to get there before the event started we’d have to be up long before dawn. As a result we’d only had about two hours’ sleep each – hardly a recipe for a dynamic pitch and loooong day. Anyway we got there, I did my pitch and it went surprisingly smoothly – all that practice actually helped. I was so relieved when it was over. The afternoon wore on, with me watching pitch after pitch from other artists, producers and presenters, and as we were getting towards the close, I had a bit of a panic. I felt I’d delivered my pitch the best I possibly could, and yet I was suddenly convinced they’d all reckon I was a complete wanker. So many of the pitches were from companies far bigger, far better established, far more widely toured than mine and I felt like such a small fish. The amazing bit was what happened at the end. As I went to join everyone for the networking session, I was astonished that several people approached me, asking for my business card, telling me what region they were from and how they’d be interested for me to bring The Grimstones there. People I approached, whose pitches told me they were on the look out for artists with shows, greeted me warmly and even enthusiastically! I handed out every single business card I’d brought with me, and came away with a huge stack of cards, each one representing an opportunity for me to follow up, a potential partnership with someone who likes the sound of The Grimstones. Wow! So now I’ve spent the day on a real high. I’m so glad I did it, forked out the money, put in the time and effort to prepare all my props, my pitch, even my outfit. We got home so late, after midnight, and Paula and I were just about delirious. Today has been a tired, sleepy happy haze. I got inspired and added to my Grimstones page – go and check it out if you like. And so, my friends, those of you who have been reading my blog for a while will know what a big part of my life The Grimstones is, and will know how exhilarated I feel to find that there are people out there who really might help me to make it a reality, get it out of my studio and onto a real stage. 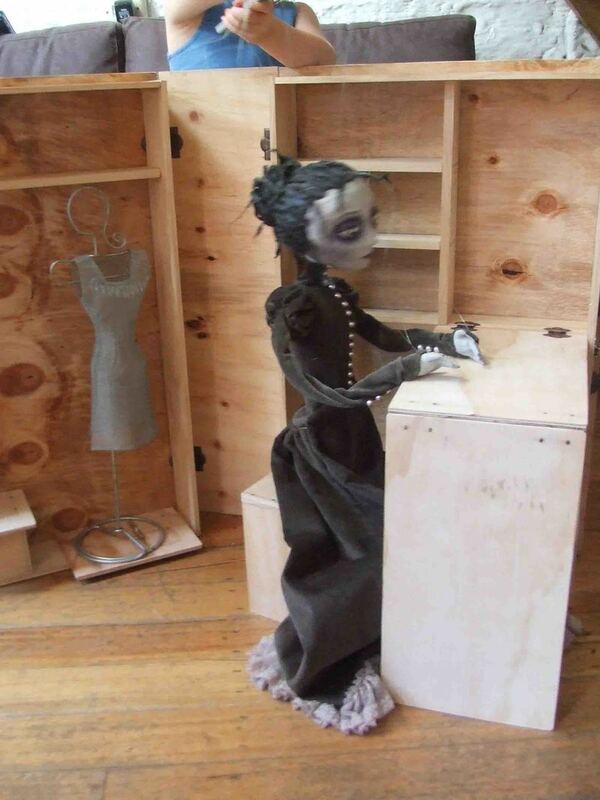 It’s not only Velvetta who is enjoying her new sewing workshop, still under construction, but Jesse too. He pulls out her tiny little stool with the velvet cushion, perches his bum onto it, and gets to work. He likes me to give him an order for something to sew, then he pretends to choose a fabric, place it in the machine, and he painstakingly turns the handle to make it go. It’s ever so sweet to watch him at work. We had our street party recently. It’s not an event that exactly “goes off” with everyone gathering heartily to build our sense of community in our street. But every year a few different new faces show up and I really enjoy discovering who my neighbours are. In fact, it’s a bit sad, that we all live in the same street and so many of these faces don’t even ring a bell with me. May that gradually change. At this year’s street party I got chatting with a photographer who lives only a few doors up from me (but of course we’ve never met). We agreed to do a swap – he takes pics of The Grimstones for me, and I perform at his daughter’s birthday party. I’m delighted. This really highlights the concept of “going local”. So last week he walked past all of two houses to my place and we did a photoshoot. It was so satisfying and so many of the photos are really lovely. Here’s my favourite for today – and stay tuned, I’ll be posting more of the photos as I edit them – they all need cropping and I might add a few borders as I’ve done to these pics. Since our director, Gabrielle left, Paula and I were battling on not only with Act 1 of The Grimstones, but also trying to pull together Act 2, which we’d choreographed with Gabrielle. Somehow it all started going pear shaped. I found it just about impossible to get my head around Act 2 when I was still trying to get the hang of Act 1. It took a nice manageable task and turned it into something overwhelming and daunting. Paula, for her part, was suffering from a crisis of confidence that she’d ever get the hang of manipulating these puppets. Fireworks began to fly and we suspected a relationship meltdown could be in the works. Great. Not. We made an SOS call to Kelly Parry, and bless her, she flew in with enormous angel-coated wings, to save not only our relationship but the show. First step was to postpone Act 2 indefinitely – we’ll get Act 1 up and running, and launch that. It’s a show in itself. Act 2 can happen LATER. In the meantime, with Kelly once a week for the first two weeks, then twice a week, and then the last week before we left for three whole rehearsals, the show has begun to blossom. She has a way of bringing out the best in Paula and me in terms of our characters onstage, and when Paula threatens to bail cos it’s just too much and too hard, she reminds her that her goal of us setting off in our van with The Grimstones loaded in the back, to perform en route to our destination.. well it’s not that far from our reach at all. For me having Kelly there means I don’t need to motivate myself – I simply do as she tells me. It’s so much easier than trying to decide if I have the energy to run that scene one more time or not. 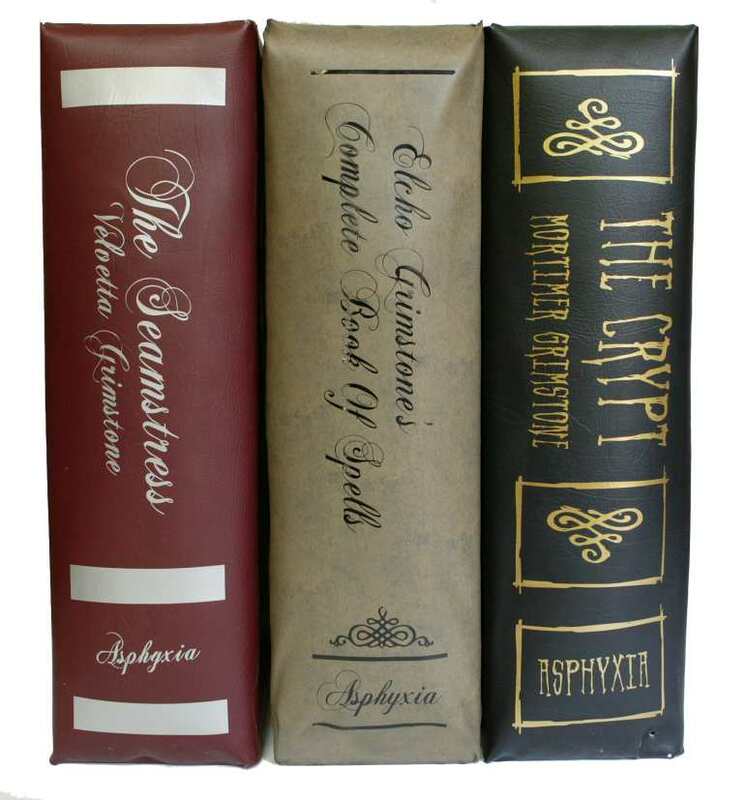 And the image – from the Grimstone photoshoot – the giant books lined up as if on a shelf. 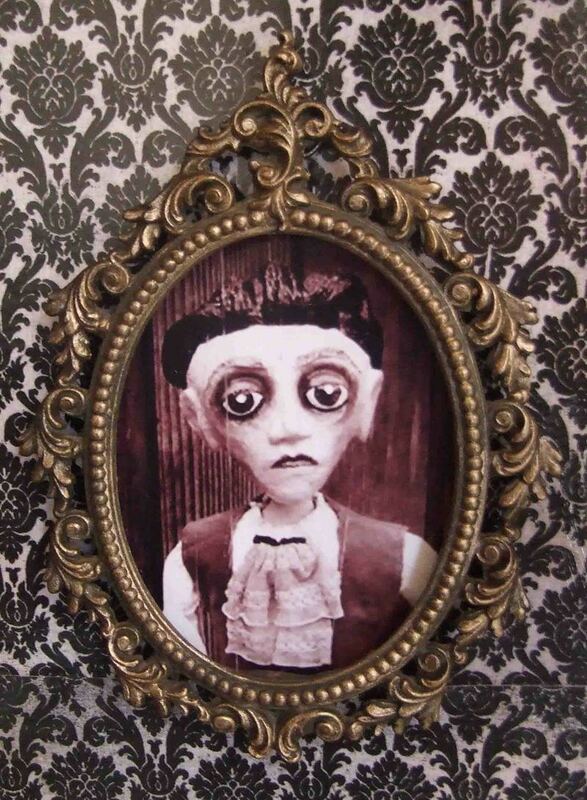 I have a bunch of little picture frames, and I plan to put some family portraits on the walls of the Elcho’s lab and Velvetta’s sewing workshop. For Elcho, I thought an absolute must was a picture of him and his wife before she died. I’ve doctored up a photo so you can see him looking younger. Doesn’t he look great with hair? I also gave Velvetta more hair and changed the shape of her face and mouth a bit. Ok so she still looks young, but, umm, didn’t that happen a lot in those days anyway? Oh dear, now I’m suddenly convinced it looks like a father-daughter photo. What do you reckon? Do I need to change it more to make the woman look older? And for your entertainment, here’s the original photo, so you can see just how far it’s come. I love photoshop. 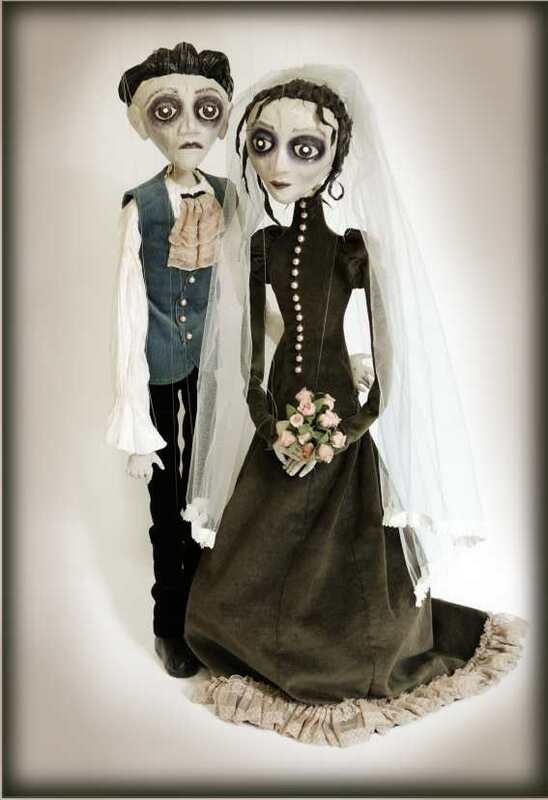 Speaking of portraits for the walls, I thought I should have some images of Velvetta and Mortimer on their wedding day. I made Velvetta a veil specially for the photographs. 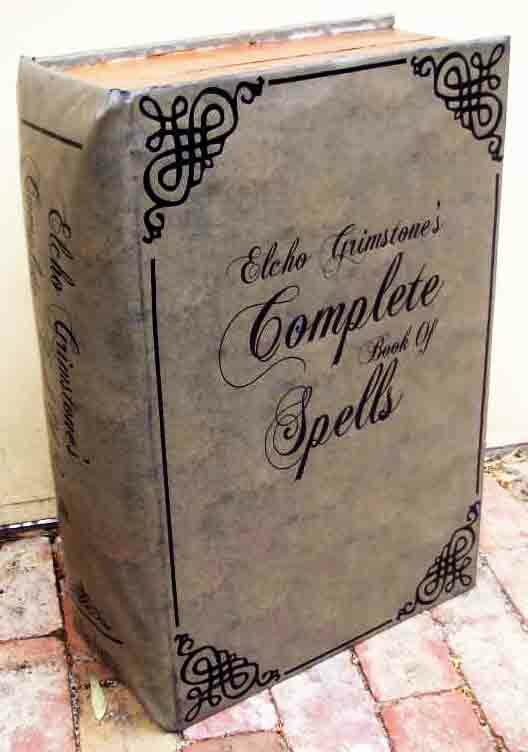 I’ve been making this spell book, which is Elcho Grimstone’s general reference book, to use during the show. 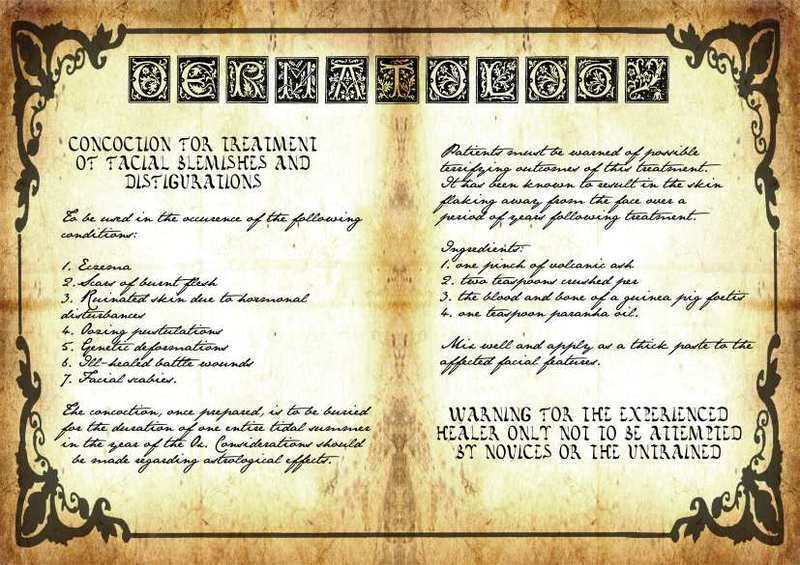 I’ve been having a wonderful time making up ancient-looking pages, and Paula is a fount of wonderful ideas when it comes to making up wordy old-worlde text. Here are some of the pages. We filmed a promo video for The Grimstones last week. It won’t be the final promo cos there’s too much missing, thanks to incomplete props. Ntennis, who got behind the camera, filmed it and edited it, did such a beautiful job. He told me after we’d filmed Velvetta mourning at the grave that he had tears in his eyes. I found that astonishing, but then when I watched the footage, by the very end I too felt a little teary – he captured her sadness so perfectly. I’m not sure if that comes across in the final edit – once we’d watched it a few times we’d lost any sense of perspective. He had a wonderful eye for how to light it. He put the lights in places I would never have thought of, and a whole new quality was lent to the images. Anyway, see for yourself what we made – and do tell me your thoughts! Yesterday I went to Savers, the equivalent of the op shop superstore. It’s a great shop because there’s so much stuff and it’s all so well organised. But I don’t know if I’m imagining it – have the prices gone up? Maybe I’m just spoilt after all the magnificent country op shops we find on our travels, where you can leave with a whole bag of goddies for a doller or two. Yesterday at Savers I came away with a fairly small and trivial collection that I paid $25 for! I was being non-consumerist and bought a man’s shirt to turn into a sheet for The Grimstones’ bed, but frankly at $4 for the shirt (the one I really wanted cost $7), I could probably have gone to spotlight and bought a whole metre of a fabric I liked more. I also found a few more miniature metal plates which I had already collected from a country op shop at 10c apiece, but which Savers charged a dollar each for. And so on in the same vein. I tried on a top that was so damaged from ruined elastic that it would need a lot of work to make it wearable, and the price tag was $5! I don’t think I’ll shop there any more. I did well while we were on the road though. 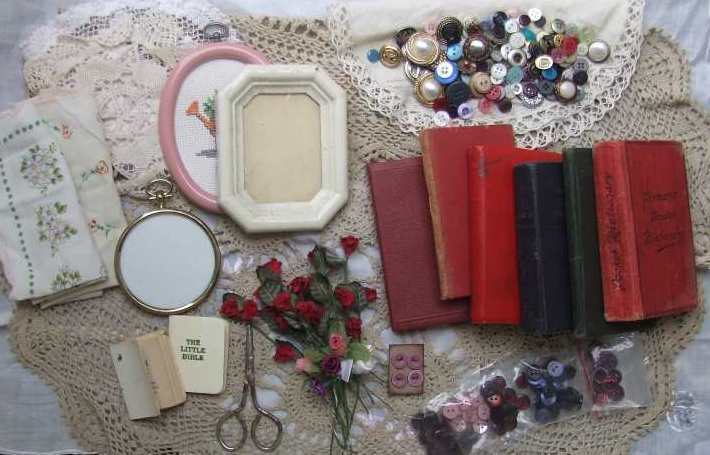 The above photo shows my pickings from just one op shop – stuff I collected for Velvetta’s sewing workshop. I was especially pleased with that little round gold frame, which I will turn into a clock. And the total came to a whopping $4. I’ve been having a wonderful time creating pieces that I’ll use for Velvetta’s workshop. 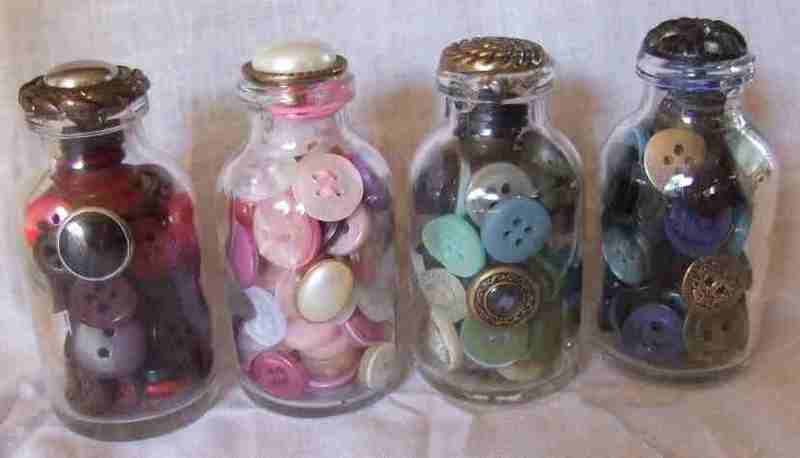 My favourites are the jars of buttons. I collected them in op shops, picked out the smallest buttons, and divided them into groups by colour. I’m so pleased with the result. 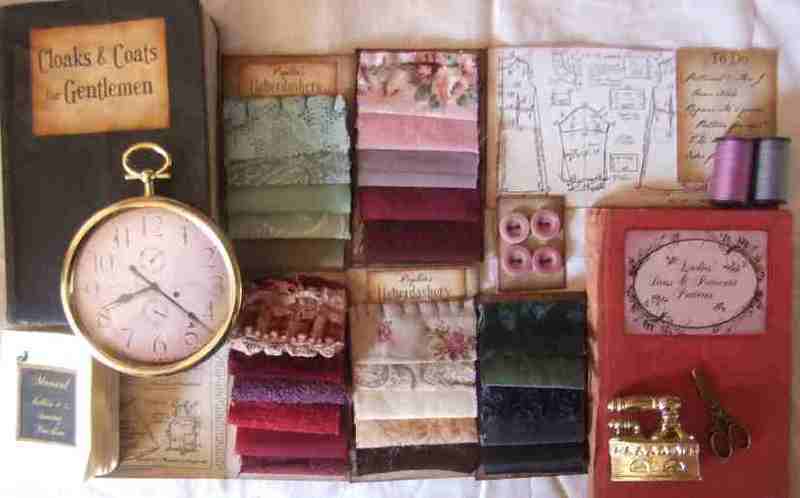 I’ve also made fabric swatches, converted miniature bibles into pattern books and sewing machine manuals, made button cards, a clock, a to do list, and several sewing patterns to tack to her walls. I’m a bit stuck on a pin cushion though. What I want most of all is one of those chinese ones with little chinese figures in a circle around a satin dome, but I’ve no idea how I’d find one of them in miniature. I can’t think how to make it either. I may need to come up with an alternative. In the meantime, I’m just waiting – sometimes things come to me. 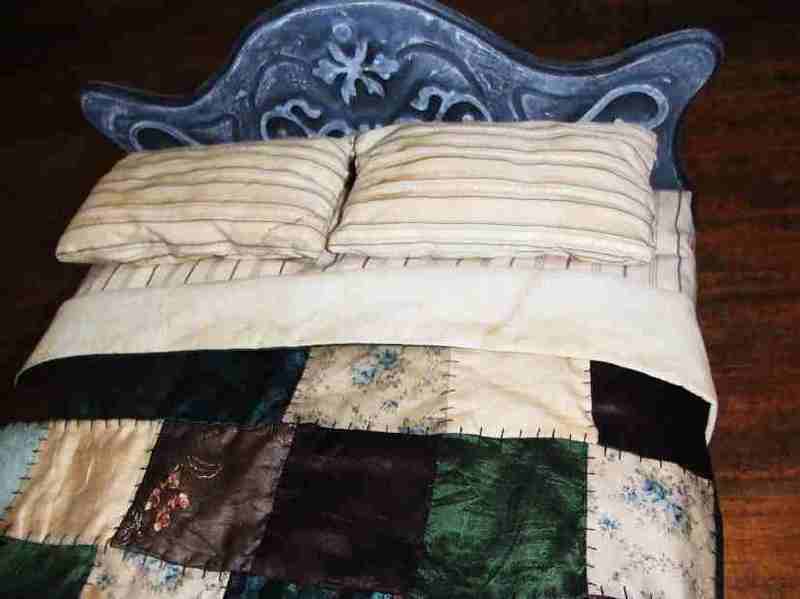 Finally, I’ve finished the bed for The Grimstones! I’m so pleased with how it turned out, especially that quilt, which looks so old, and yet looked so bright and fresh just last week when I pulled it out of my sewing machine. Happily coffee, an iron, and a lot of black hand-stitching changed that. It was hard enough coming up with the idea for the quilt – I could only envisage remnants of dark red, purple, maroon and black stitched together, but I’ve already created something like six patchwork pieces with that colour scheme and I really wanted to branch out from it a bit. Finally it came to me – muted browns and greens with a touch of blue. 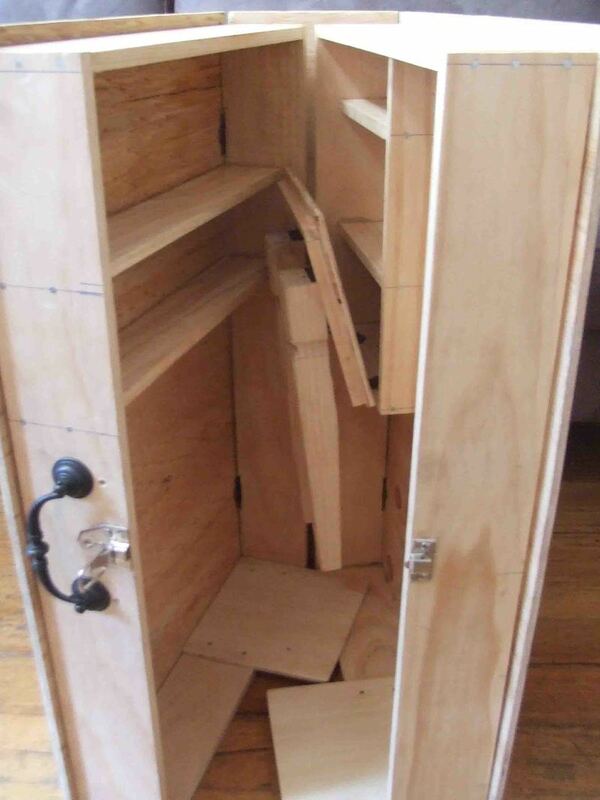 My challenge, in creating a bed for The Grimstones, was to make one that could fold up flat and fit inside the box that my puppets live in, but can be put together very quickly onstage, in front of the audience. I didn’t want to have any backstage “preparation” for this show – I wanted the audience to see everything. A method of putting together a bed that would hold well, but wouldn’t require any work with a screwdriver (too slow) was rather a pain to devise. My first attempt resulted in a very rickety bed which was no good at all. A builder who works for my dad had an idea though, and bought a few pieces including the magnetic clips that hold a cupboard closed, and attached them to my base. Ta da – the bed now holds beautifully. I began by painting it black, but it just didn’t look right. 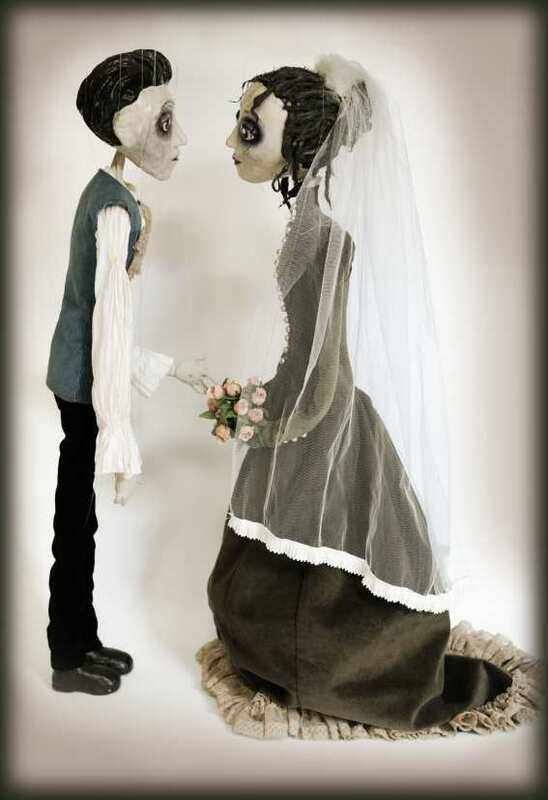 I remembered the paint job in one of the mansions in the movie Corpse Bride (I’ve been pausing these kinds of movies to look at details in the background and analyse how they were painted) – hues of grey. 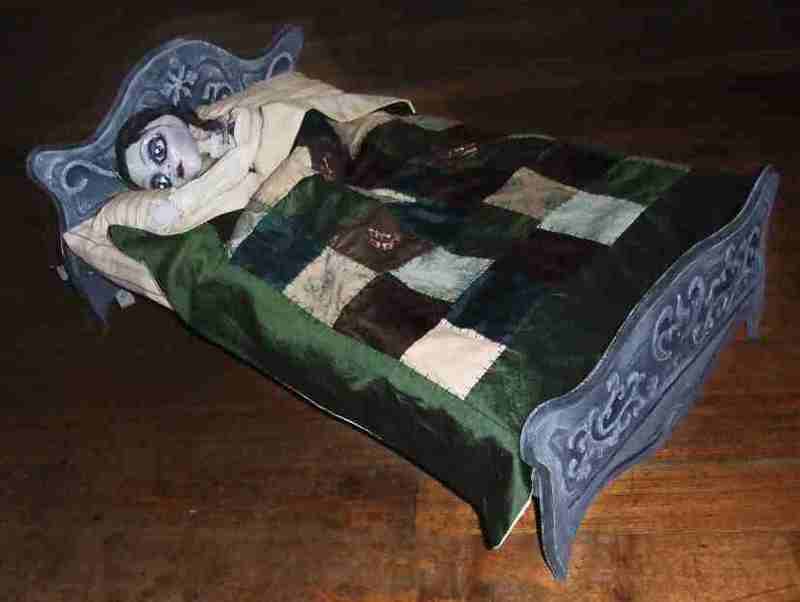 I glued cardboard curlicues onto the bed, and painted it with several layers of paint, ending with the hues of grey. Then I sanded back parts of it, and it looked just how I wanted. 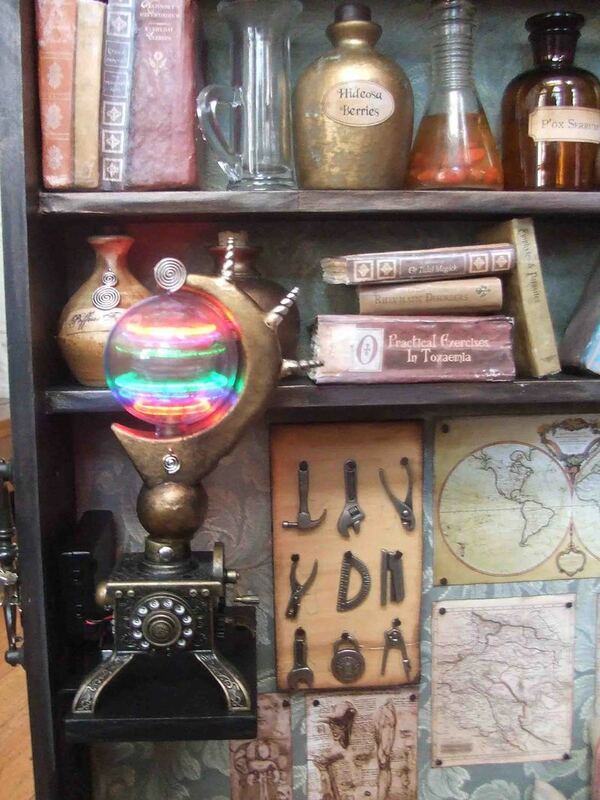 In The Grimstones, there is an egg, created magically by Martha, who sneaks into her grandfather’s lab in the night. The egg grows.. and eventually hatches. Inside is Crumpet Grimstone, the baby of the family. I have been procratinating from making this egg, because I haven’t quite been able to visualise all the technical details of my step-by-step process to make it. Last week I decided I’d better get to it, no more putting it off. 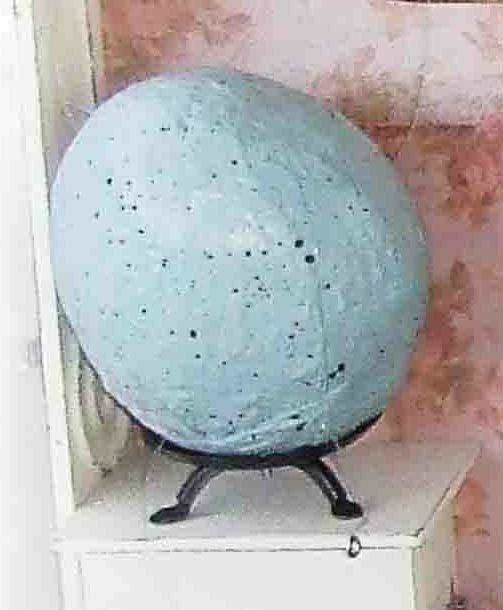 I sculpted a giant egg out of plasticine, and covered it with papier mache. 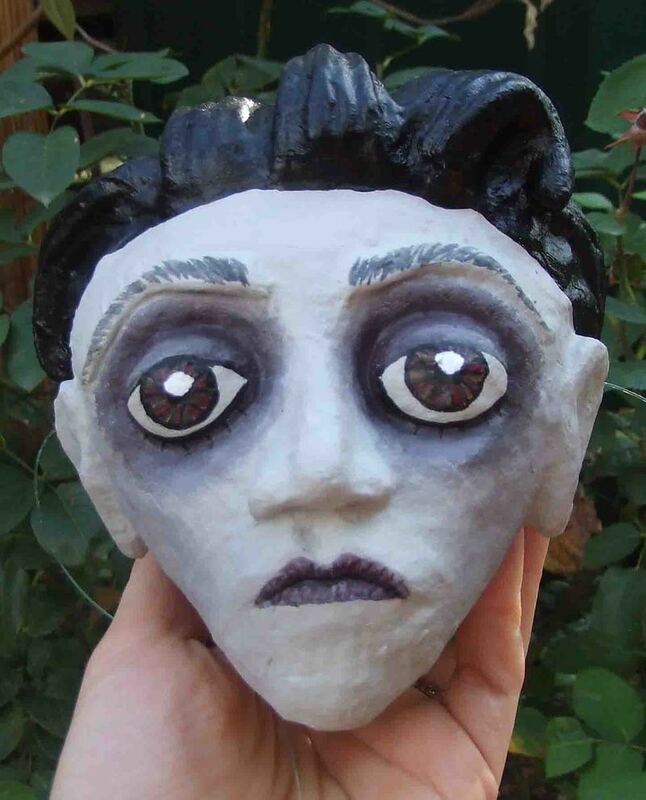 Last year when I was papier mache-ing all the puppet heads, I tried to encourage Jesse to do some papier mache with me, but he wasn’t interested. He seems to have had another of those developmental leaps while we were away, and this time he was right up for it. I made him a smaller plasticine egg and he sat there papering that while I worked. 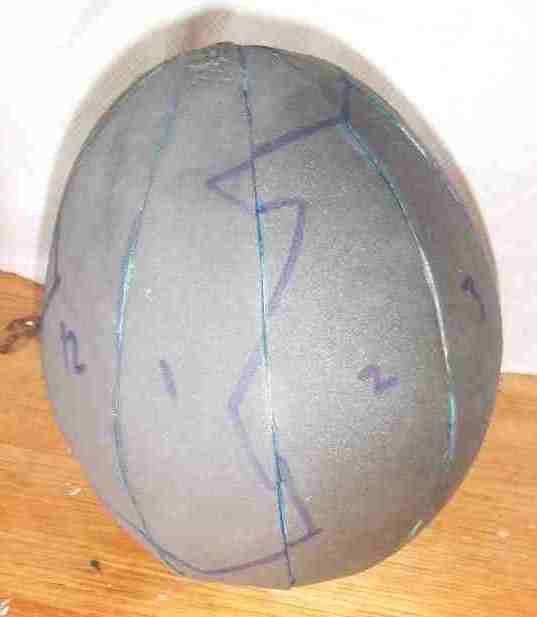 When the papier mache was dry I drew crack lines for a nice jagged edge. I cut the papier mache pieces off, following my crack lines. Now I had a thin, flexible shell. To strengthen it I smeared car bog (this is the filler panel beaters use when they fix dents in your car – it’s good because it’s strong and can be drilled, nailed and sanded) inside the shell, and then carefully held the pieces together so that they wouldn’t distort while drying. After twenty minutes the egg was looking good, all the edges met up nicely, I was happy. I went out for the afternoon, and when I came back, I couldn’t believe it – the damned thing had shrunk slightly! 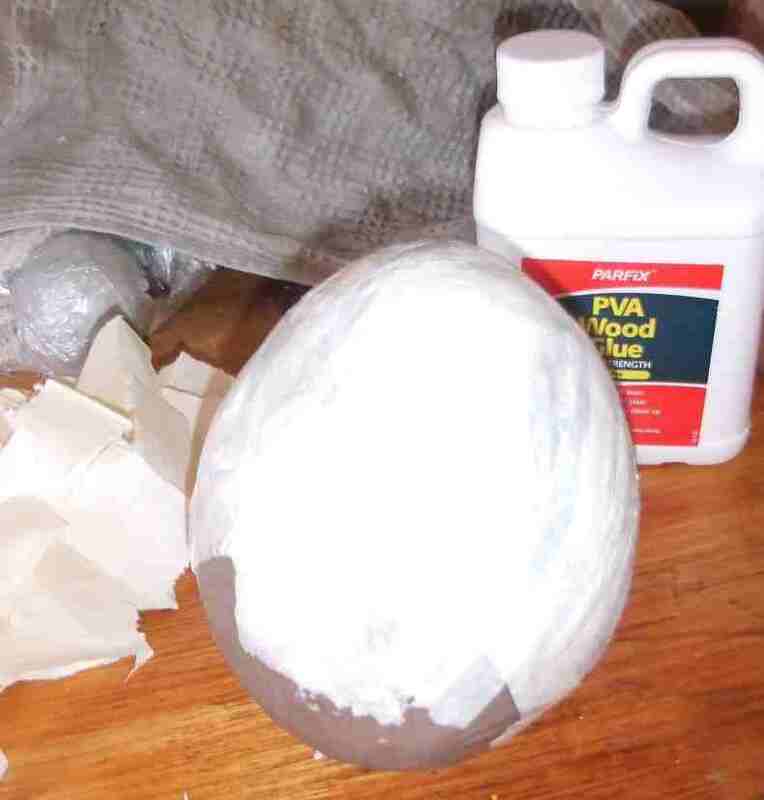 The individual pieces of “egg shell” had curled a little bit, and as a result, the egg no longer fitted together! Argh! And now you have it, the failed egg I referred to in my What I Did Today [ http://fixiefoo.typepad.com/fixies_shelf/2008/02/what-i-did-toda.html] post. 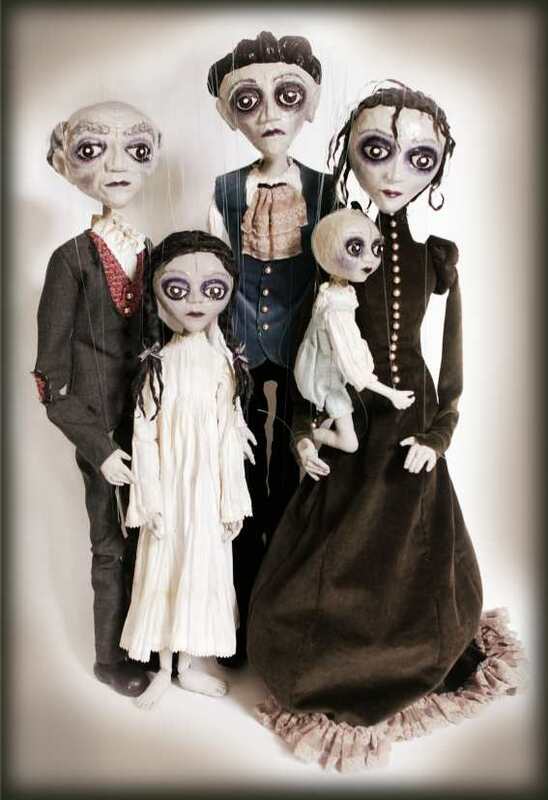 I am so happy to announce the preview for The Grimstones, a gothic fairytale told with marionettes and sign language. It’ll be at Northcote Town Hall, 189 High St Northcote, Vic Australia, on Saturday 3rd May, 2:00pm and 7:30pm. You can purchase tickets online here and collect them at the door. Tickets cost $20. Both shows are now sold out – many thanks to everyone who purchased tickets. And for those of you who missed out, we’re hoping to do the show again in Melbourne early next year, so keep an eye on my website if you’d like to come then. And now, back to the saga of the failed egg … My friend Andy rescued me, promising to introduce me to her friend Jade who is an industrial designer. I’d never heard that job title before, and boy I wish I’d known an industrial designer before I started The Grimstones. Andy told me an industrial designer knows how to design, cast, mould and make things like plastic containers, household goods and so on. That’s exactly the kind of information I’ve been needing as I make all the props for The Grimstones. Anyway, I visited Jade at her workshop, which absolutely delighted me. A room full of industrial sewing machines, giant heads of Easter bunnies still in production, and storage areas with foam and fabric arranged neatly. Jade showed me how they did the giant Easter bunnies. 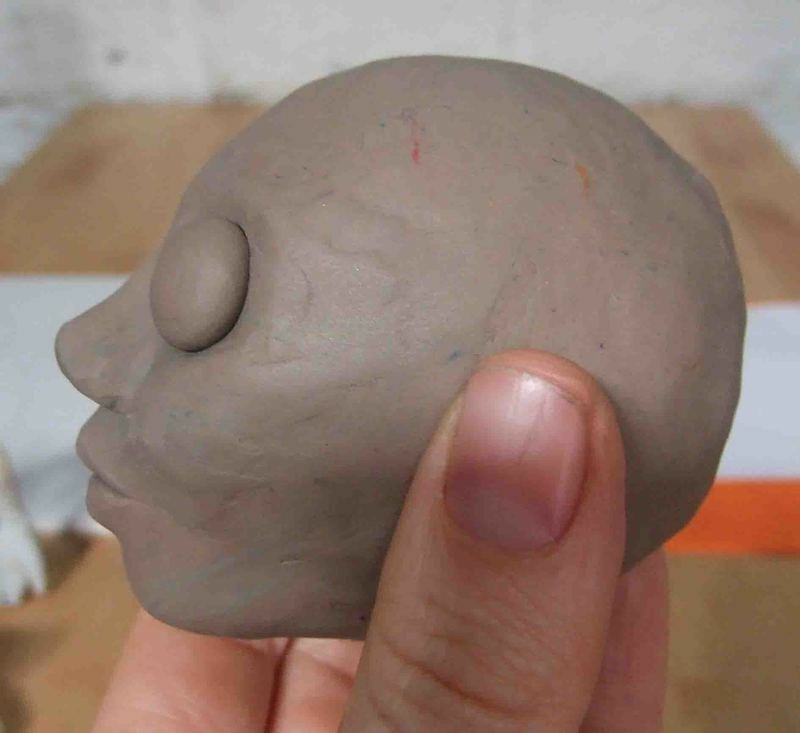 She sculpted a tiny rabbit head out of plasticine – actually half a rabbit head, which she pressed against a mirror to check it would look good when whole. Then she created a pattern from this by wrapping the plasticine in foil and then masking tape, and then cut off this layer in several pieces, to form pattern pieces that would lie flat. She then enlarged the pattern, and laid the pieces against foam sheeting. She cut out the pieces, and then used Kwik Grip to glue them together. Amazingly the foam pieces grip really well and create a nice smooth rounded surface, which is a giant rabbit head. Anyway, Jade’s boss, Gabe, suggested I use the same technique for my egg. I made the pattern as she suggested, then laid my pieces against a very thin sheet of foam, and used scissors to cut them out. Next step was to coat the whole thing in a plastic that dries very hard, and then cut it along the cracks so it can hatch. Finally I painted the whole thing a delicious speckled blue. 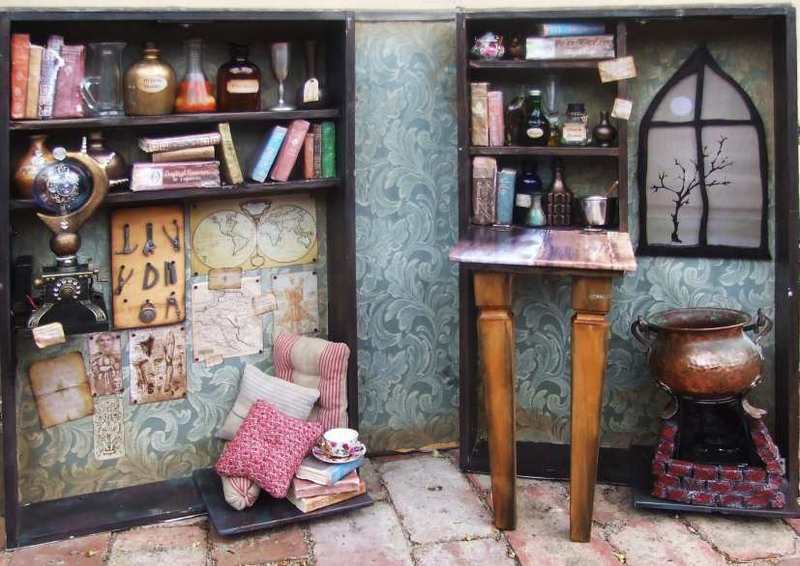 I’ve been glueing all these pieces into Velvetta’s workshop, and it’s starting to come together. There’s a few more finishing touches to add, such as I feel the dress on the mannequin isn’t quite right, and some minor things to glue down, but this is basically it. 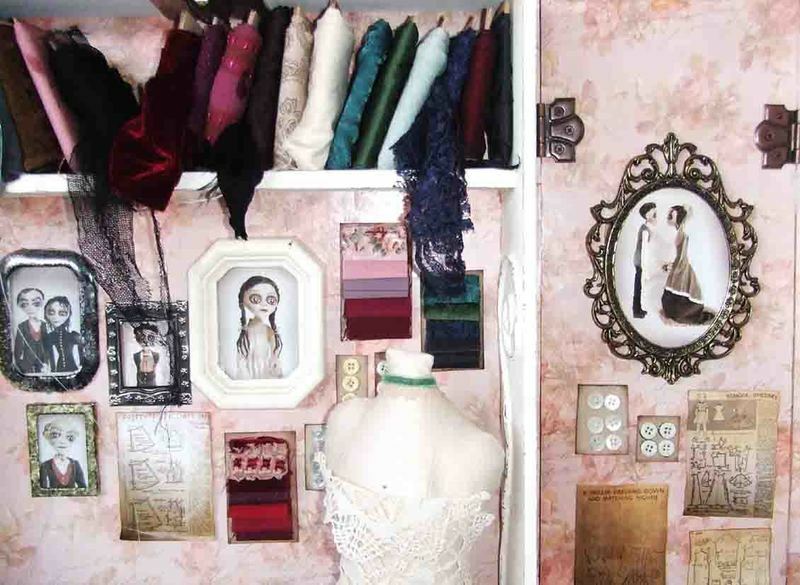 It’s my favourite of the three books – I’m such a sucker for all that sewing stuff – the buttons, threads, fabrics, laces… yum! I wish I could shrink down and work in there. Paula and I are rehearsing like mad, trying to prepare the show to launch on 3rd May. So much to do before the launch, it’s a bit scary. My props list is long, but I’m working through them faster than I expected so I may actually have a bit of leeway in there. There’s music to sort out – and meetings with our sound designer who is creating it for us. 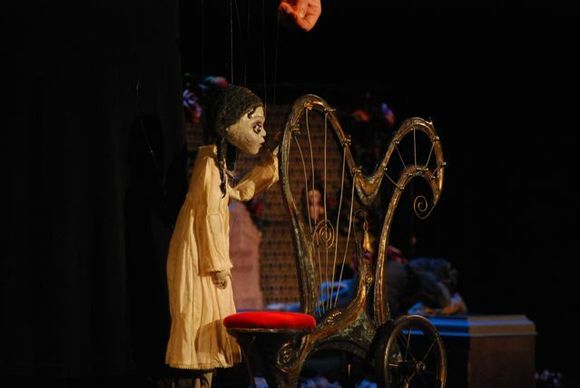 Paula is working hard to become a puppeteer – it’s a big ask to become professional in just a few months, and yet she is dilligently rising to the occasion. I spend a lot of time parked on the couch issuing instructions: “Eye gaze – make sure he’s looking where he’s going.. make him look down a little bit more so he’s looking at the baby.. yes, that’s it! Hang on, he’s sagging… stand him up straight. Now pull the neck string, that’ll make his posture look right. Yes, lovely!” And so on.. poor Paula, it’s not fun for her getting told what to do all the time. 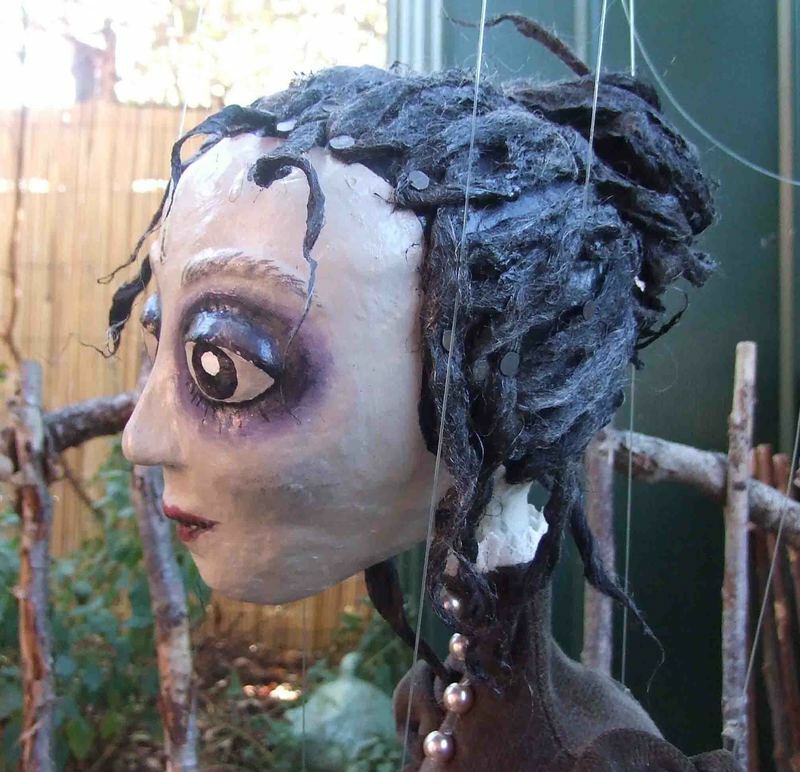 We’ve tried to find another marionette expert in Melbourne who can give her lessons so that it doesn’t have to be me, but no luck. 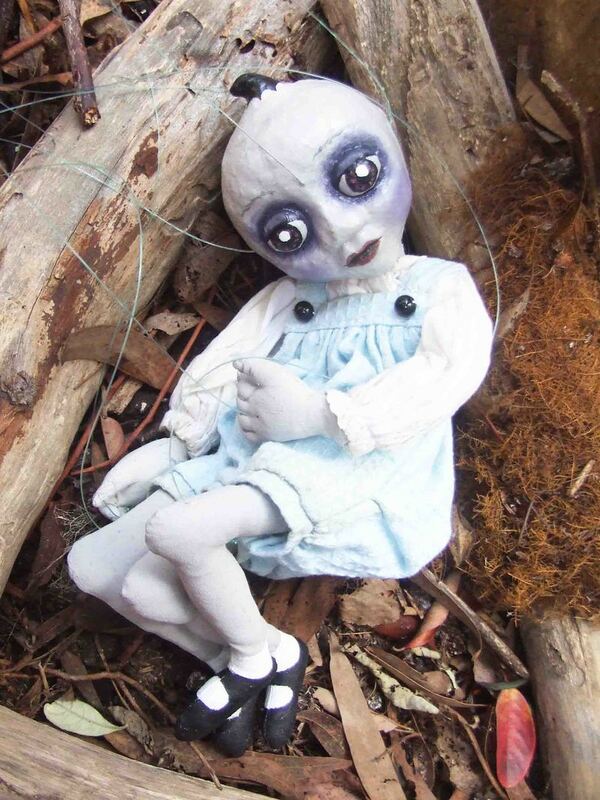 I’ve only heard of two other people in Australia who do marionettes, and they live interstate. I haven’t even been able to get email addresses for them. So Paula and I persevere, and magically, the puppets are starting to come to life in her hands. Every marionette sequence, which may take only a few seconds on the stage, takes us hours, even days, to choreograph, practice and perfect. 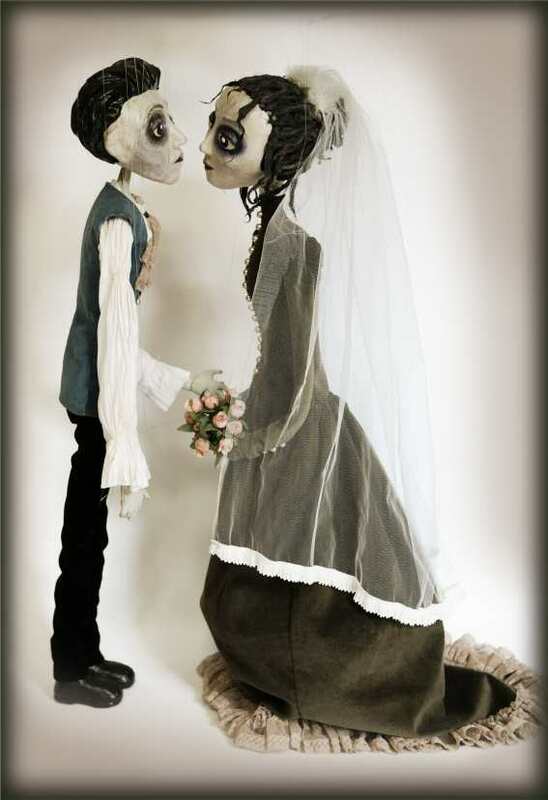 I first discovered marionettes in Guatemala, when we came across Sergio Barrio on the street and I was totally captivated. 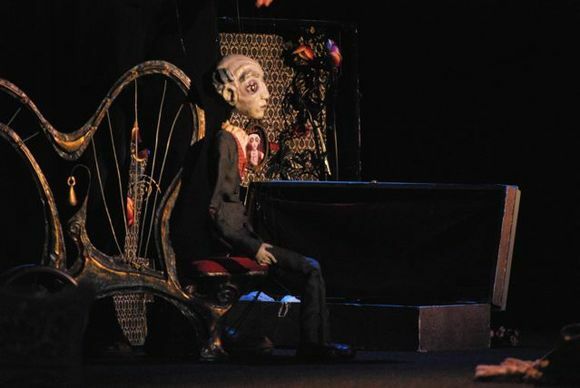 I’ve held that magic close to me and tried to recreate it in my own marionette shows. Sergio emailed me with this video of his puppets. I was so inspired and delighted to see them again – it’s just been a memory and a few photos that I’ve tried to hold with me through the years. At last I get to see them move again, but unfortunately it seems he filmed it in fast forward – I understand why: puppets move so slowly that on the screen it seems very drawn out. BUT I’m so disappointed – I’m longing to see exactly how they move, real time. Anyway, watch and enjoy. This is the most delightful tour I’ve ever been on. 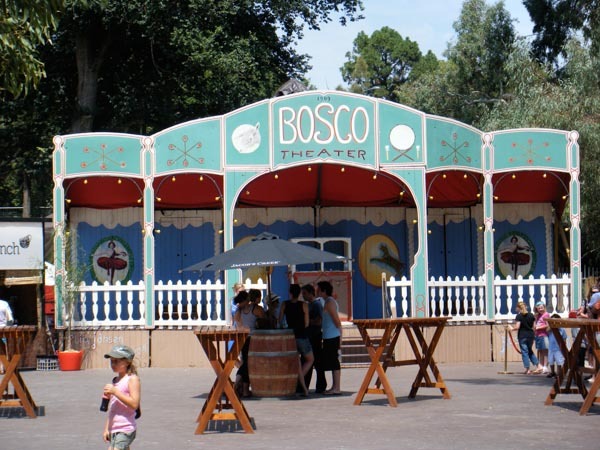 It feels like I’ve stepped back a hundred years, into a vaudeville travelling fairground, complete with several creaky vintage wooden tents, red and white candy-striped walls, red velvet curtains, a ferris wheel and even a freak show. This is where I work – The Garden of Unearthly Delights, the festival playground of Adelaide Fringe. Every day I ride my bike for about ten minutes past lovely Adelaide stone houses and through the botanic gardens, to arrive at the gate. When I arrive the place is dead, save for people unloading and setting up for the night to come. The place comes alive at 6pm, as the trees are lit up with beautiful coloured lights, the ferris wheel starts turning, and all sorts of vintage costume characters spruik their wares – we are among them. Paula and I get dressed in our gothic finery as August and Gertrude, and hit the garden to convince people to come and see our show. We hand out flyers, and every now and then someone says, “Oh I saw it last night, it was fabulous.” And then of course Paula announces in a loud voice to everyone nearby, “Did you hear that? She said it was fabulous! She thoroughly recommends The Grimstones.” Each night in the audience we see several people we’ve tried our luck on, so we know it works. Our tech crew is fantastic, and we are having a nice time getting to know the boys from Sherlock Holmes, the show after ours – we spend a fair bit of time rubbing shoulders in the dressing room so it’s good to feel friendly with them. After we’ve taken our bows for our show, we head straight out the front door with our case of books, and start selling them. I’m getting better at this too – as people walk out the door, if they meet my eyes I ask if they’d like a look at the book. Soon we’re surrounded by people leafing through them, and invariably several decide to buy – then it’s a fast juggle of money, book signing, friendly chatter and still trying to keep an eye out for other potential customers. Paula and I are a pretty good team now. Once we’re all packed up, the festival is in full swing, and with a simple flash of our artist’s pass we can get into any show for free. We’ve been making the most of it, taking it in turns to stay late and see shows. In my case it’s a little tricky working out which are going to be suitable for Deaf people – sometimes I luck out nicely, but last night was full of shows with talking, a bit of a disappointment for me. And then it’s a gorgeous bike ride home, and I always feel like I’m flying. Home is Adelaide Caravan Park, nestled right next to the city, but peaceful with beautiful trees and a nice sense of community. Most of us are here for the festival and it feels very friendly to get to know our neighbours. Last week we were working full days, with tech runs, extra school shows, and late night appearances at VIP events – exhausting. This week however is lovely, and we are just doing our 6pm show. You might think that leaves us with all day free, but actually we only have the morning. At 2pm we settle down for a nap, then head into the festival to get ready for the show. The morning is taken up with admin, grocery shopping, filling the gas bottles and other odd jobs. And in between, I work my journal or make art. It’s lovely, a beautiful lifestyle. I do feel as though I’m living in a bubble though, without much contact with the real world. It’s an easy delightful bubble and I love it in here, though part of me is a bit spun out by how surreal it is – I wouldn’t mind touching some “real life” at some point soon, just to remember what it’s like. In the meantime though, I’m blissing out! We’re on the road again – this time to Newcastle and Gosford. Actually we’ve hardly touched home since I last wrote on my blog – we’ve done shows in Adelaide, Melbourne, Warragul, Geelong and Pakenham as well as on this current tour. I’m definitely getting the hang of this and I’ve got my packing down pat. I have what is basically a giant handbag, in which I keep everything I need, both to entertain myself and remain healthy. It’s got my computer, a book to read, a folder of work papers, a pencil case and my journal, a toilet bag with my nightie and some spare underwear, and a bottle of beetroot kvass. With this bag I can go anywhere for any length of time. I bring it to the theatre, and it only takes a minute to pack it at the hotel, whether we’re going for the day or moving on to a new destination. Then I’ve got my lunch bag, a little insulated package which holds all the food I need for the day – bottles of cultured milk, kimchi, homemade energy snacks, fruit, and a decent-sized meal too. I bring my own cutlery and have cut down a tiny chopping board to slip inside my pack along with a sharp knife. This way I can make myself breakfast, chop up fruit and salad, and make sandwiches anywhere. It might sound excessive but when there’s four of us in a motel room that provides no facilities, it ends up that we all take turns to eat breakfast, using the one spoon I brought. I like the life. I get a feeling of calm descend over me as I sit in front of the mirror, twist my hair into the impossibly complicated chignon required for my character, Gertrude Grimstone, and apply my make up. I enjoy chatting with Paula between shows, and hanging out with her in the dressing room. I like having a good stretch each day, and I really love having a chat with people from the audience after the show. It gives me a real lift to see how many of them are touched, or even blown away, by our little show. 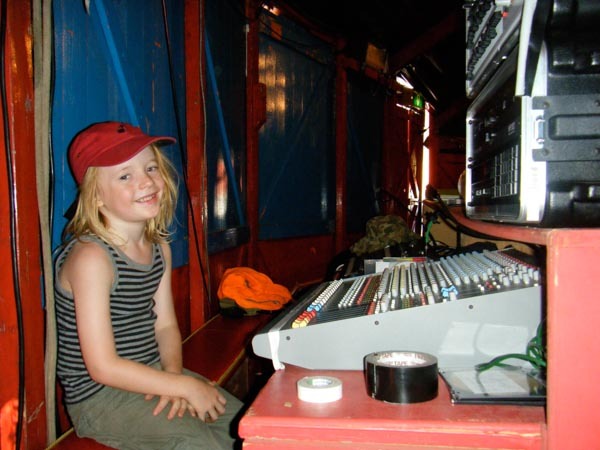 We meet such interesting people too – sometimes the techs or front of house staff tell us amazing stories about their lives, and other times it’s those in the audiences who tell us their dreams and inspire us. We’ve met some other homeschooling families on this tour and their kids are so lovely and easy to relate to that it’s very inspiring for our own homeschool journey. We ended up totally stuck for a nanny to look after Jesse on this tour. Despite our repeated efforts, we just couldn’t drum up the right person. Jesse was also feeling desperate for more time with Paula and me after being away from us a touch too long on the previous tours. So he was very happy when we announced he could just come to the theatre with us. 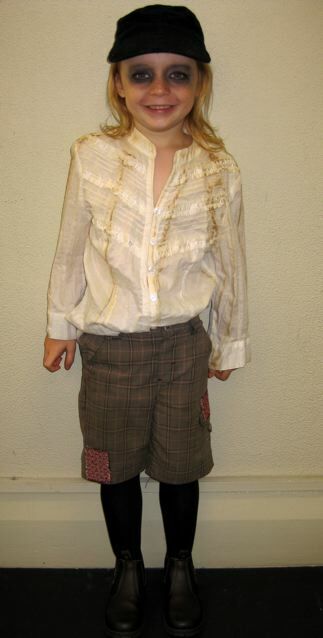 In fact, he made his debut performance! We assembled for him the most adorable costume, rubbed dark shadow around his eyes, and welcomed him into the Grimstone family. He did very well actually – he must have absorbed a fair bit about the process simply by being in the room with us as we rehearse and perform the show. His acting was pretty good for a 5 year old, and he had his own ideas about his role and how he should play it, which were great. And then, when the crunch time came and he had to step out in front of many watching eyes, he did so, totally calmly and professionally. What a trooper! We worked out a system for him to keep him happy and occupied while we worked, and I made him a checklist to tick off when he’d completed each item. First up he had to warm up, get into costume, and have his make up done. 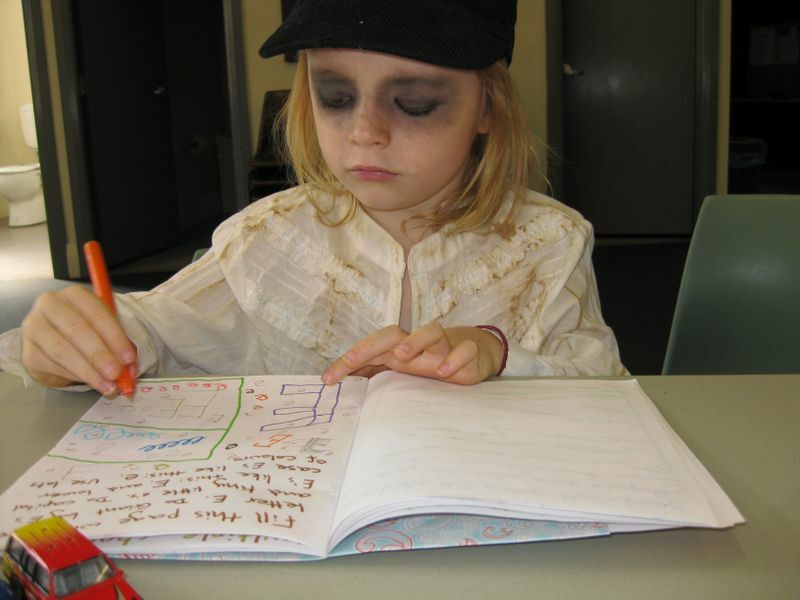 Then he’d sit down at the table and enthusiastically work on his workbook while Paula and I prepared for the show. He’d read in between his appearances during the first show. One of us would play something fun with him afterwards, and then there’d be a bit more work as we help him again with the workbook. He had a jigsaw puzzle to do most days, a CD to listen to, and then we cheated and put on a kids’ DVD while we performed the second show on our own. In the afternoon one of us would take him out for an activity – to the beach, or down to the gym in the hotel, which he loves. I have to say, this worked very well – and at the end of each day he was very happy and contented. 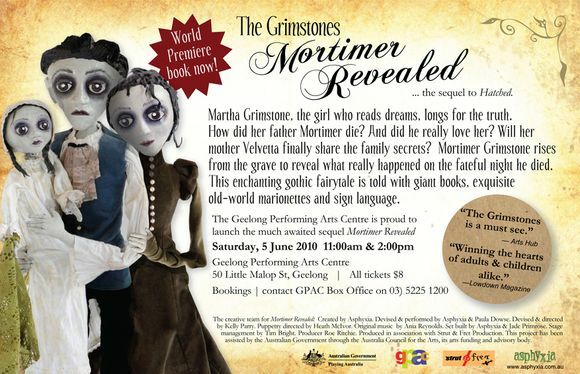 This week we’re performing The Grimstones at Victorian Arts Centre. When I was a child my mother used to take me there to see The Australian Ballet. We used to drive past the Stage Door and I’d see the ballerinas arriving for the evening – and I used to have these fantasies that one day it would be me arriving at the Stage Door. Now it seems my dream has come true, as every day this week I step through the Stage Door myself, sign for the keys to Dressing Room number 43 (can you believe there can be that many dressing rooms in one building?! ), and then wend my way through a very complicated maze into the bowels of the arts centre. We’re having a fabulous time – the staff are all so friendly, the audiences are big and enthusiastic, and the venue is so very comfortable. The only thing is, I feel like a bit of an imposter. Like we’re not really supposed to be there. Like our show isn’t really of the mythical, magical and miraculous standard that shows at the Arts Centre should be. And unlike those ethereal ballerinas I used to watch on the stage when I was a child, Paula and I are very much mere mortal humans. Or is it all just a trick of the eye? Did all those ballerinas of my past also feel like imposters? I would love to know. But something lovely happened today. We were visited in our dressing room by Emer, who has booked us to perform public shows there next year as part of her kids programme. Talking to Emer it became clear she thought us anything but imposters. In fact, she was toying with many ideas for how she can present the show in order to do it justice, to get the very very best from it, so everyone can fully appreciate the miniature world we’ve created. Well that made me happy! And for those of you who are waiting and waiting for the public shows right in the heart of Melbourne, the tickets for this show will go on sale on 25th November. Emer is keeping the shows small and intimate, and we’re only doing four shows, so there won’t be a lot of tickets. If you’re keen to come, make a note to ring up on the 25th and book your tickets! 1300182 183 or on their website. We’ll be performing at 10.30am and 2pm, and teaching an Auslan workshop at 12 noon on the 13th and 14th February 2010. At long last we are launching our next show of The Grimstones. It’s scary stuff, we are rehearsing like mad.. but hopefully it’ll actually be ready in time! I’ll be back soon with photos of some of the props I’ve been making. In the meantime, check out the newest puppet I’ve made in the photo. Martha when she was a baby. She’s a sweetie isn’t she? I haven’t written for a while. Life has been very epic, what with launching our new show, Mortimer Revealed, and then going on tour almost straight after. When I got home I collapsed in an exhausted heap, my brain to bleary to even deal with my emails. I’ve just had a week at the beach, my head has cleared, and I’ve done all sorts of delightful creative projects that have soothed my weary self. And suddenly now, my head is clearing, my energy is coming back, and so is my inspiration. I’m planning all sorts of posts about what I’ve been up to lately, so stay tuned. But first, I wanted to share with you The Epithium, the magical harp-like instrument created by Mortimer Grimstone in our new show. I envisaged this instrument years ago, but the time hasn’t been right until recently to make it. It’s undergone a few reincarnations, as when it was first “finished”, I thought it didn’t look like the fine instrument I’d envisaged, but a prop for a show. Well, ok, it IS a prop for a show, that’s true, but what has always felt special to me about The Grimstones is how I’ve strived to create a real world in miniature, so real that it’s kind of hard to believe the things aren’t actually plucked from real life and somehow magically shrunk down. I just wasn’t happy with it. Finally, in the last couple of weeks before we launched the show, I managed to come up with a few ideas for how to fix it, and I’m rapt with how it turned out. It took a few days to sand it right back and remove the gaudy black-and-gold. I then painted it with a mix of bronze and gold metalic paints, adding black and green patinas as I went to make it look magnificently aged. 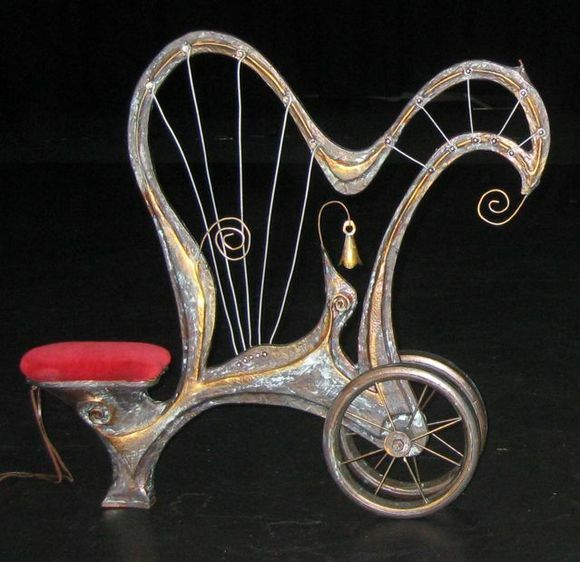 It isn’t entirely my work, mind you – Jade Primrose, my lovely friend who has been helping me to make props for the show, made the basic structure from my design, built up the delightful “heel” under the seat, attached the wire strings, and covered the seat with plush velvet. I just did the finishings. 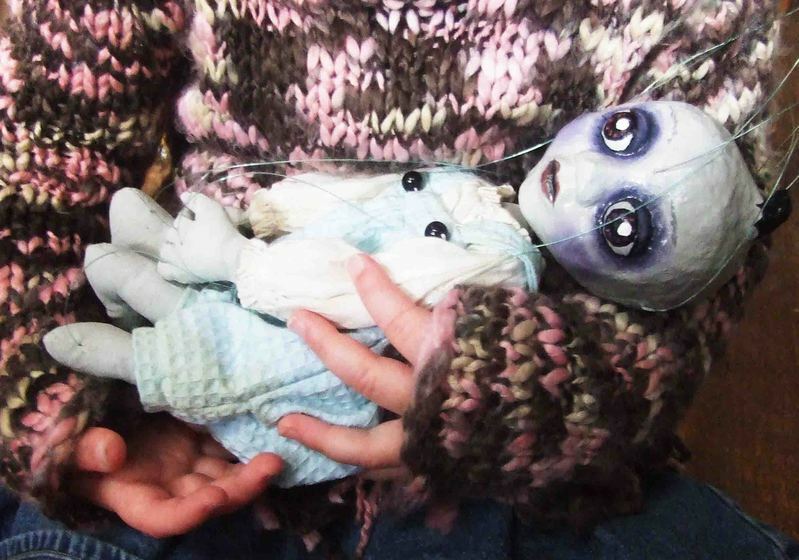 I’m working with baby Crumpet, assisting him to cast a spell that will help Martha Grimstone find out what really happened to her father. Elcho tells Mortimer that a terrible storm is coming. 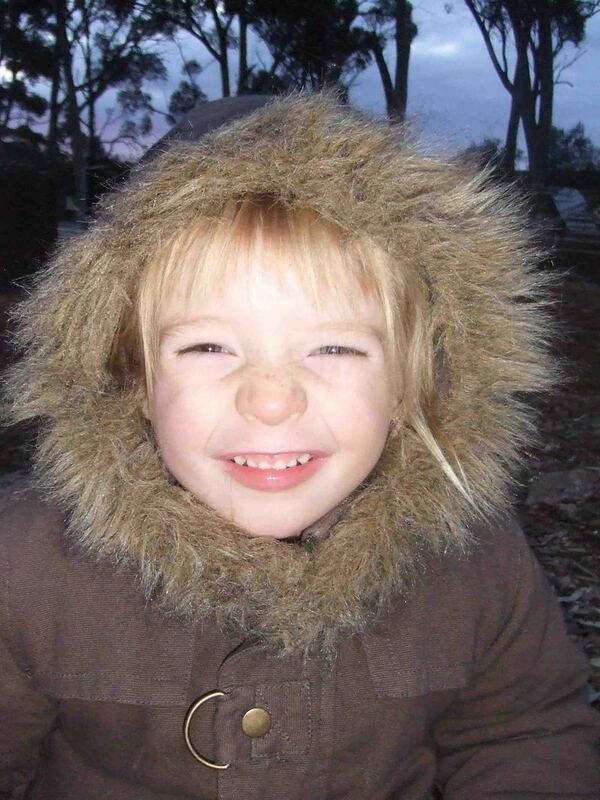 Martha discovers her father’s magnificent instrument – the Epithium. The Grimstones – Hatched… book is nearly here! Guess what I have in my hot little hands? The very first advance copy of my book! Yes – the 128 page full colour book that tells the story of The Grimstones – Hatched, published by Allen and Unwin. O I can’t tell you how good it feels to hold a book with my name on it. Not only that, but it looks stunning! Really fantastic, in a way that I couldn’t imagine even from the mock up copy I’ve been toting around. The cover is glossy and embossed and utterly gorgeous. Jenine, our fabulous designer and my very dear friend, has made us proud. The reason it looks so great is because she’s filled it with fantastic images, has laid it out exquisitely, and added surprising little touches on almost every page. The Grimstones: Hatched is on the bookshelves! It’s been one of those days where good things have happened. My book, The Grimstones: Hatched, has landed in bookstores. 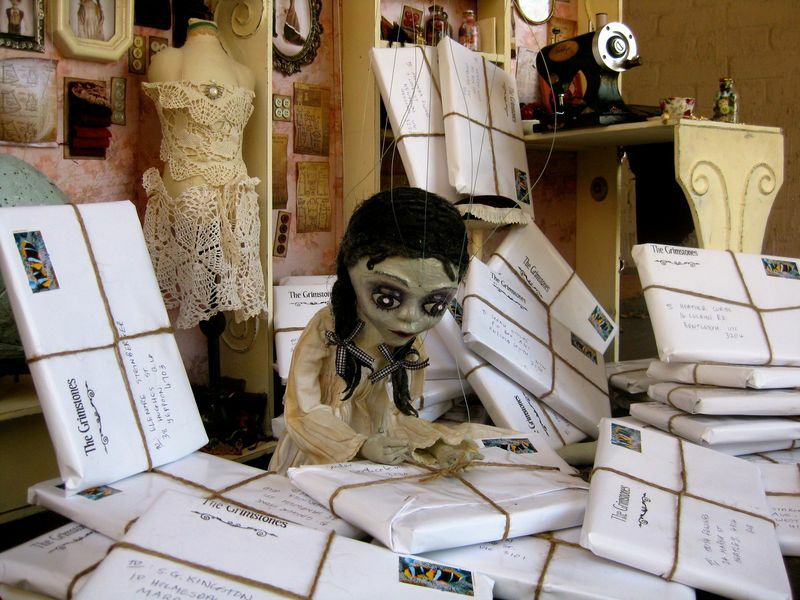 You can see Martha Grimstone tying the string on all those packages of books which she sent out. Quirky, original and expertly crafted The Grimstones is just the sort of book that My Book Corner adores. A gothic fairy story which is gentle and heart warming with a sprinkling of magic. 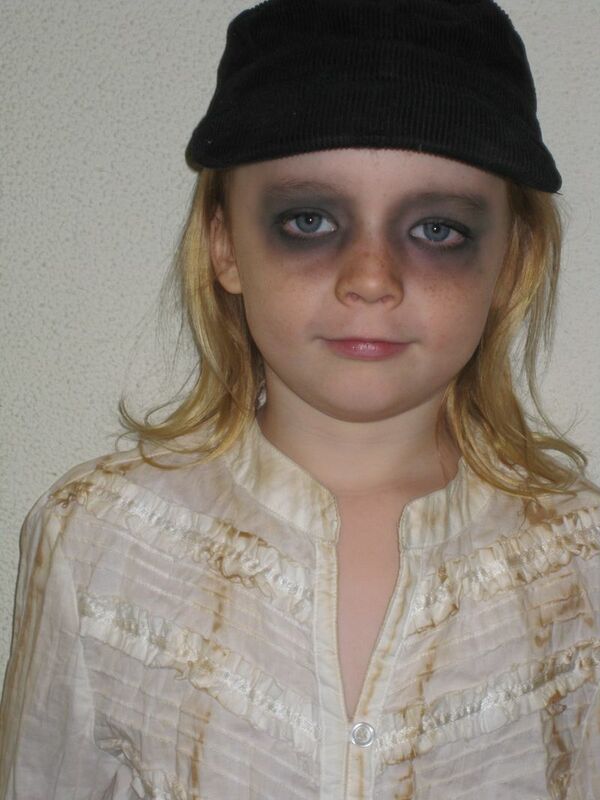 The Grimstones is told by the spirited and inquisitive character, Martha. 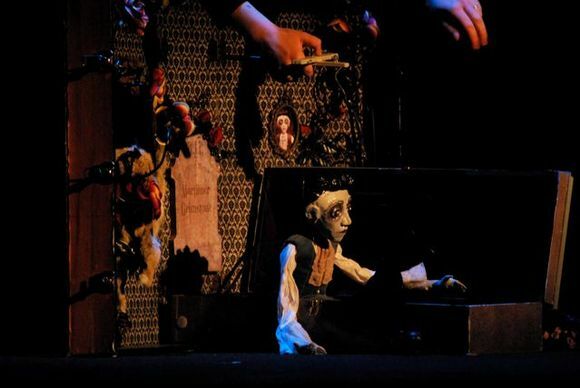 The Grimstones originally began as a puppet show – infact these theatrical productions have (and still are) touring Australia and overseas. As a result the engaging text is interweaved with the most amazing images of the puppets and the miniature world they inhabit. The imaginative way in which this great story is pulled together will have you hooked from the moment you open the first page. Asphyxia keeps true to the diary format – Martha’s hand drawn images are ‘taped’ on to her diary pages, photos pinned on with photo corners – thus she shapes a visual delight filled with creativity. The appeal of The Grimstone does not lie solely in its visual appeal. This is an expertly crafted novel, with an original and intriguing plot focusing on Martha’s creation in Grandpa Grimstone’s apothecary. The language is delicate and descriptive, accurately capturing the character of Martha and her observations of those around her. 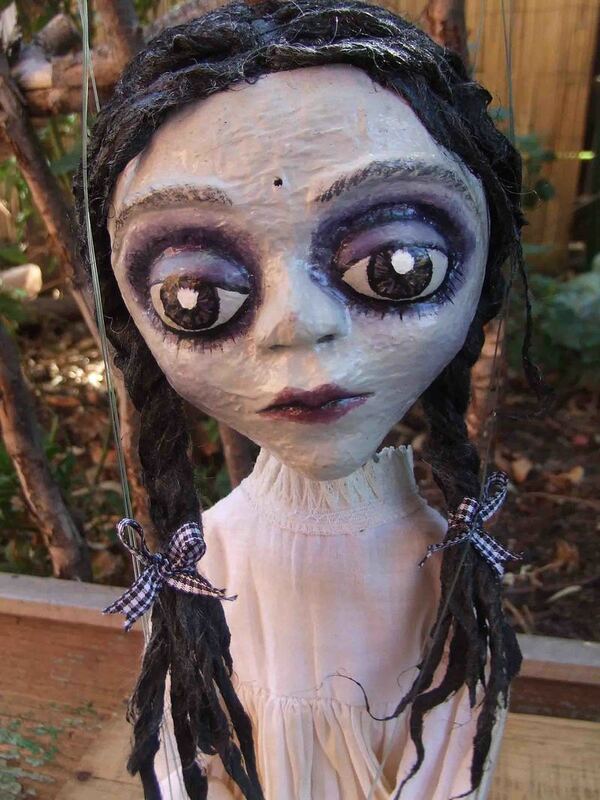 With her thoughts and feeling laid open, Martha quickly become a character to adore. 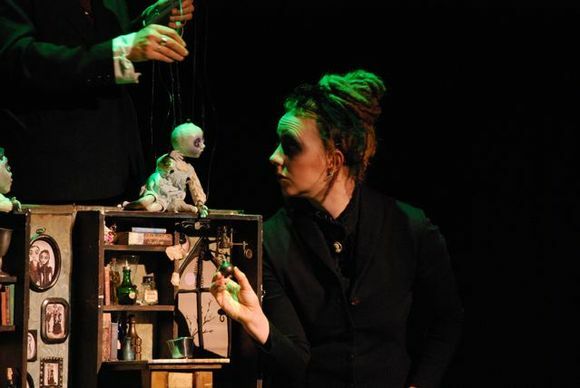 Asphyxia herself is a talented and creative individual with a past history as a ballerina, circus performer, a puppeteer and now a creator of theatrical productions … plus we are thinking author can now be added to that list! With her puppet shows carefully integrating Auslan their visual appeal is not to be underestimated – check out that you-tube clip! 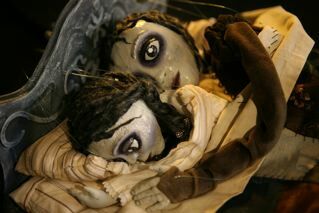 Hatched will be officially launched on 26 Feb 2012, offering you a chance to see the puppet show for yourself at the Victorian Arts Centre. My Book Corner is also very excited that April 2012 will see the release of the second book in this series … Mortimer Revealed. The Grimstones: Hatched – preview! It’s been a while since I’ve blogged. The little chickens I posted about last time are big and fat now, and next weekend is going to be D-Day. 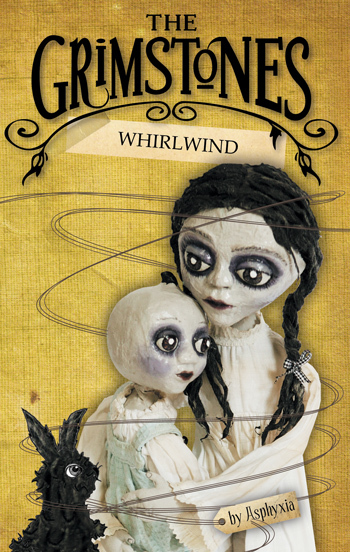 In the meantime, I’ve been very busy with the third book in The Grimstones series: Whirlwind. I went away with Jenine Davidson, my very dear friend and co-illustrator, for an illustration retreat. It was bliss, heaven.. a perfect bubble of art, as we illustrated by day and journaled by night. I didn’t want even a second out of that for anything extraneous, such as blogging! Anyway, here it is, the cover we created for the new book. It’s coming out in December, just in time for Christmas. And it’s about topics very dear to my heart, such as rabbits, spinning and sustainable textiles.. though they didn’t say “sustainable” back in the time of The Grimstones…. 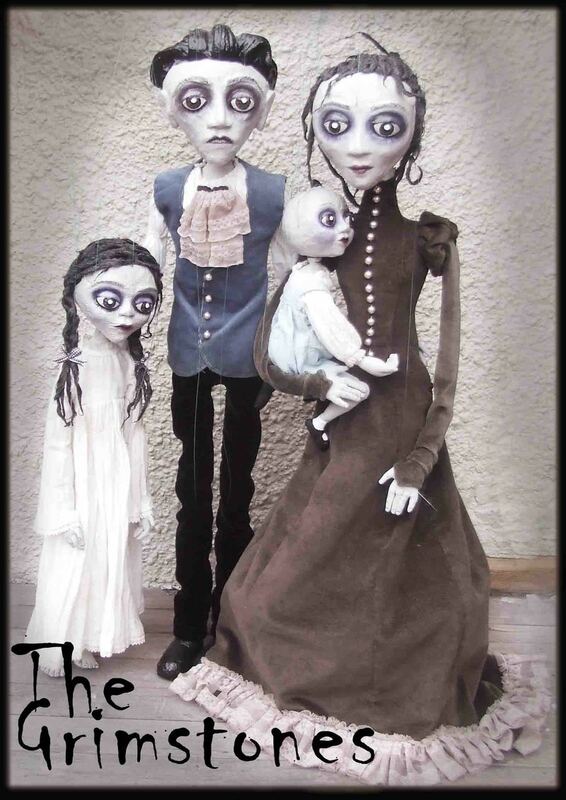 It’s been a while since I blogged about The Grimstones, my family of gothic marionettes, who started out as a theatre show and are now featured in a book series. The first two books, Hatched, and Mortimer Revealed, came out earlier this year, and I’ve spent a good chunk of the year working on the third book, Whirlwind, which is due out in December. I’m now thrilled to have been asked by our publishers, Allen and Unwin, to write a fourth book in the series. With the first three books, I worked very closely with their editors to develop the plot and writing style. 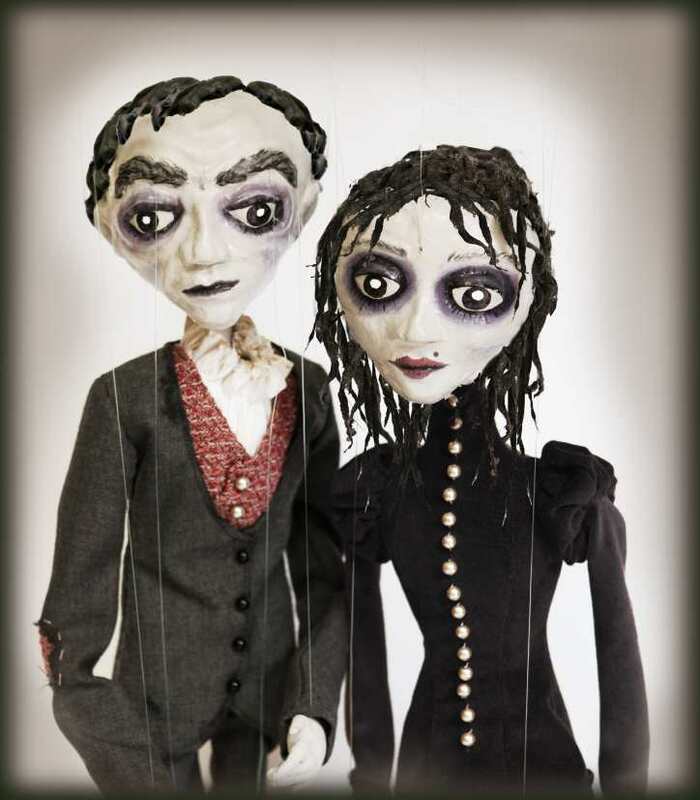 The Grimstones started out as a stage show, in which I and my partner Paula perform, along with the puppets, which I made. Moving the story from stage to book has been a big journey, and very fun, as I’ve got to go far deeper into the world and characters of The Grimstones than is possible from the stage. I’ve also had a massive learning curve as a writer, and have loved being the recipient of writing/plotting tips and advice from some of the world’s best editors! What I’m excited about right now with the fourth book, is that I feel I’ve learnt so much from A&U editors, that I’m ready to fly solo a bit more, and work on my own to develop the plot and characters as needed. Martha Grimstone meets a lot of new characters in this book, and I’m having a particularly marvellous time making them up. When I head off on a big bike ride, I set myself a couple of questions beforehands to mull over as I ride, and I’m finding that way I’m slowly piecing together the people and the story needed for the book. We are still touring the puppet shows of both Hatched and Mortimer Revealed, but after 5 years of heavy and gruelling touring, Paula and I are ready to call it a day. I find it very hard running my garden and sustainable lifestyle when we are constantly leaving to go on the road, and it’s harder for our son Jesse to maintain connections with his people when he has to disappear from their radar all the time. Touring, while it sounds glamourous, is stressful and very hard on my body. The puppets are heavy and performing with them gives us both a lot of back pain. This year Paula and I have tested the waters by scaling back our touring significantly, and it feels really good. We’ve had to make some pretty big cuts to our lifestyle to cope with the reduced income, but they feel worth it. I’ve had more time to do creative things (hence all my art study, which has been posted on this blog), and more time and energy to put into homeschooling Jesse. Despite ending our lifestyle as touring performers, we still need to travel a lot for work, giving author talks at writers’ festivals around Australia. Martha Grimstone travels with us, and when I give my talk she makes a small appearance. This kind of mini-performance is much easier for me, much less stressful, and I’m finding I’m really enjoying giving the talks and meeting readers of my books. So even if you haven’t managed to see the theatre shows of Hatched and Mortimer Revealed, you can still meet Martha in the “flesh” if you come along to one of my author talks. I’ve been working and working on the fourth book in the Grimstones’ series: Music School. 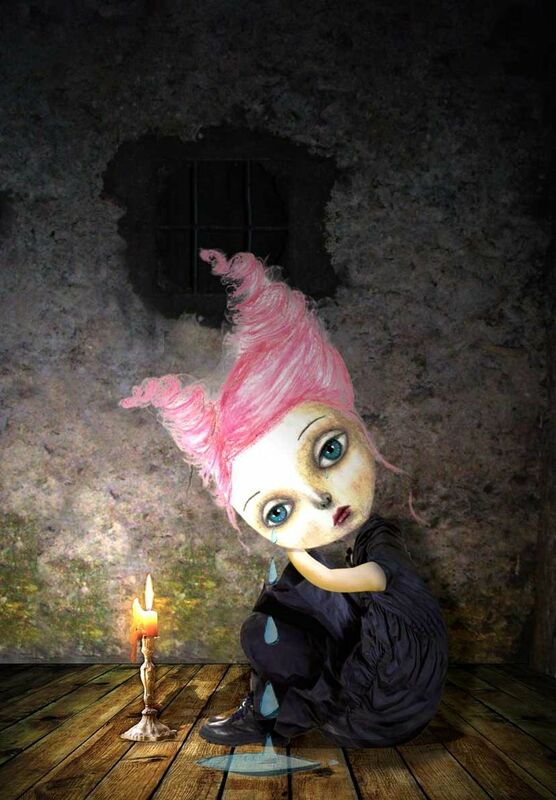 Here’s my very favourite illustration – a new character called Viola Verlene who I am absolutely in love with!